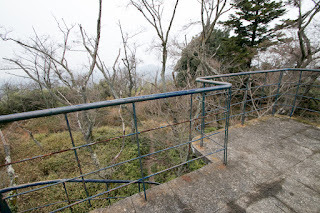 Tsuneyama castle (常山城) is built at the top of Tsuneyama mountain, one of about 300 meter height from hillside. 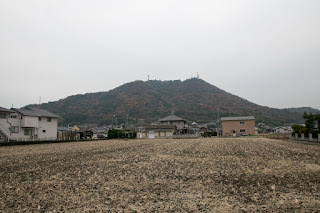 Tsuneyama mountain is a beautiful independent peak at the center of the mountains of Kojima peninsula which spreads like U letter at the southward of current Okayama city. 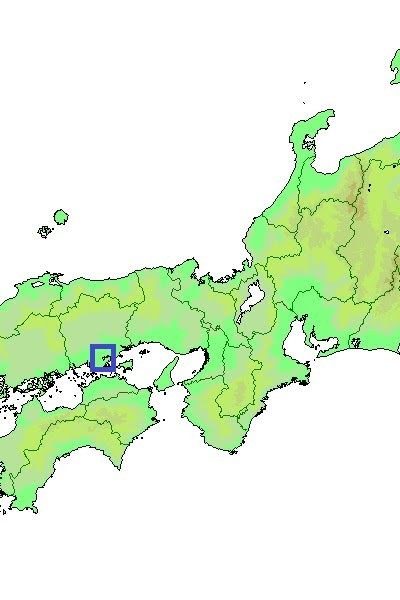 Currently Kojima peninsula is connected to the mainland by flat reclaimed land, but prior to medieval era a large gulf spread between Okayama city area and Kojima peninsula. 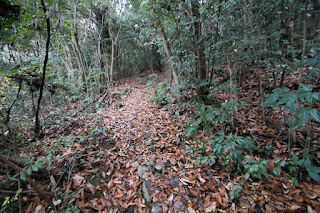 Furthermore, in the ancient era Kojima peninsula was separated by the sea and an independent island at Seto-Naikai sea. 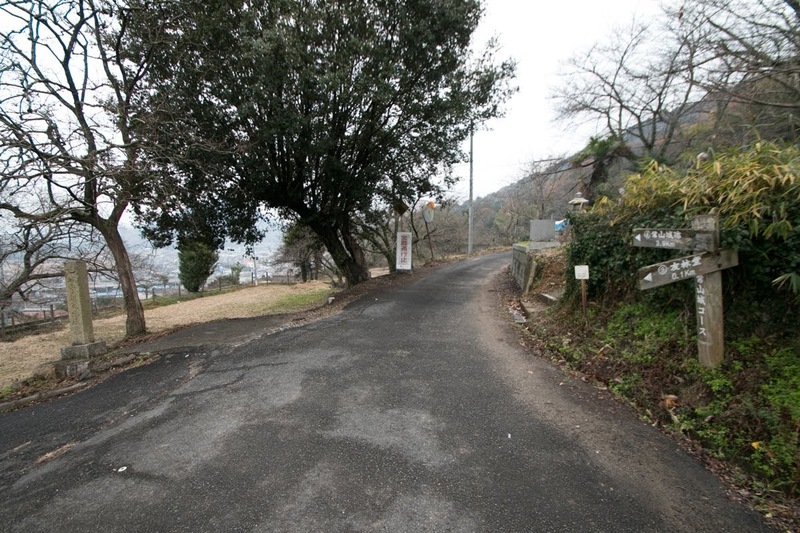 Former Kojima island prospered as a trade point of Seto-Naikai sea and production place of good salt. 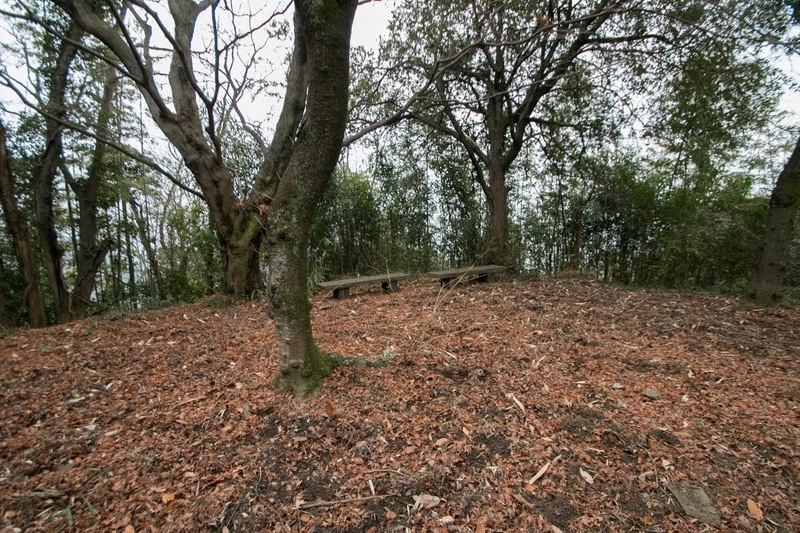 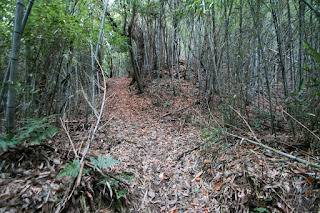 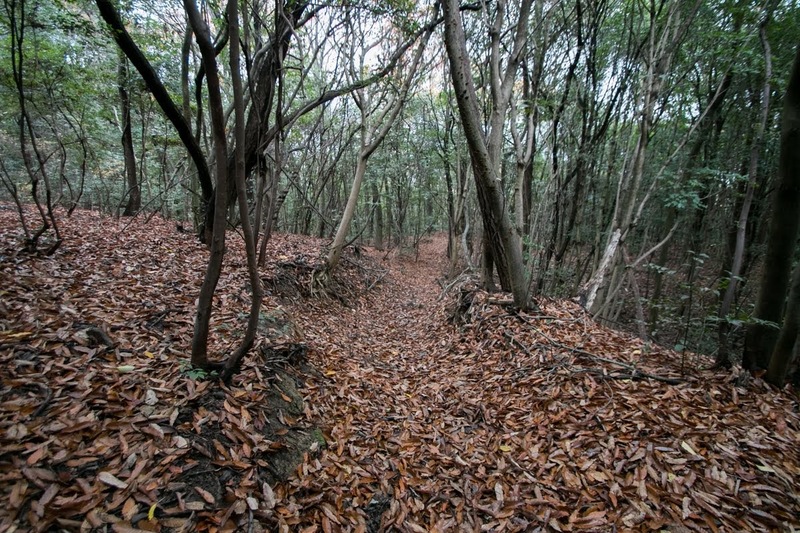 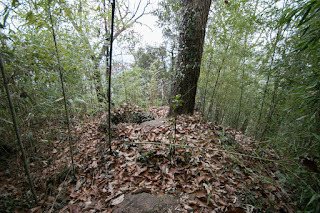 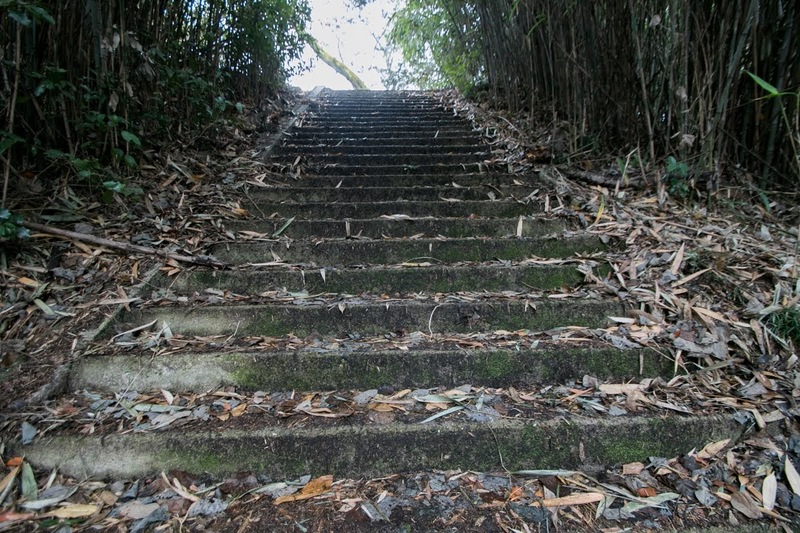 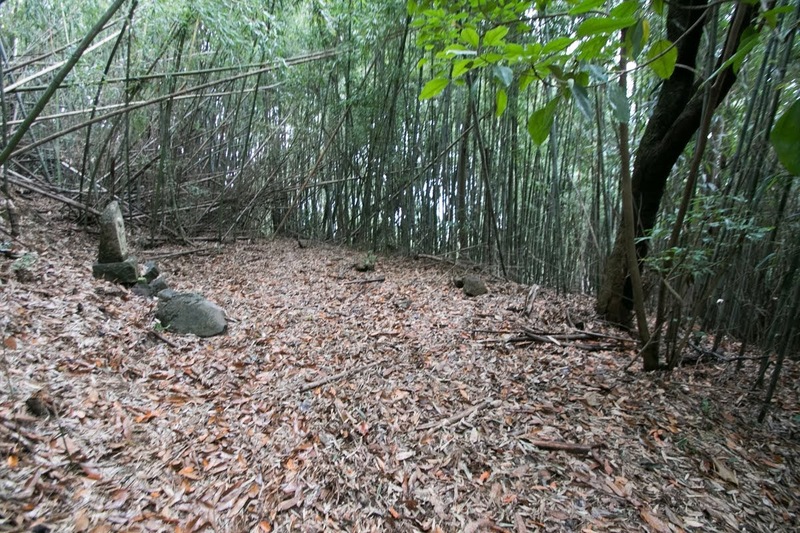 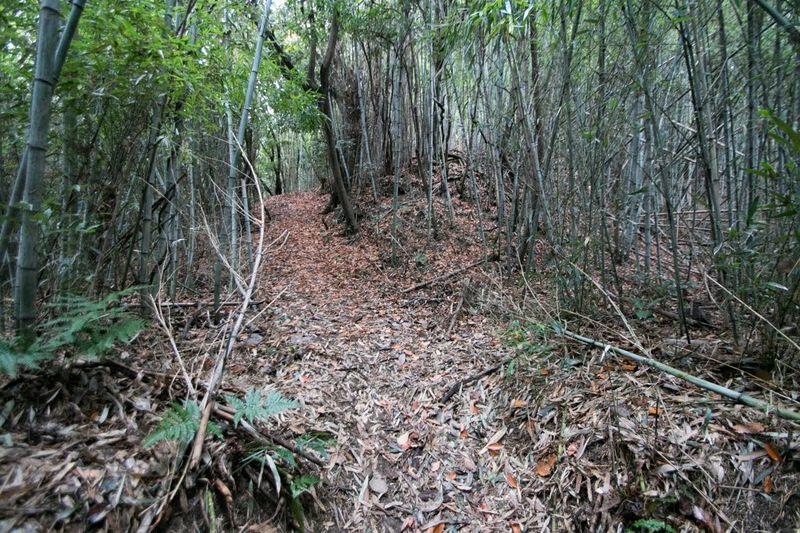 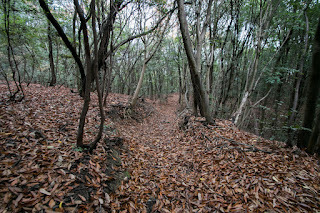 Tsuneyama mountain was an ideal place to build castle to manage whole Kojima island from its center area, and to watch surrounding area from its peak without obstacles. 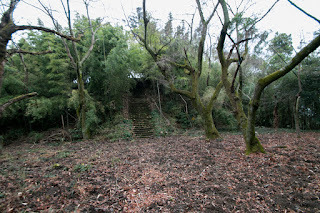 The origin of Tsuneyama castle is unknown but it might be built as a genuine castle by local lord Ueno clan in 16th century. Ueno clan was originally a distant relative and close retainer of Muromachi Shogunate, and an distinguished family served as high class administrative staff of Shogunate for generations..
At the beginning of 16th century, Nobutaka Ueno (?-1563), who later became an important retainer of Yoshiteru Ashikaga (1546-1565) who was the 13th Shogun, was appointed as the lord of Kimurayama castle at the border of Bicchu province (western half of Okayama prefecture) and Bizen province (eastern half of Okayama prefecture), to flourish supporters of Shogunate. 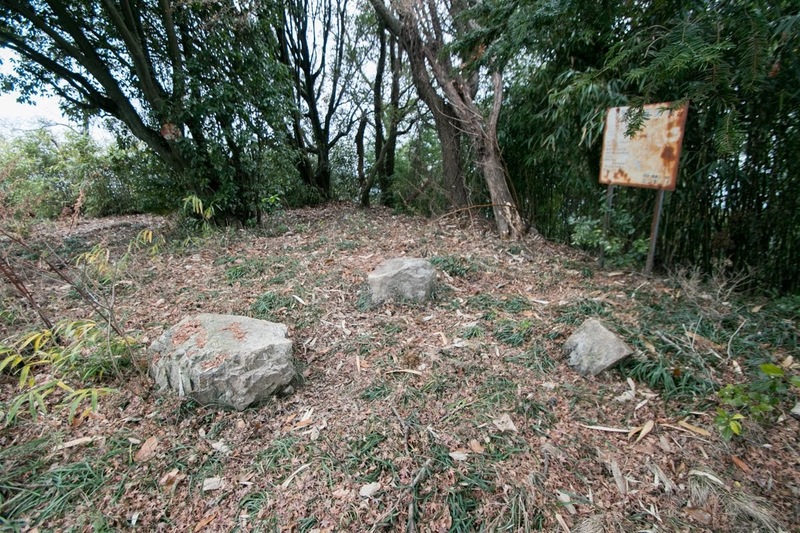 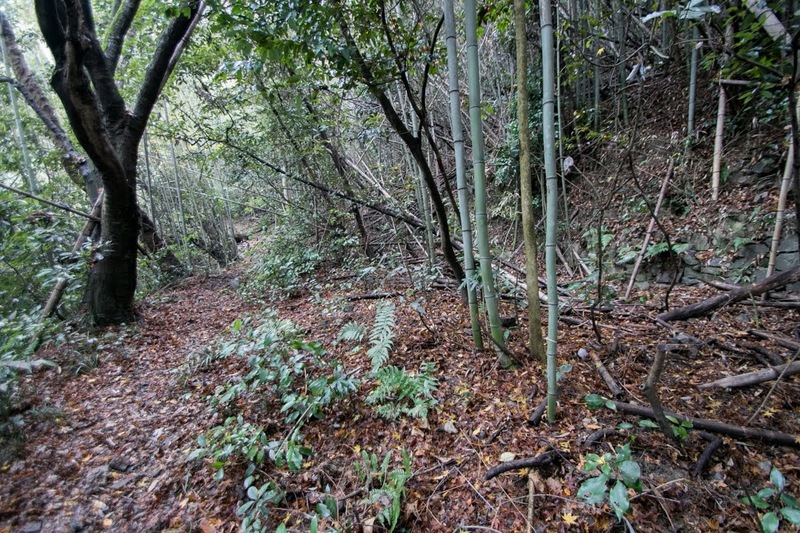 Ueno clan expanded their territory at this area and once captured Bicchu Matsuyama castle (Okayama prefecture). Ueno clan expanded Bicchu Matsuyama castle as a large fortress, but in 1533 Bicchu Matsuyama castle fell by the attack of Sho clan, which was the lord of Sarukake castle at neighbor place. 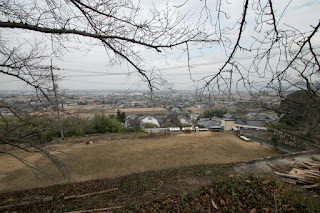 Ueno family at Bicchu Matsuyama castle shared their fate with the castle. 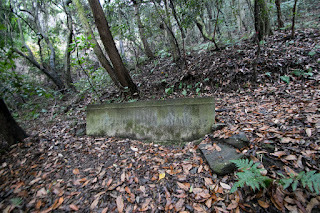 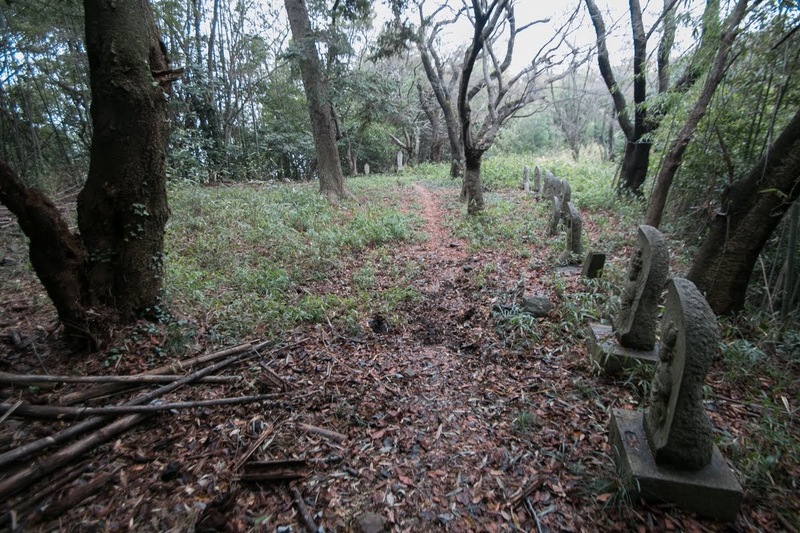 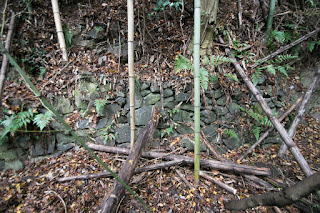 But relative of Ueno clan survived at Kimurayama castle then later moved to Kojima island. 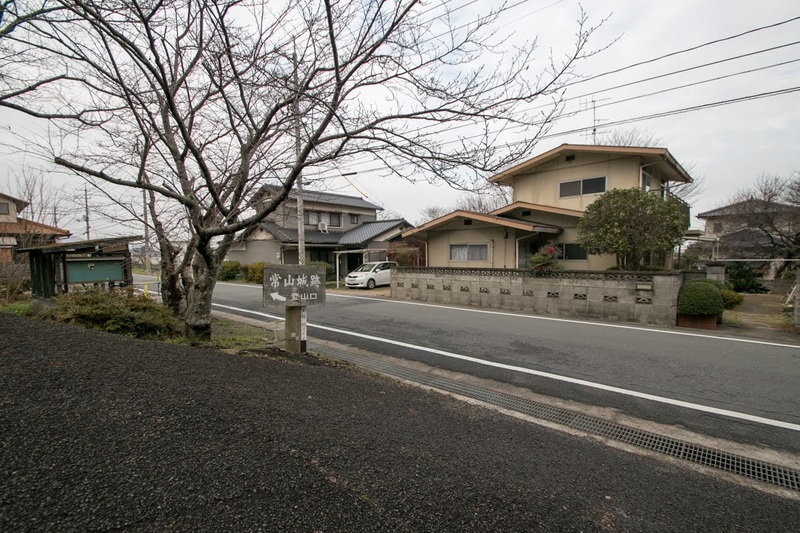 This Ueno clan recovered their power utilizing security of isolated Kojima island and economic resource, then grew into the strong local lord seized whole Kojima island. 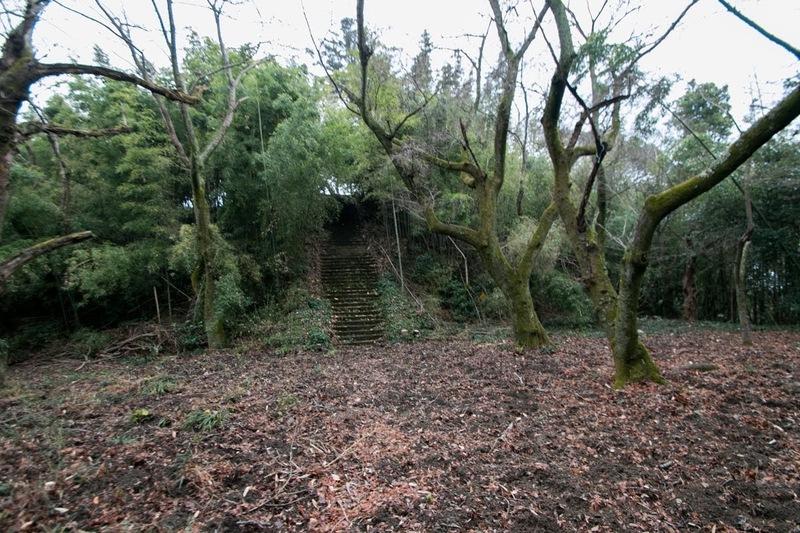 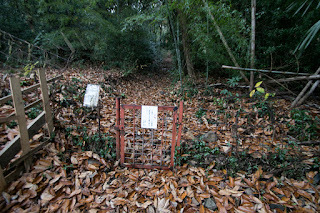 To secure Kojima area, Ueno clan moved their main base to Tsuneyama castle. 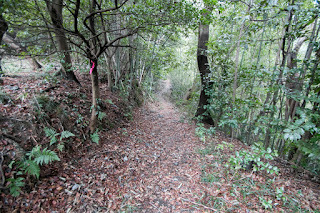 In the middle of 16th century, Ueno clan allied with Mimura clan, a local lord of Bicchu province and beat Sho clan that was the enemy of Ueno clan then captured Bicchu Matsuyama castle. 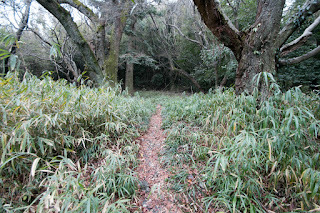 At this time Mimura clan belonged to Mouri clan, the ruler of Chugoku region, thus Ueno clan also related to Mouri clan. 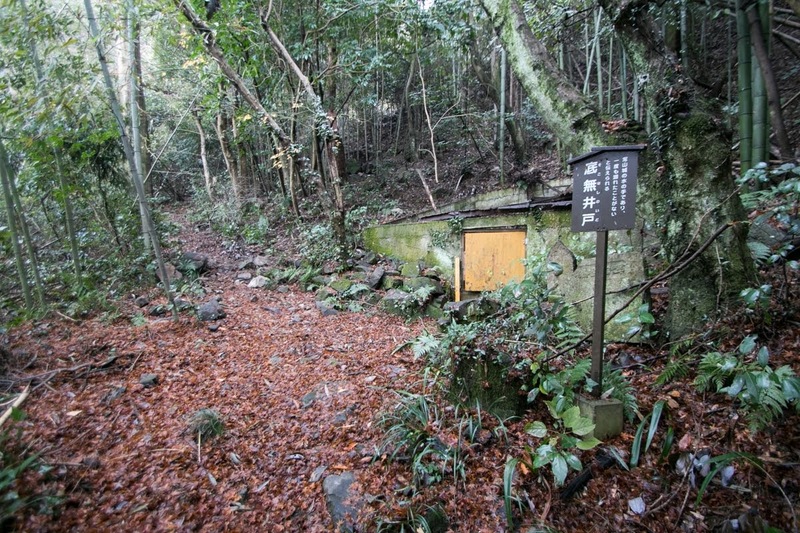 At this time Takanori Ueno (?-1575), the last leader of Ueno clan, married with Princess Tsuruhime who was the daughter of Mimura clan. 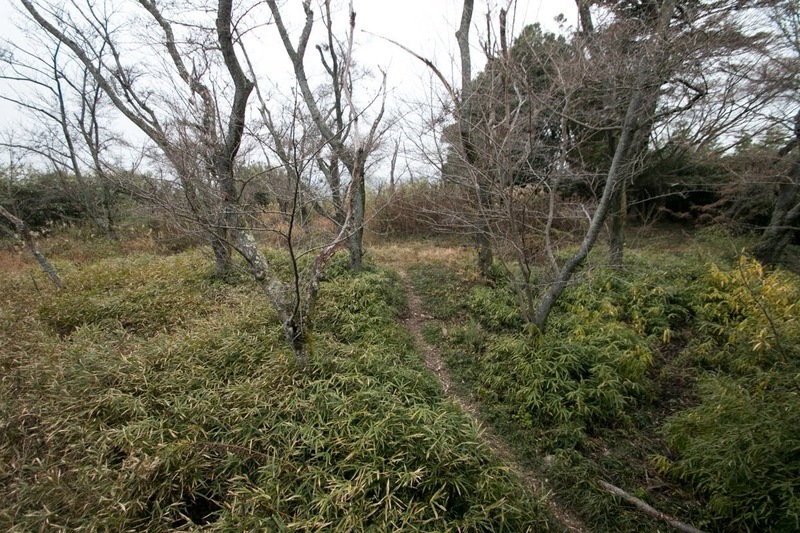 Mimura clan once captured Bicchu Province and tried to expand into Bizen province. 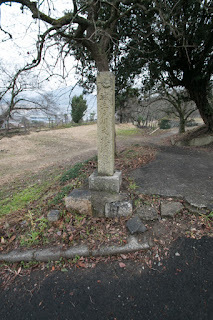 Naoie Ukita (1529-1582), an important retainer of Uragami clan which was the governor of Bizen province, looked the strength of Iechika Mimura (1517-1566), the leader of Mimura clan, assassinated the leader of Mimura clan by gunfire. 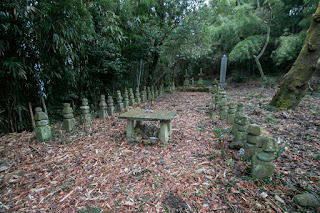 Mimura clan lost its strong leader and felt grunge against Ukita clan. 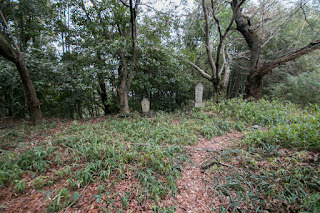 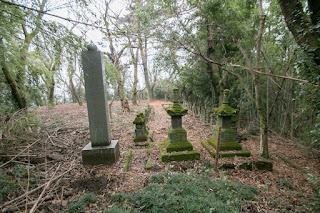 In 1567, Motochika Mimura (?-1575), the son of Iechika Mimura and brother in law of Takanori Ueno, marched to Bizen province as a as a revenge of his father but suffered severe defeat before Naoie Ukita at the battle of Myozenji. After this battle Naoie Ukita overcame Uragami clan and became the warlord of Bizen province, then allied with Mouri clan which seek further expansion toward east in 1574. 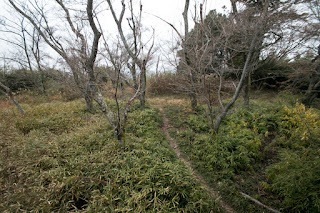 But alliance of Mouri clan and Ukita clan unforgivable act for Mimura clan which served to Mouri clan long time. In 1575, Motochika Ueno left Mouri clan and allied with central ruler Nobunaga Oda (1538-1582), but at this point the power of Nobunaga did not reach to Chugoku region. 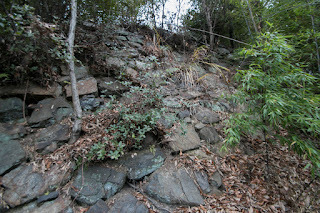 Before the attack of Mouri army, Bicchu Matsuyama castle fell after half-year siege then Motochika Mimura killed himself. Next Mouri army arrived at Tsuneyama mountain and encircled Tsuneyama castle. 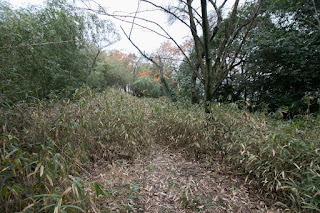 Takanori Ueno desperately fought against overwhelming army, but lost every branch castle and the number of soldiers gradually declined then the fall of castle is approaching. Looking at this situation, Princess Tsuruhime who hoped to make revenge against Mouri army which ruined her family and husband's family even just a little, armed with Japanese halberd and charged into Mouri army with her ladies in waiting. 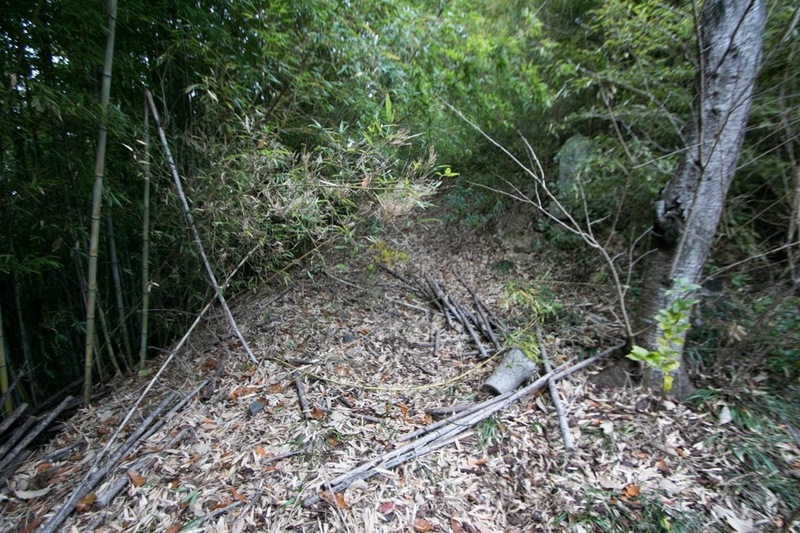 At first Mouri army confused looking at this female platoon, but shortly the enemy recovered thus her fellows died one by one. 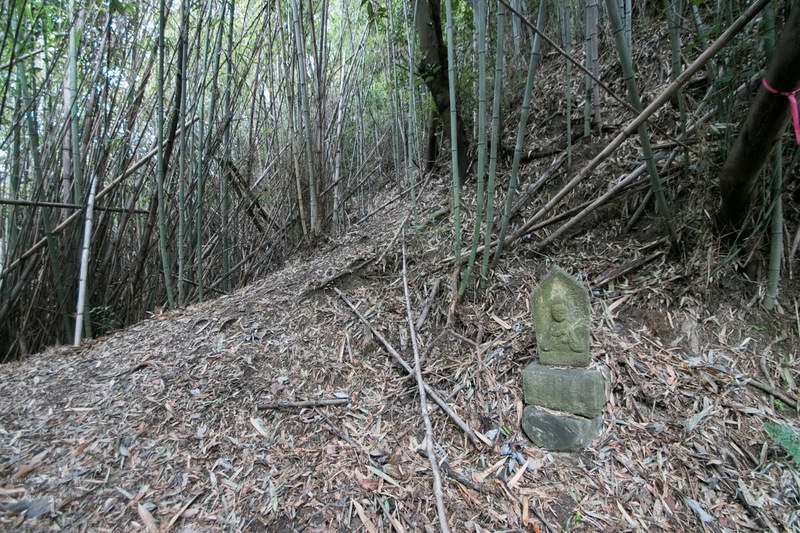 Nomi (1527-1592), the commander of Mouri army. 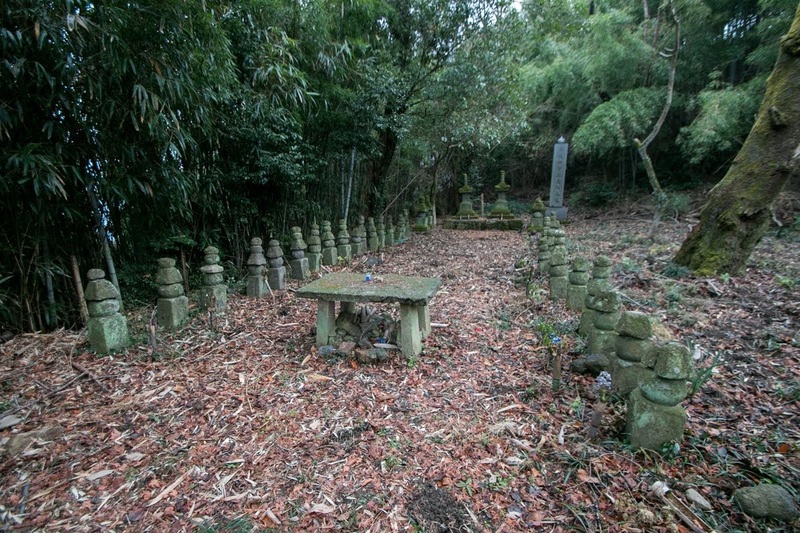 But Munekatsu politely declined this request, thus Princess Tsuruhime returned to the castle and killed herself. 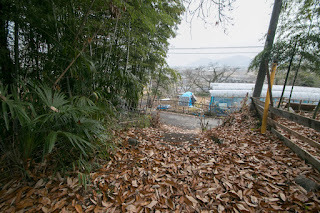 Takanori Ueno followed his wife, and the history of Ueno clan at Bizen province had ended. 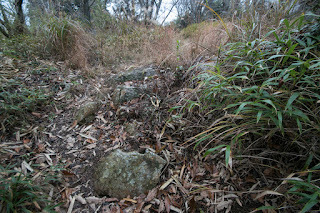 After the siege Tsuneyama castle was held by Mouri clan, but later became the territory of Ukita clan. 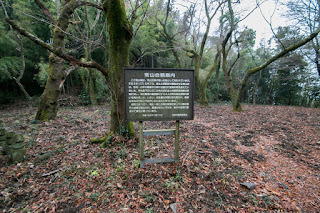 Ukita clan which thought importance of marine communication at Kojima area placed their trusted retainer Hideyasu Togawa (1536-1597) as the commander of Tsuneyama castle. 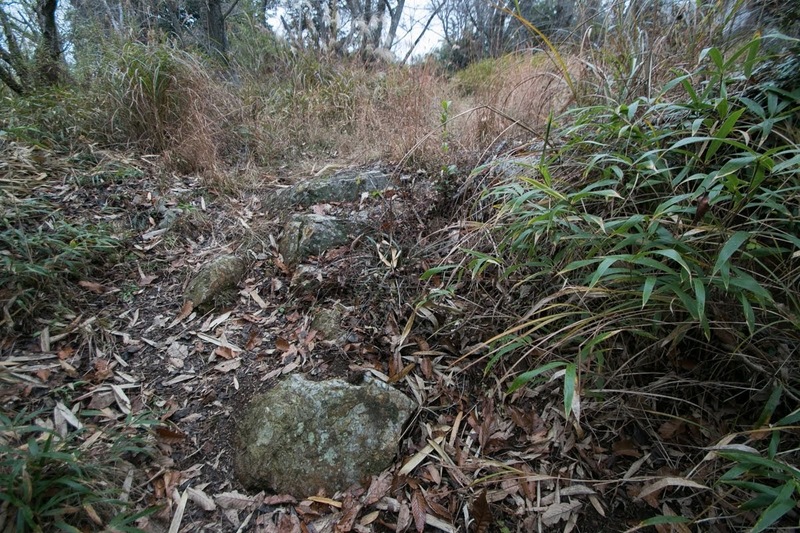 As a southern guard of their main base Okayama castle, Ukita clan renovated Tsuneyama castle into a modern one with stone walls. 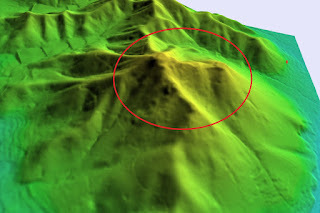 The main part of Tsuneyama castle spreads toward north and northeast from its peak like V letter. 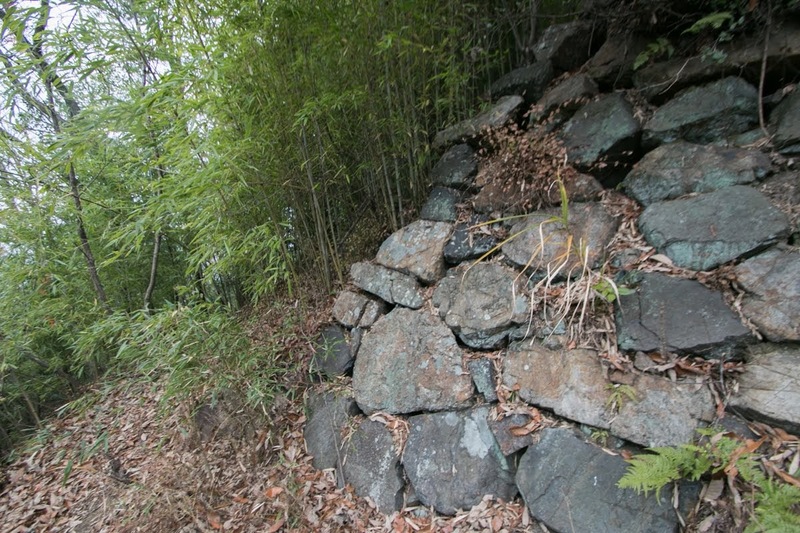 The central area of the castle is a rectangular area of 60 meter long and 20 meter wide, being surrounded by stone walls. 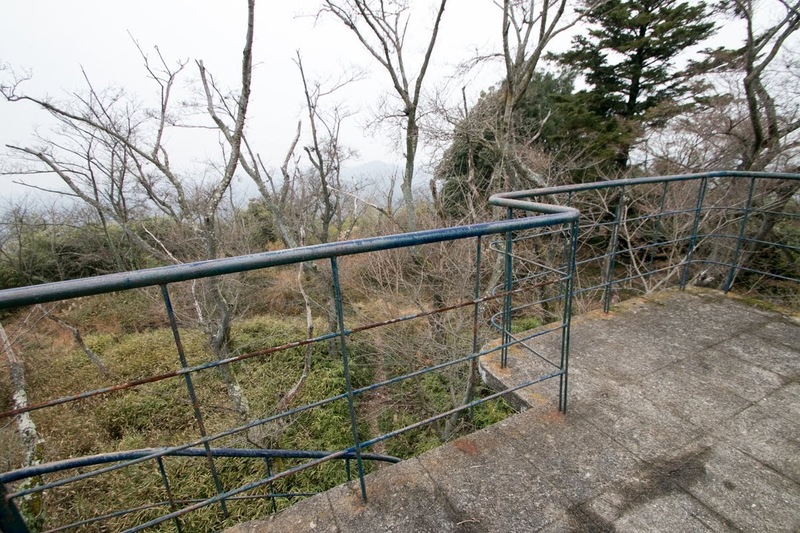 Central area is just a flat terrace and does not have the basement of main tower. 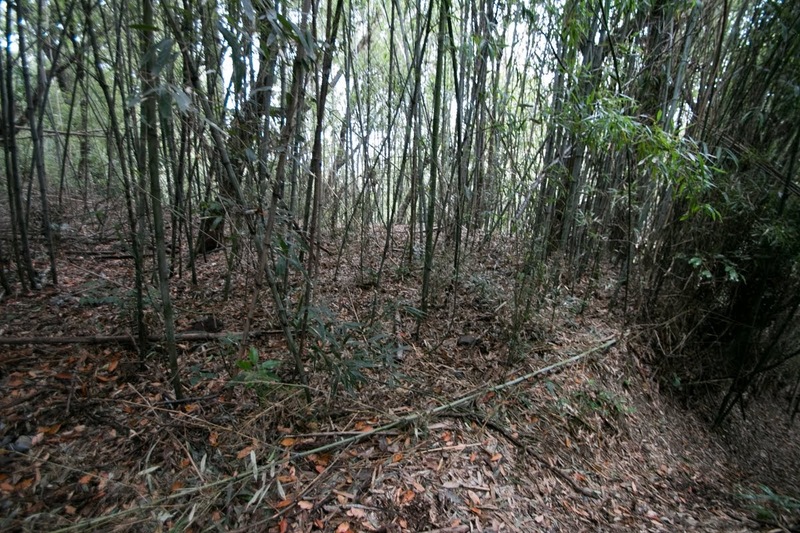 At the both edge of two lines there are considerably large flat terraces which might have corner turret. 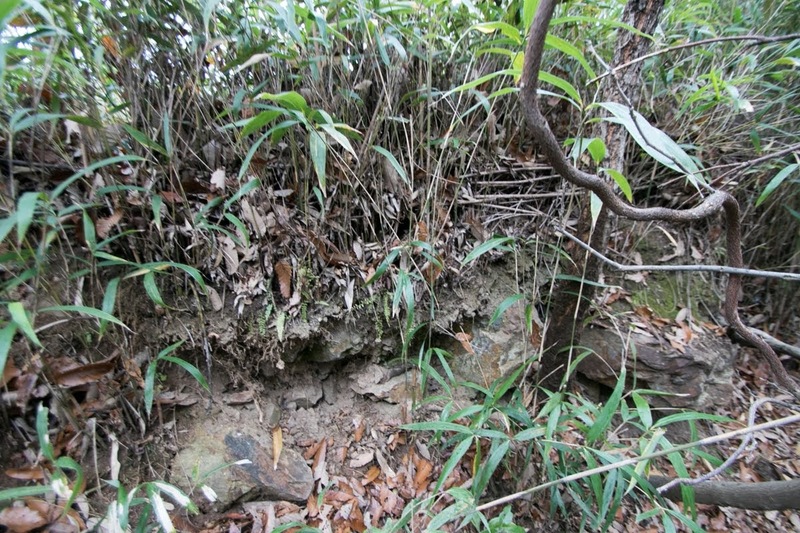 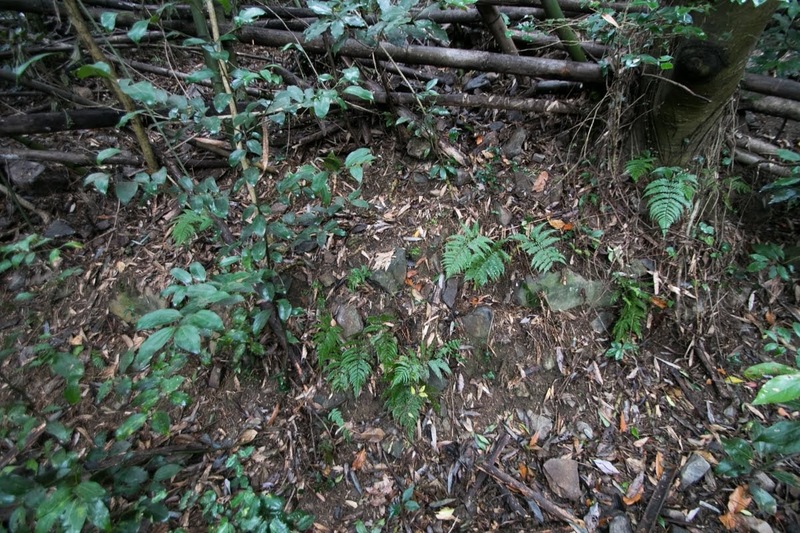 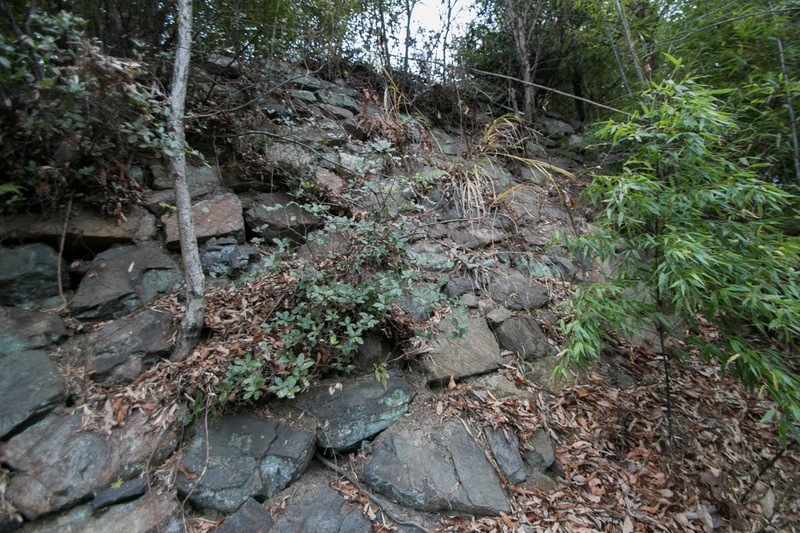 Between central area and these edge terraces, many small terraces were built along the ridge. 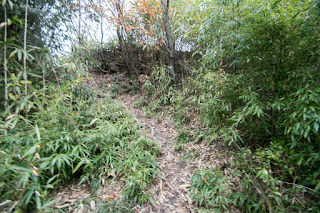 As the terraces were built at narrow edge, the path connecting terraces are straight ones which keeps original plan of the castle. 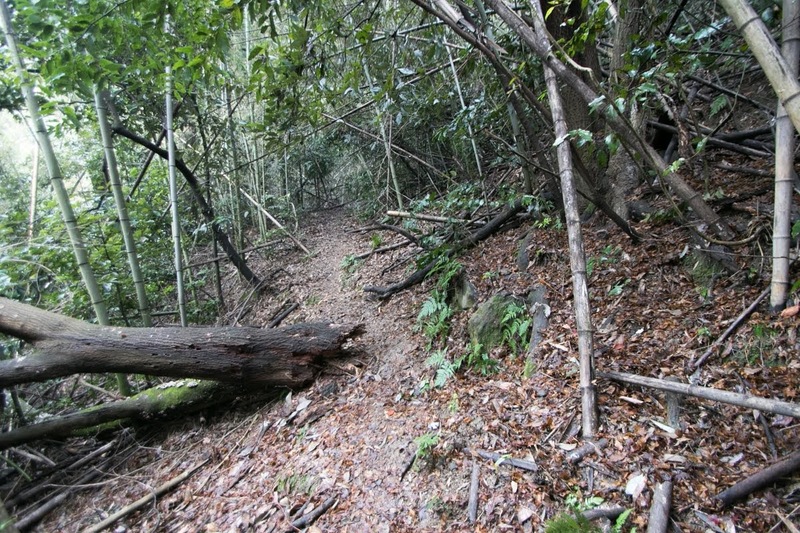 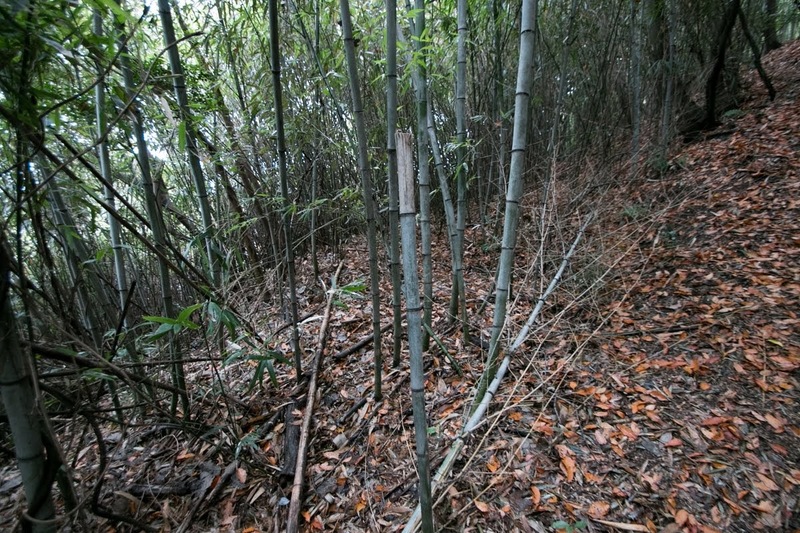 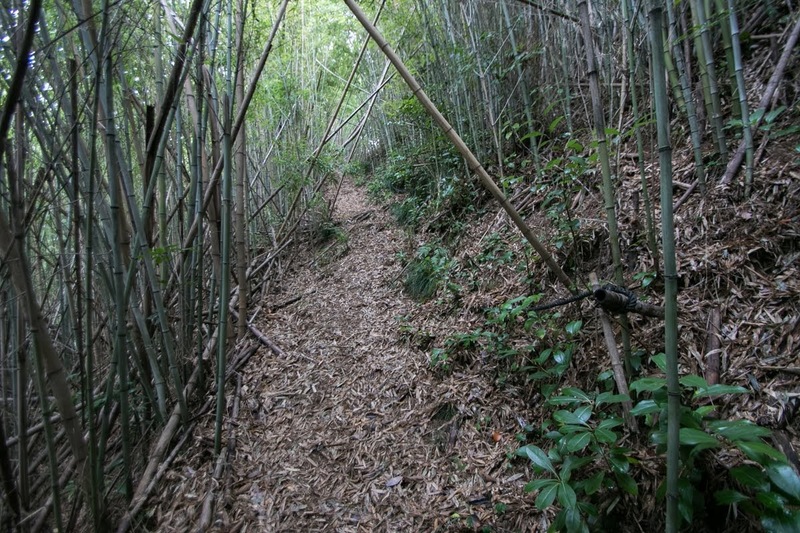 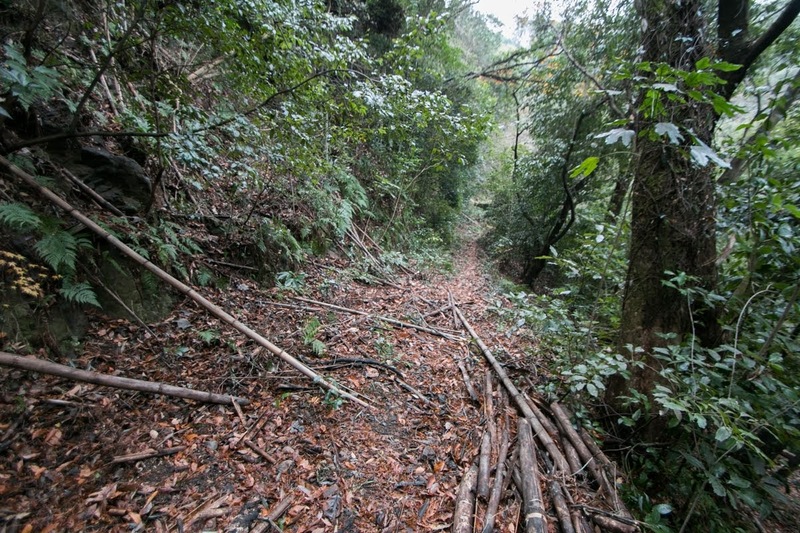 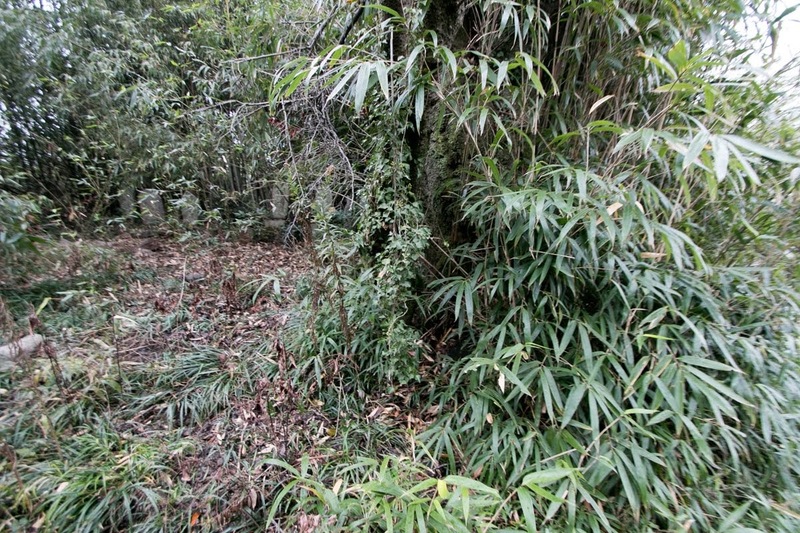 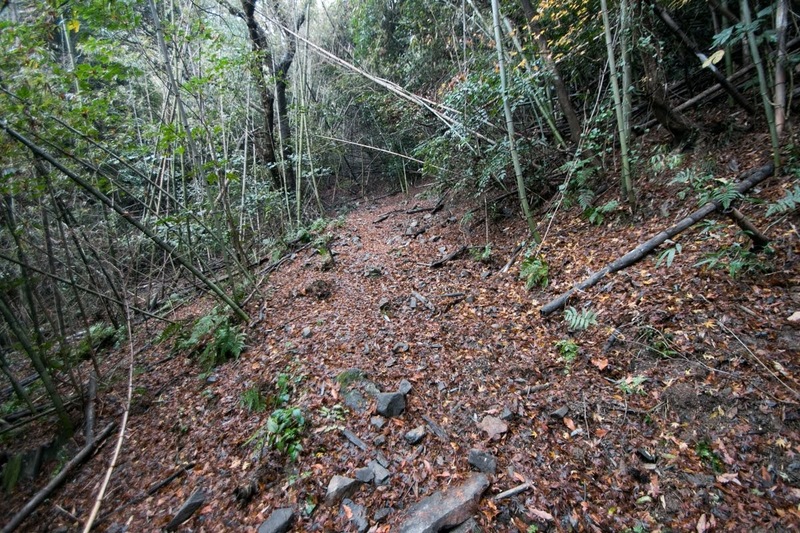 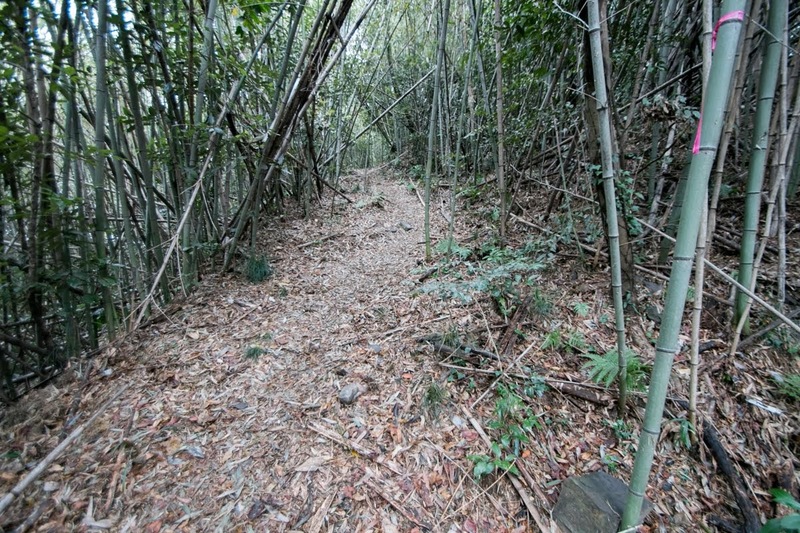 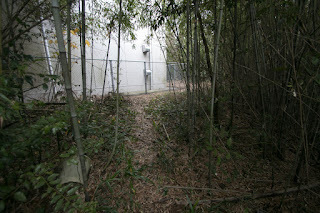 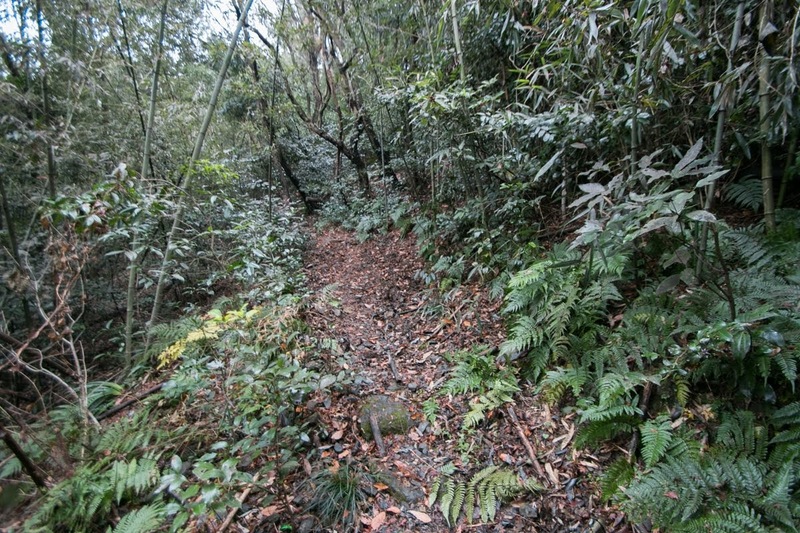 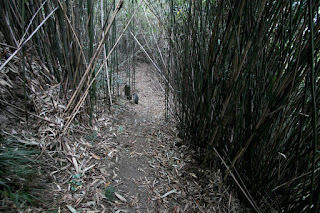 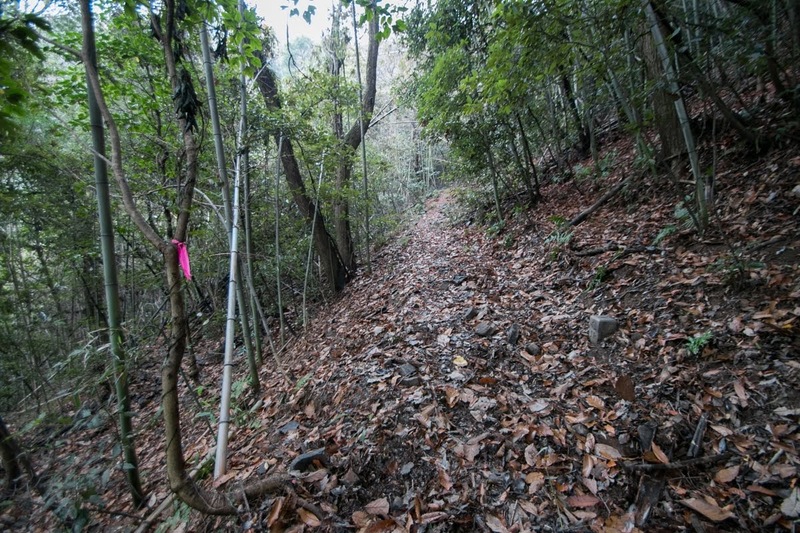 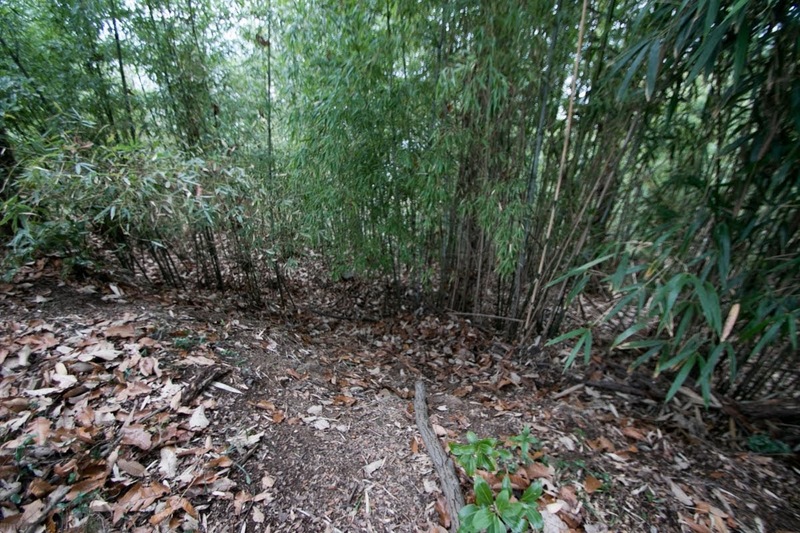 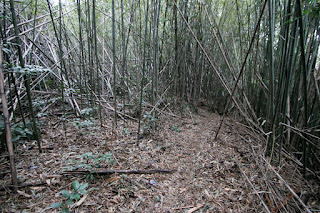 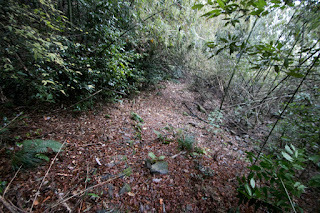 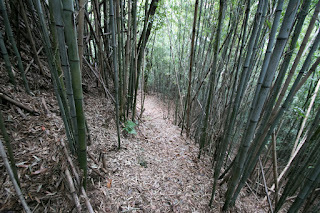 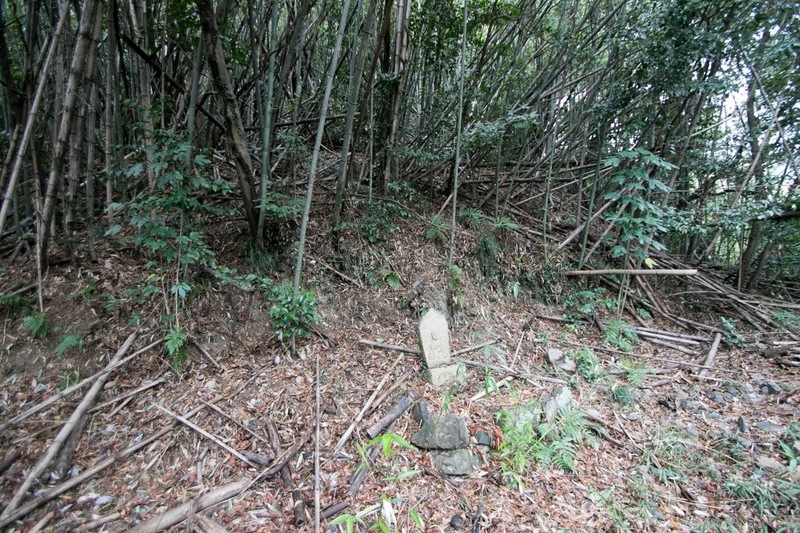 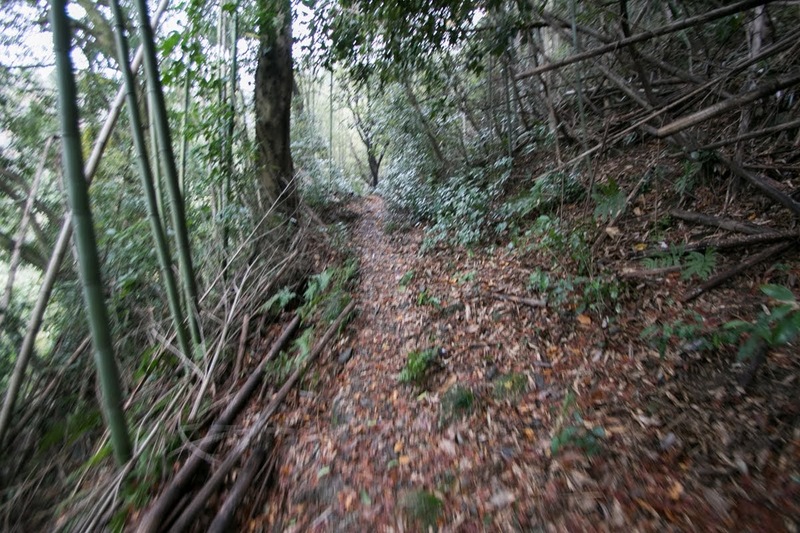 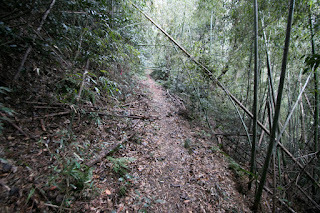 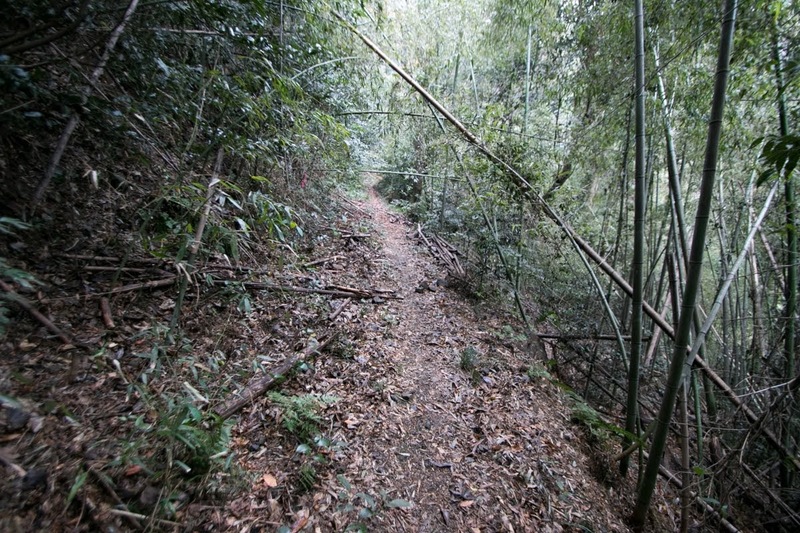 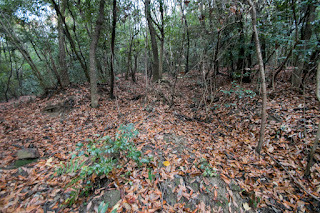 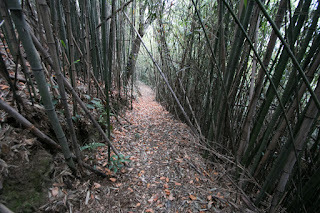 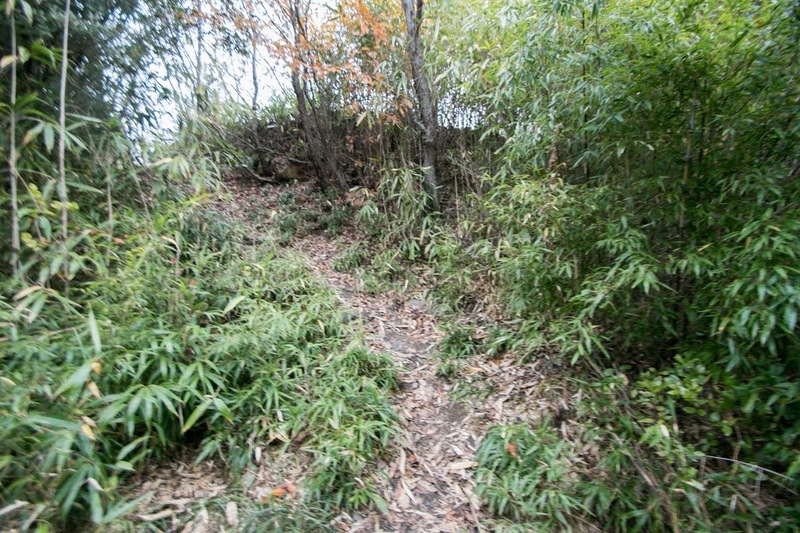 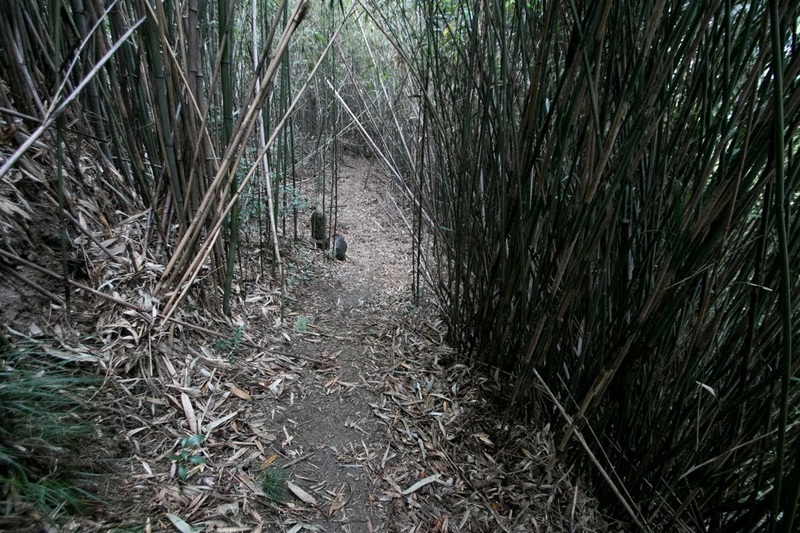 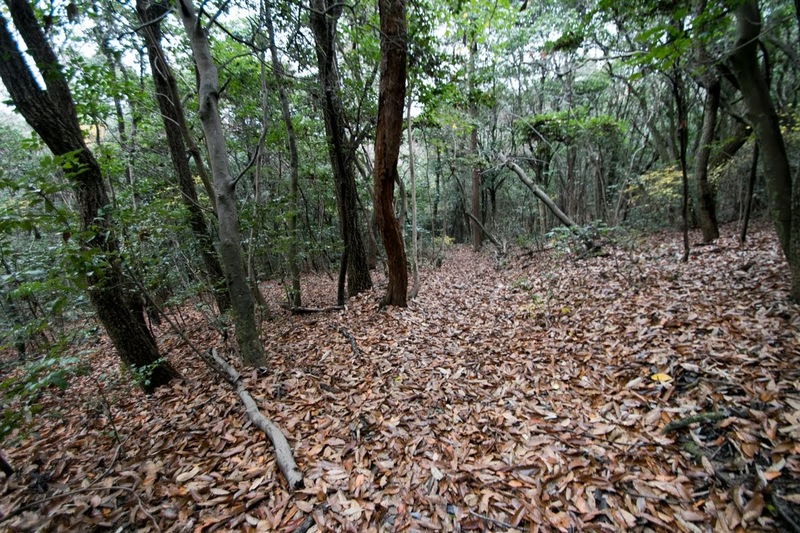 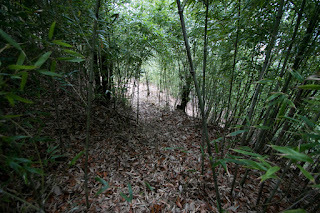 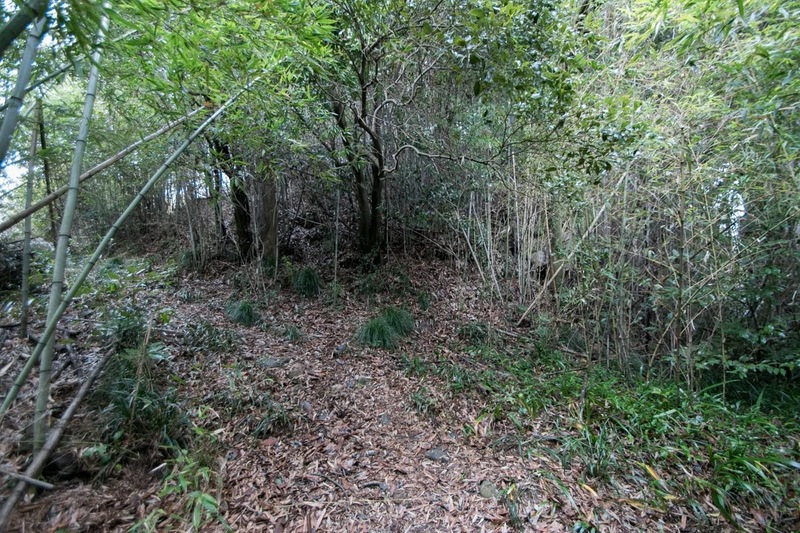 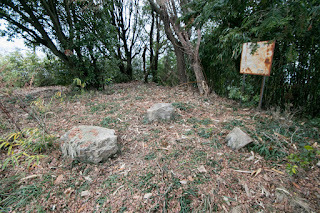 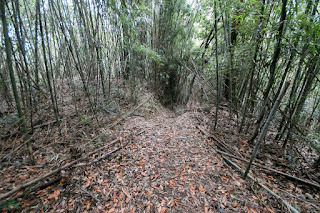 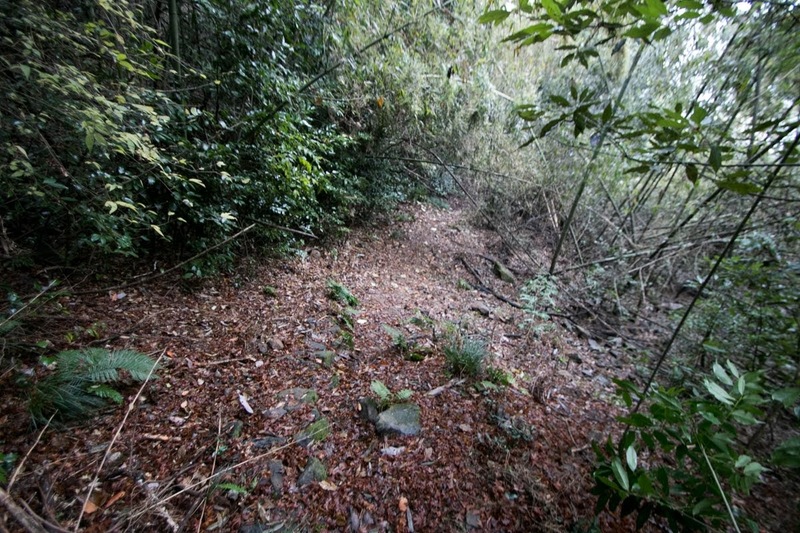 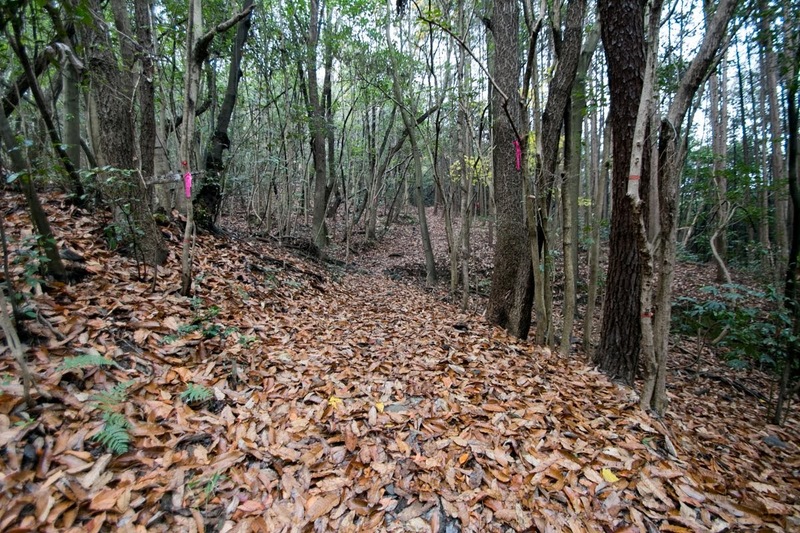 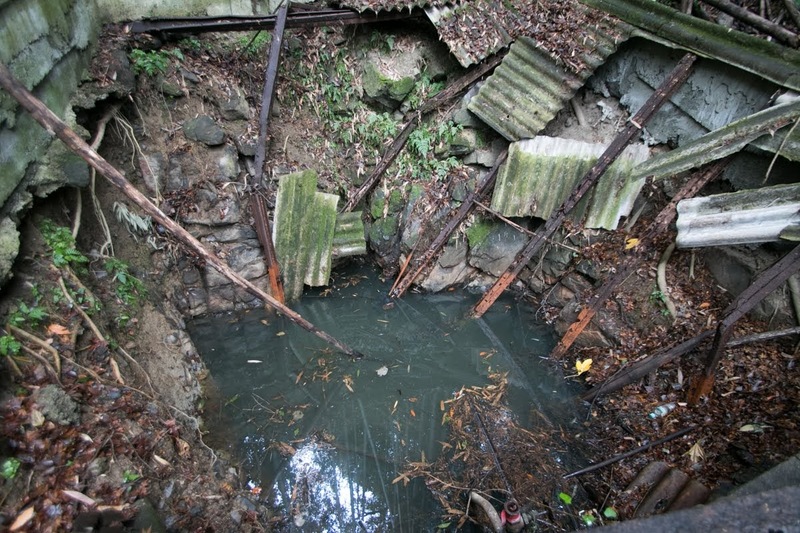 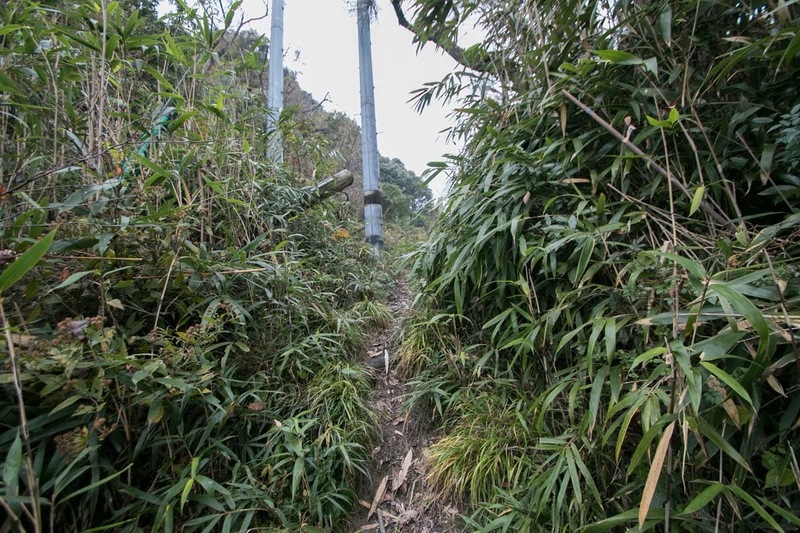 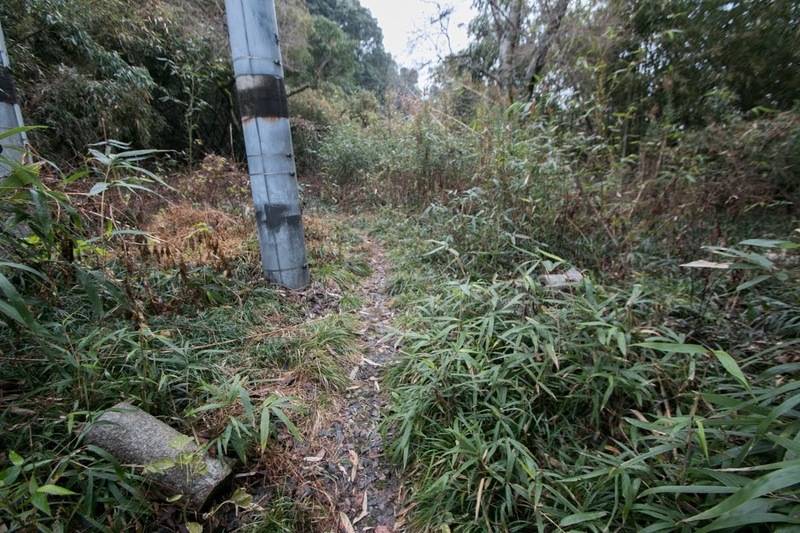 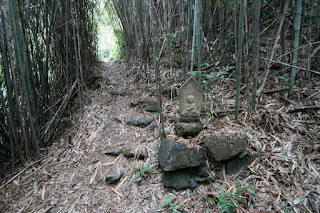 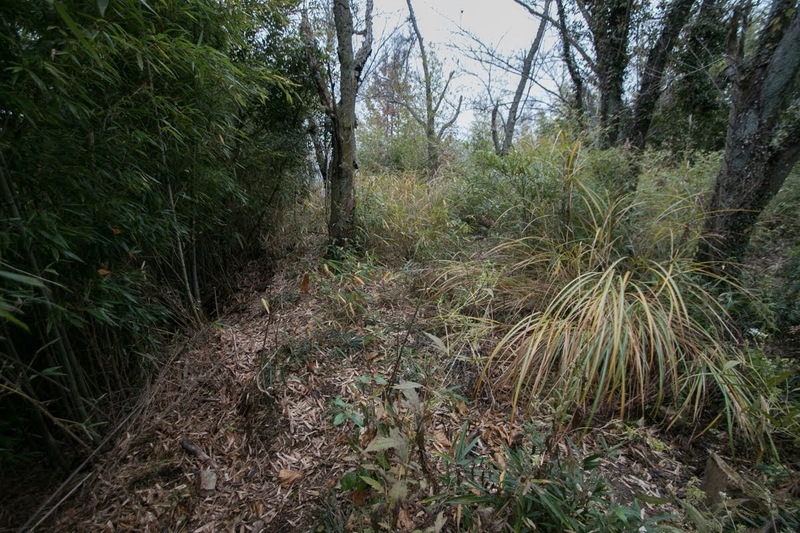 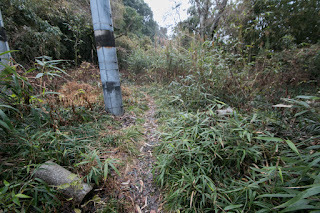 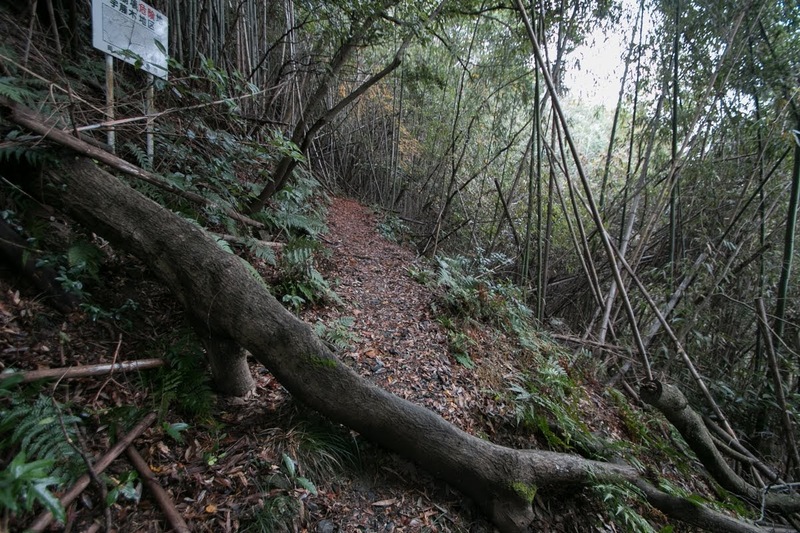 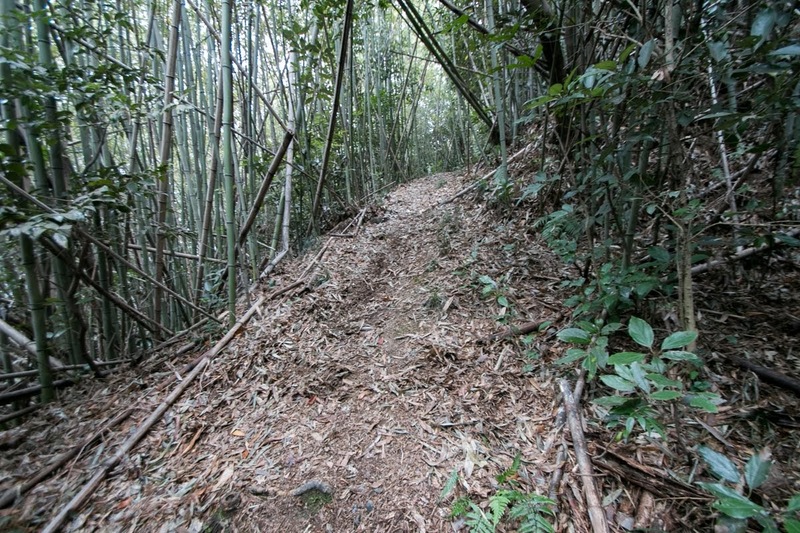 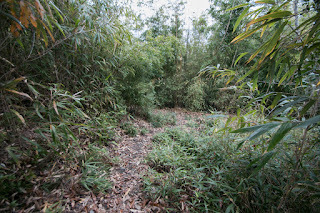 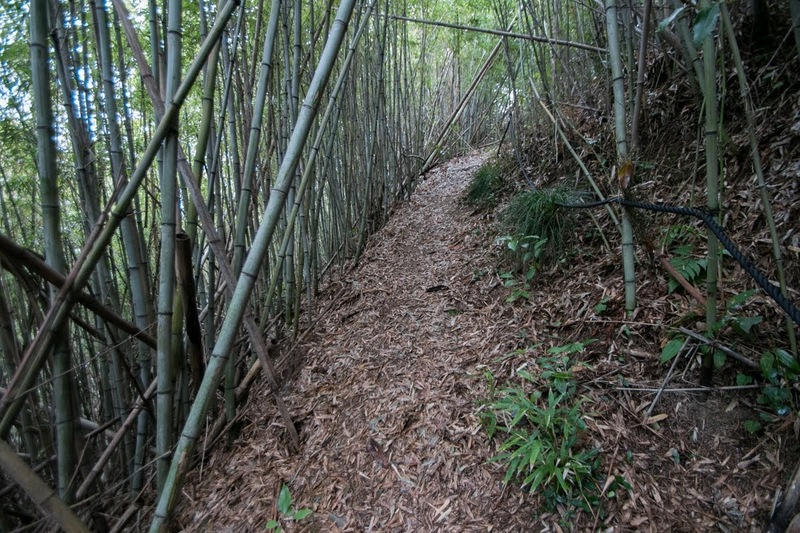 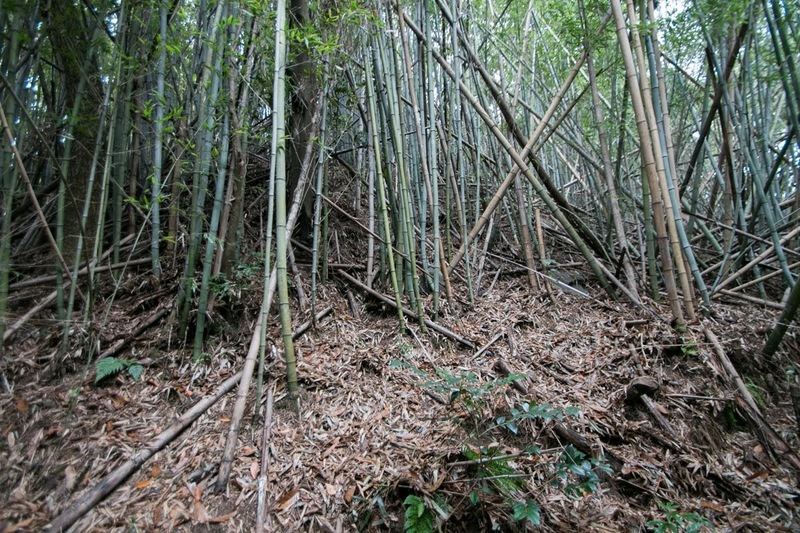 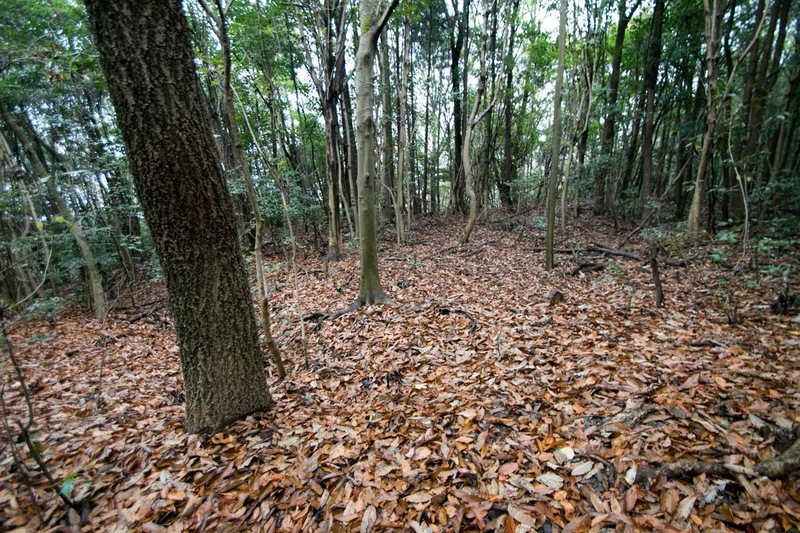 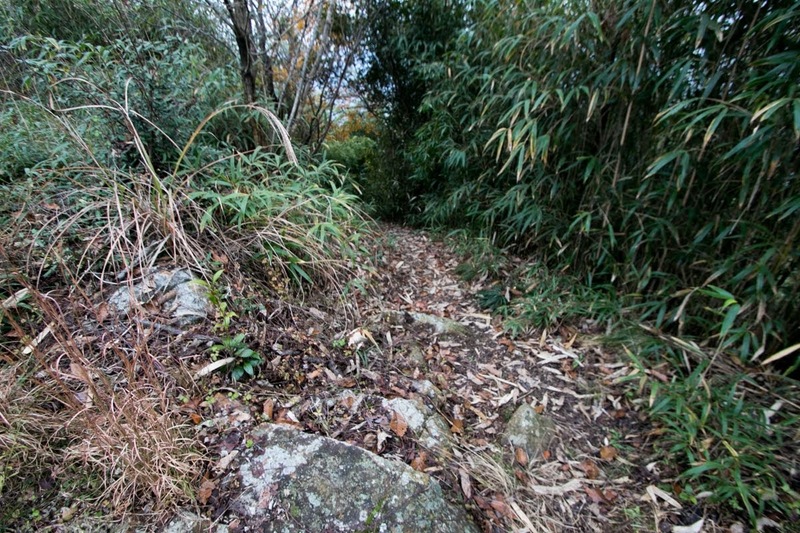 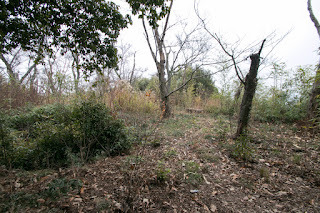 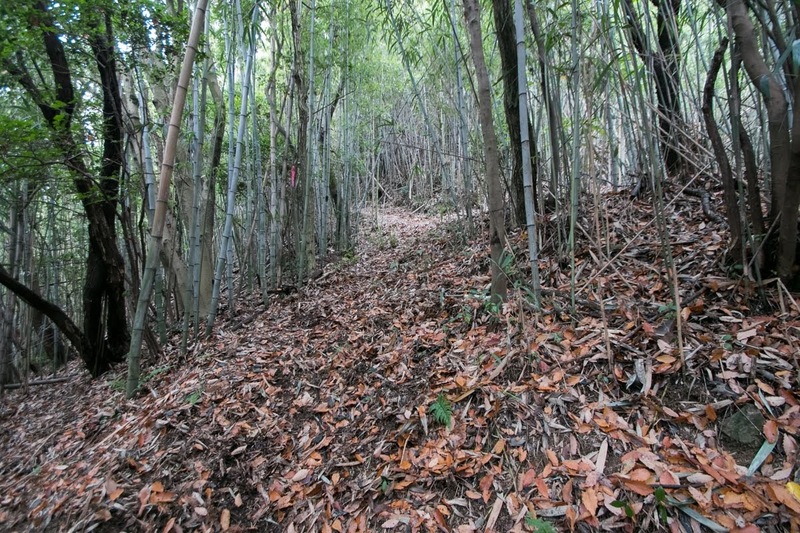 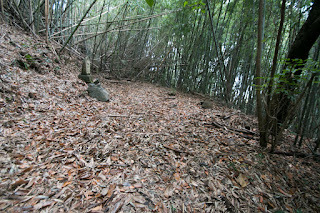 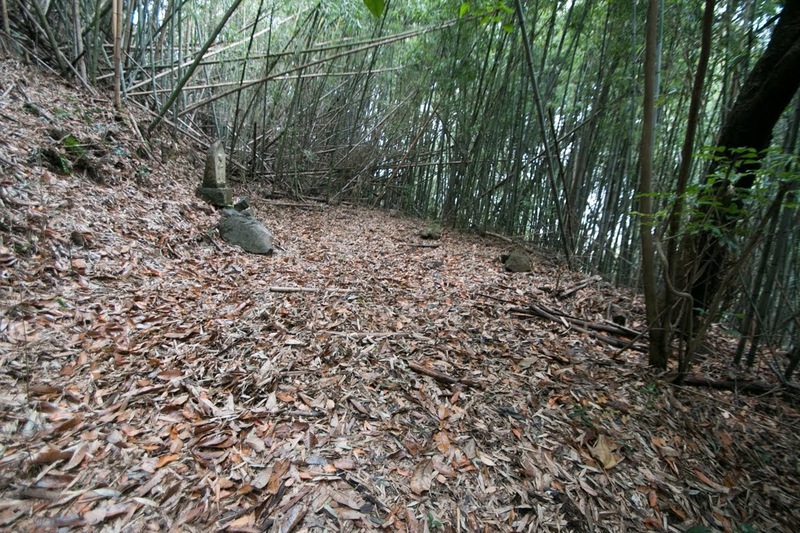 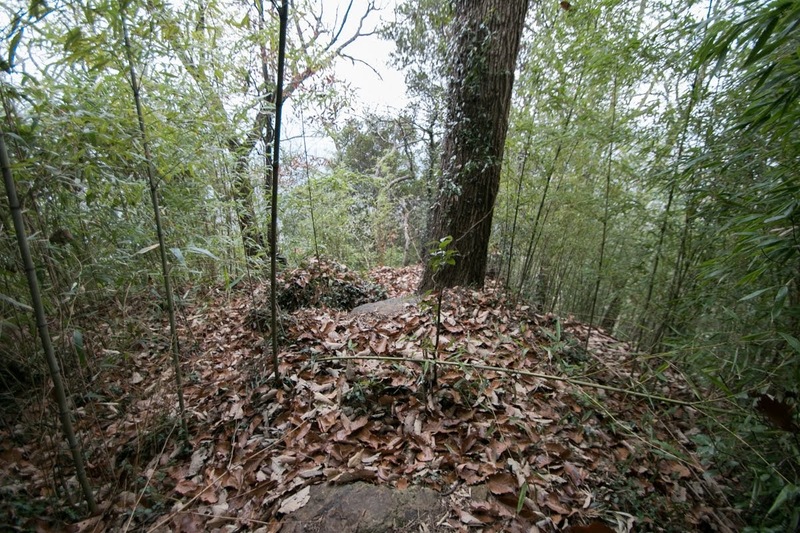 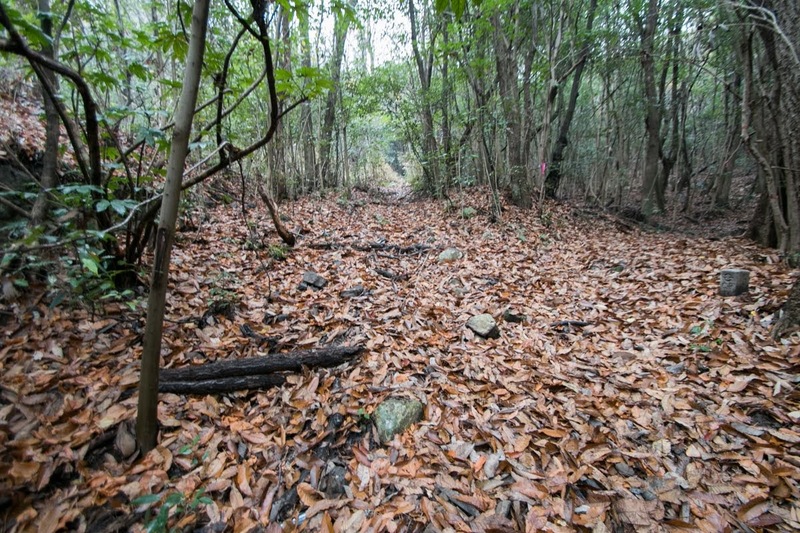 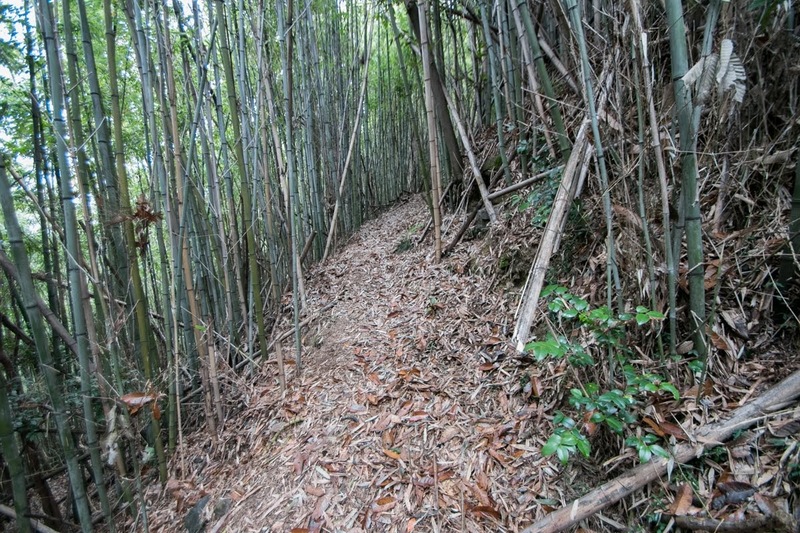 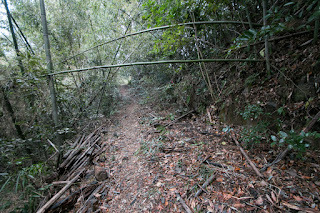 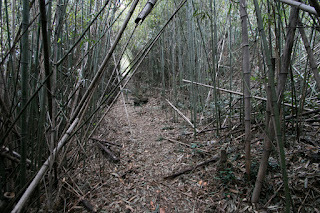 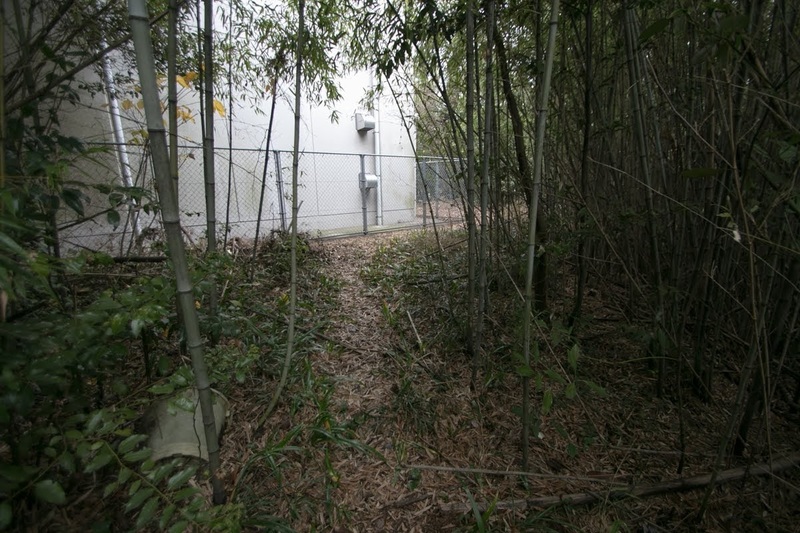 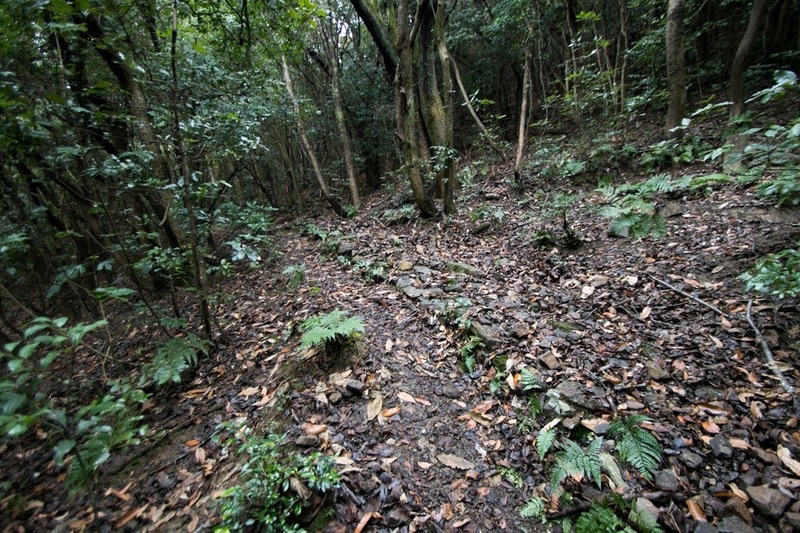 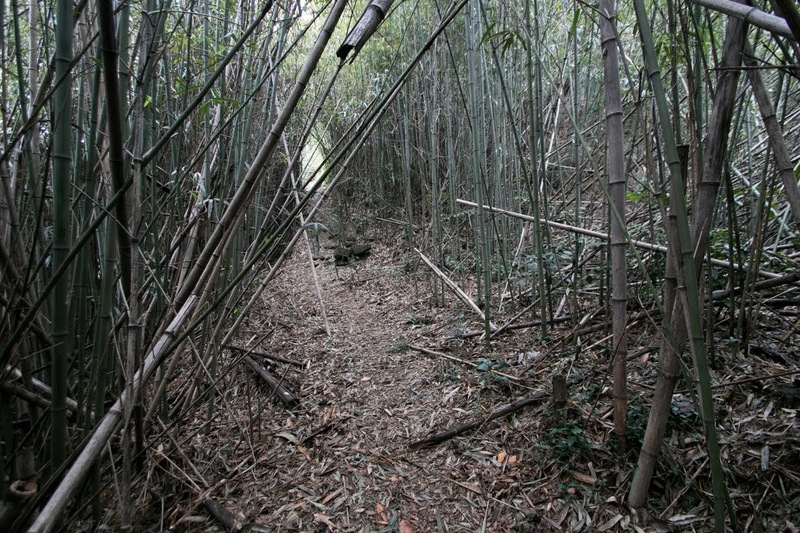 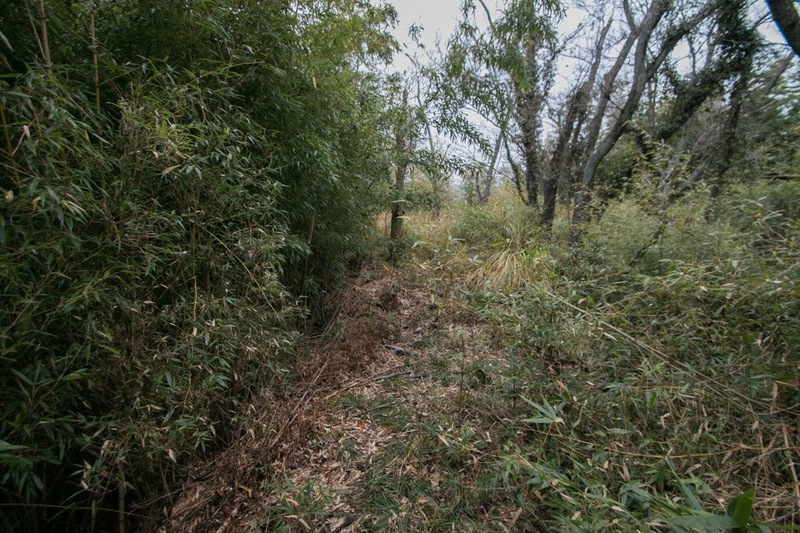 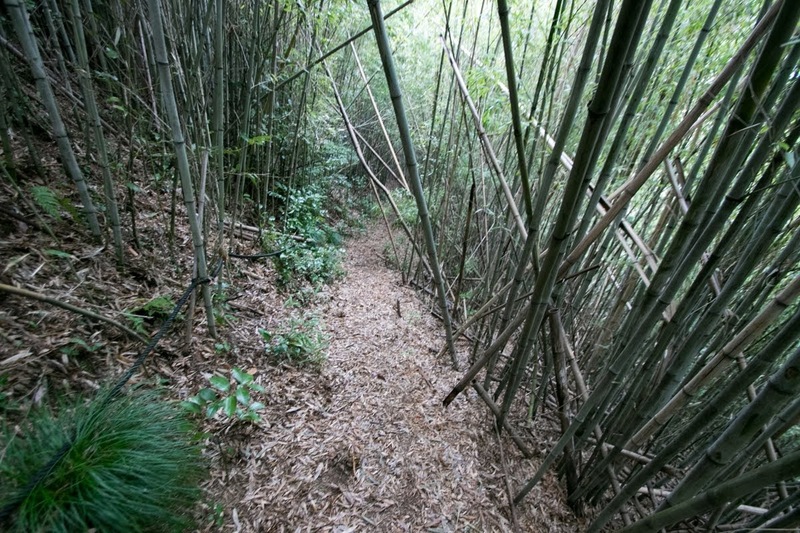 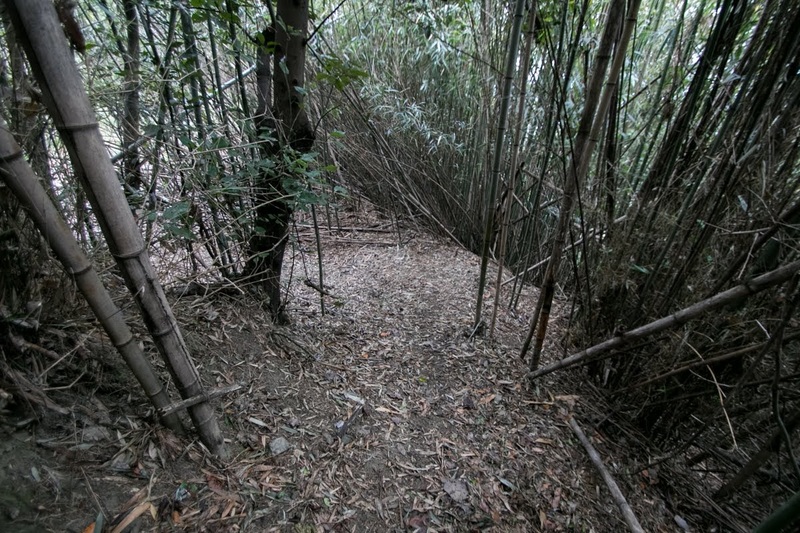 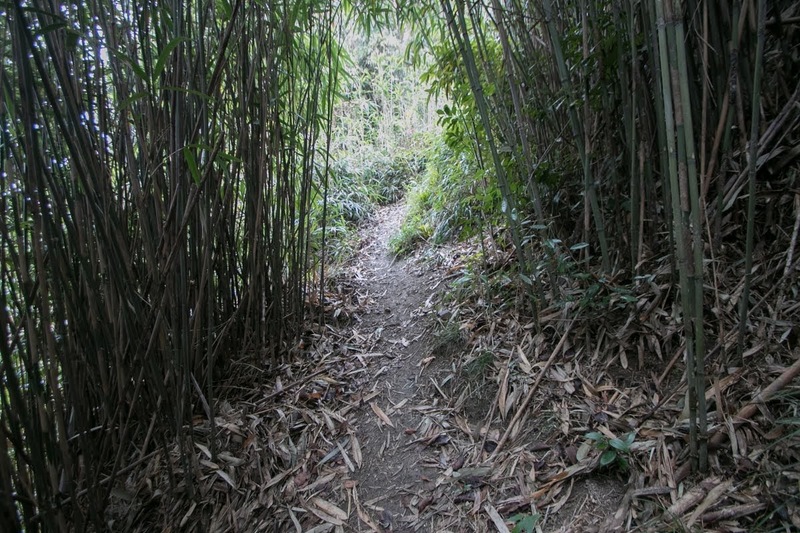 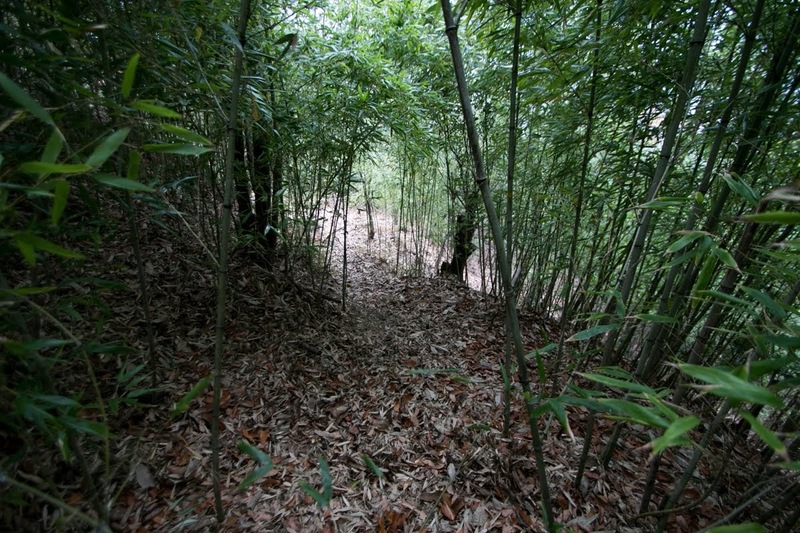 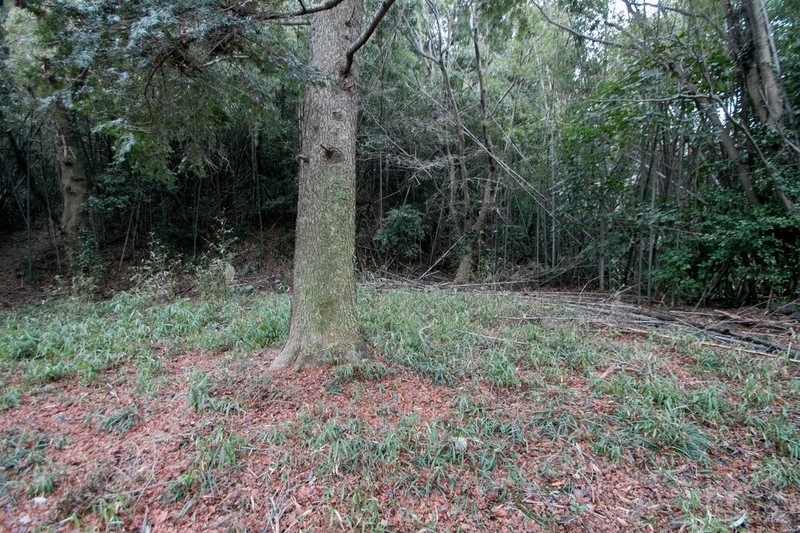 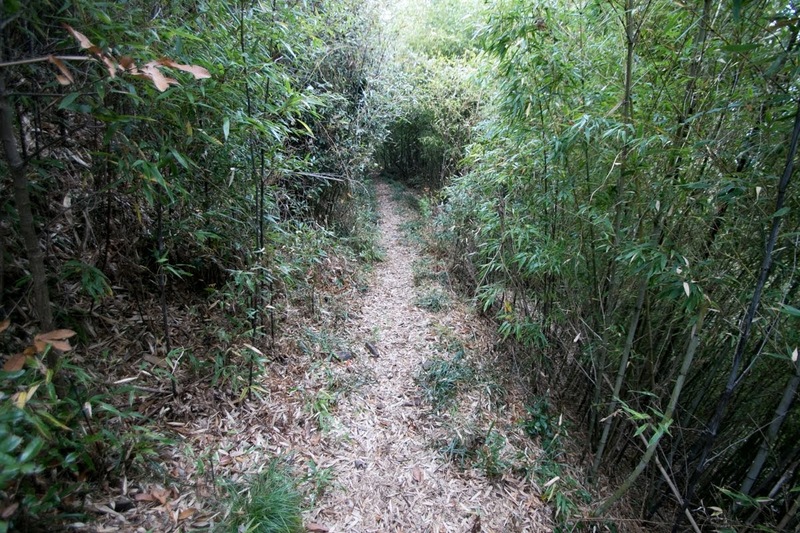 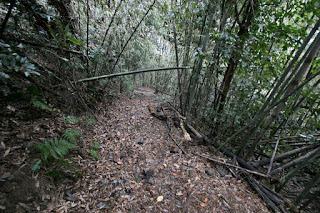 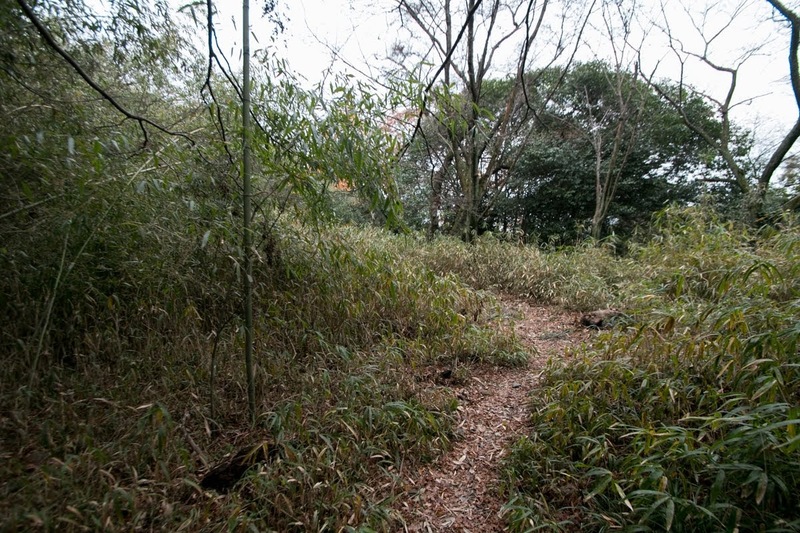 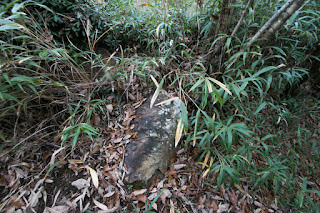 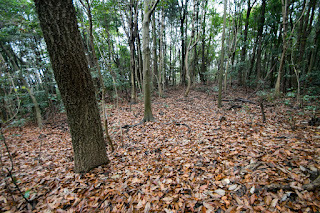 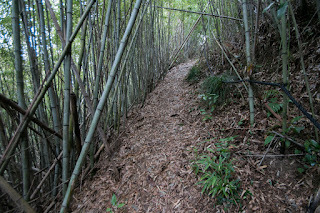 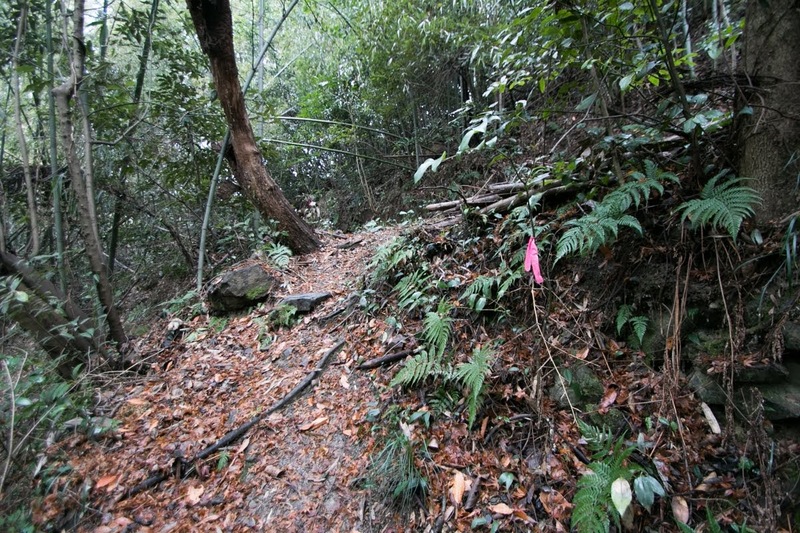 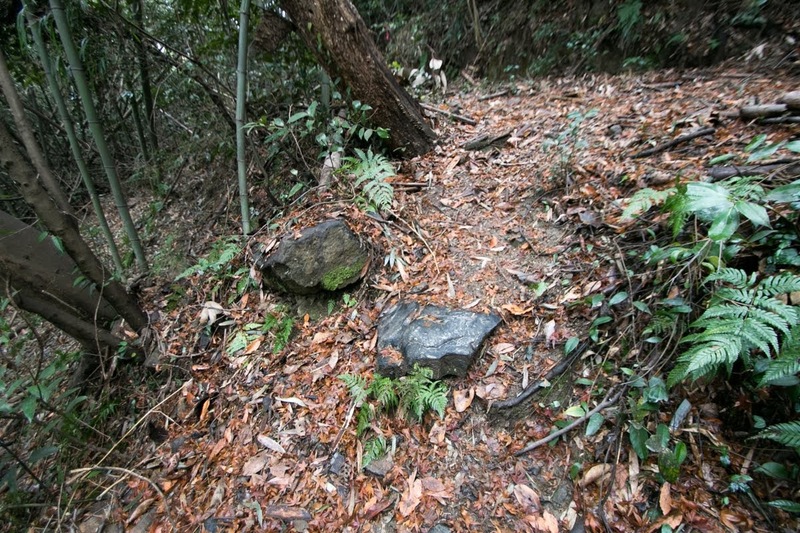 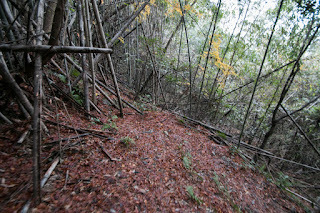 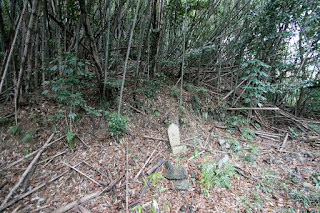 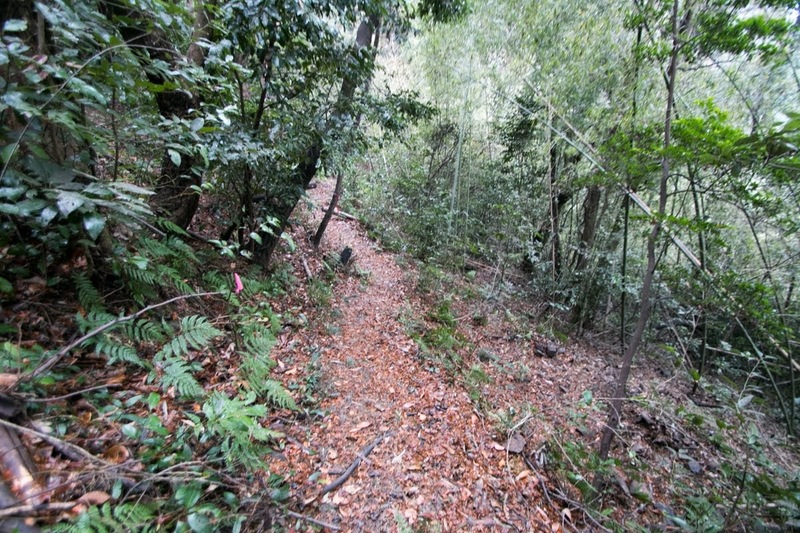 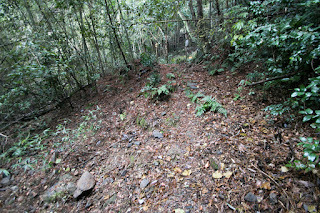 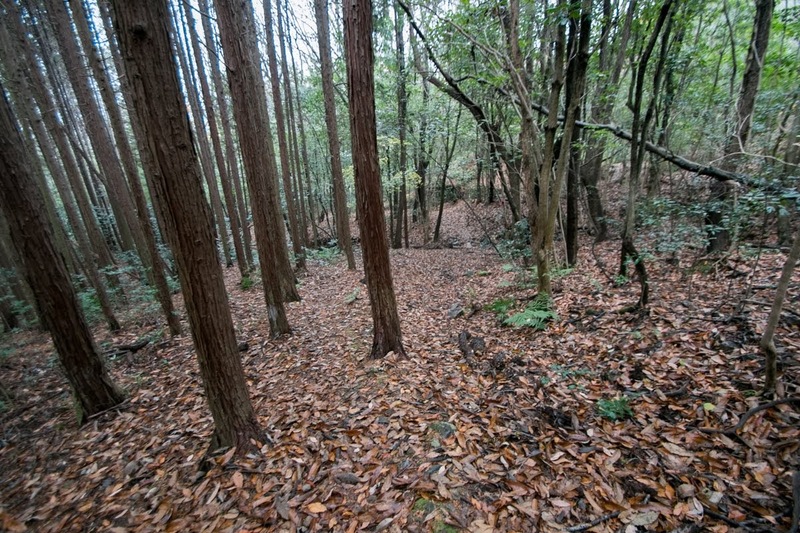 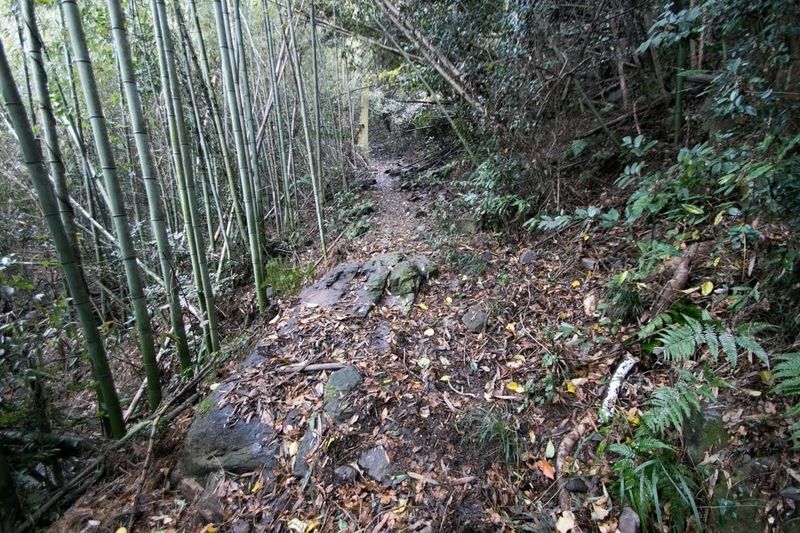 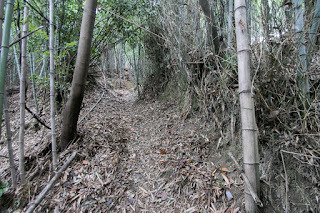 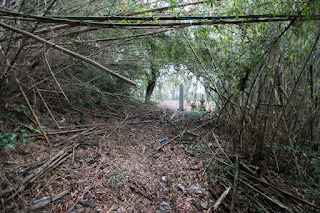 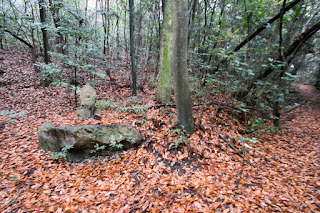 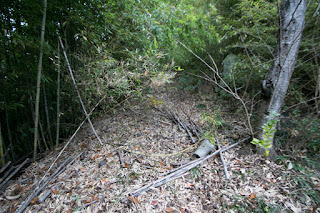 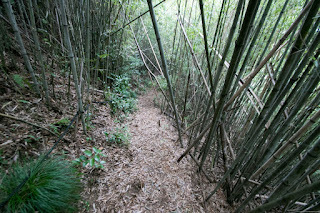 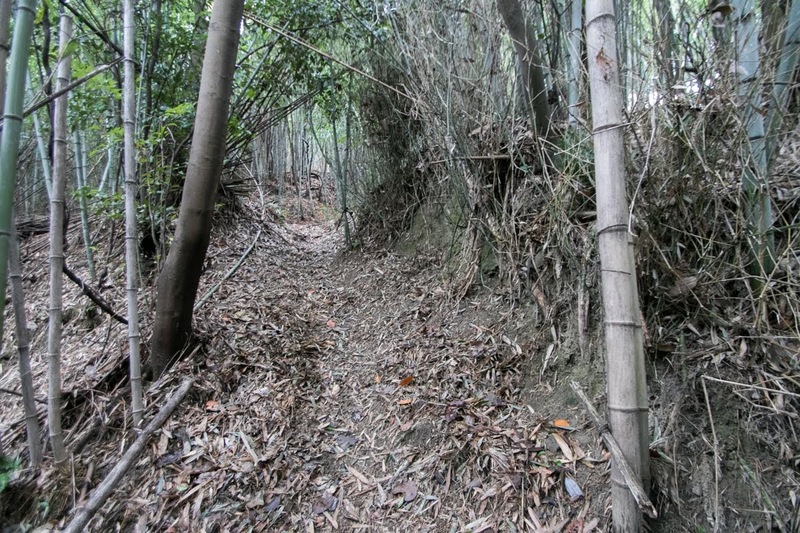 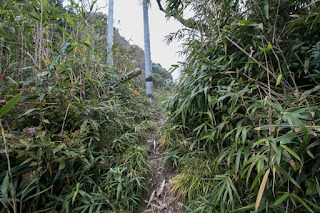 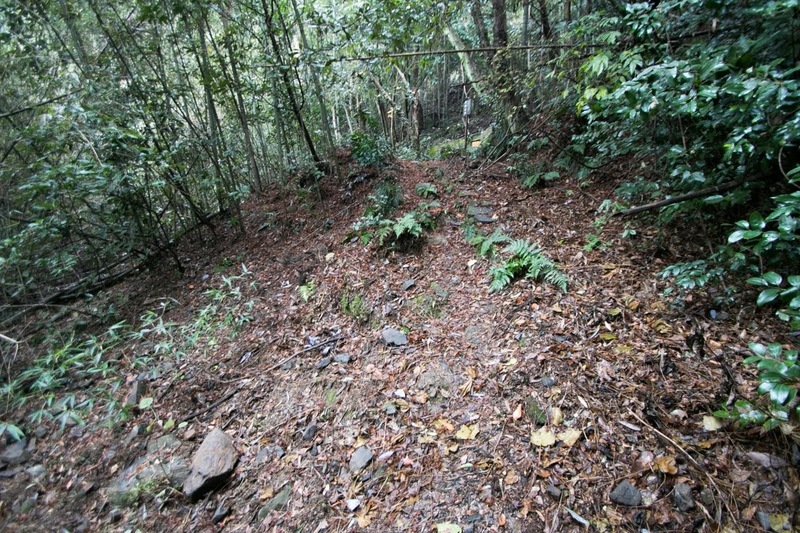 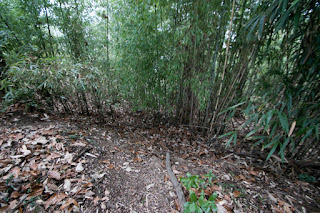 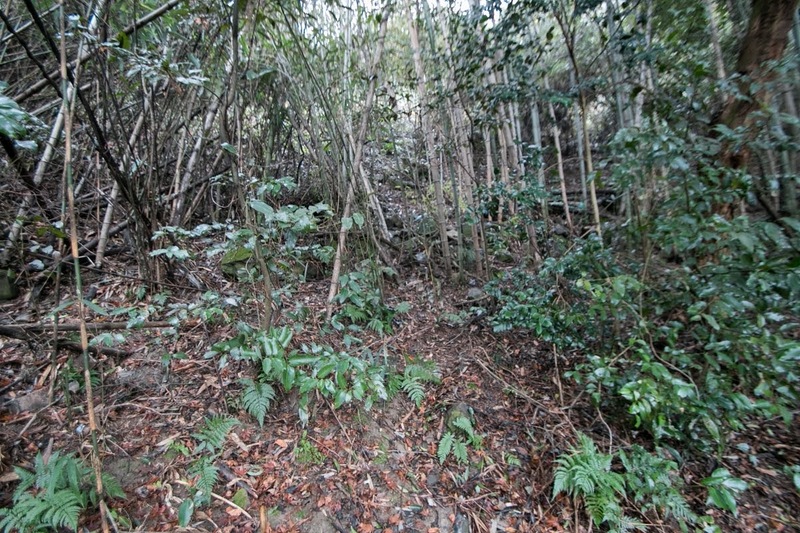 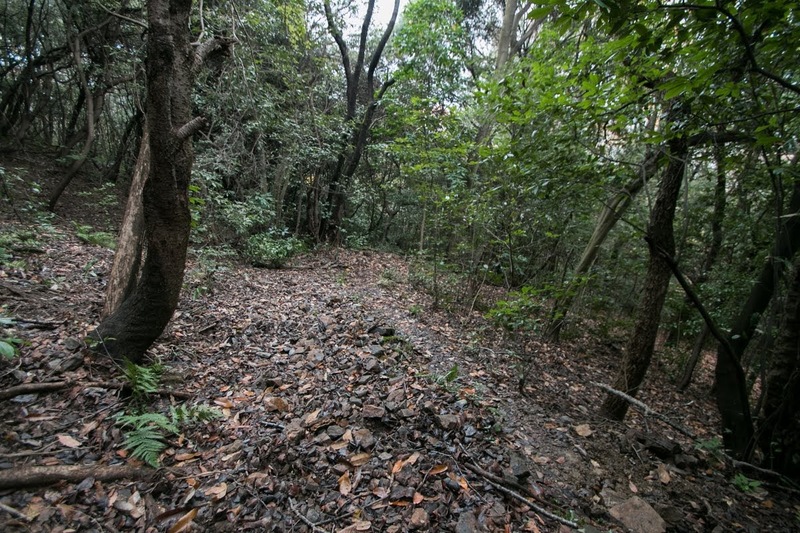 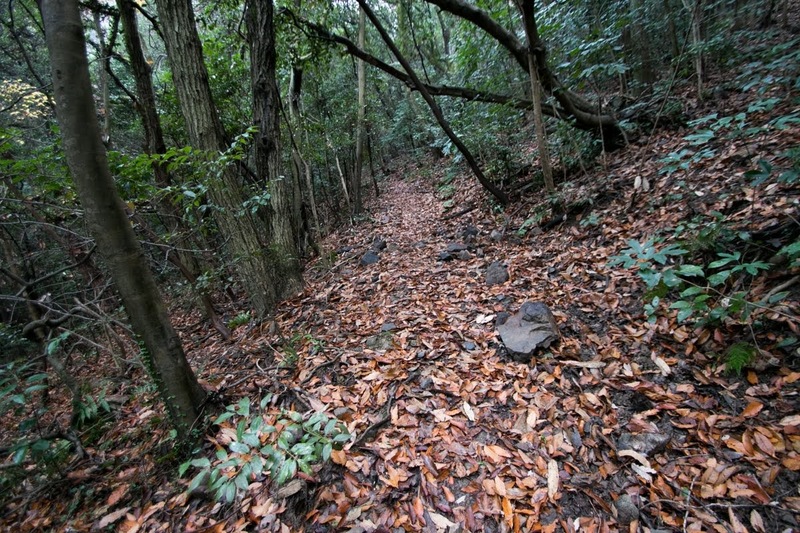 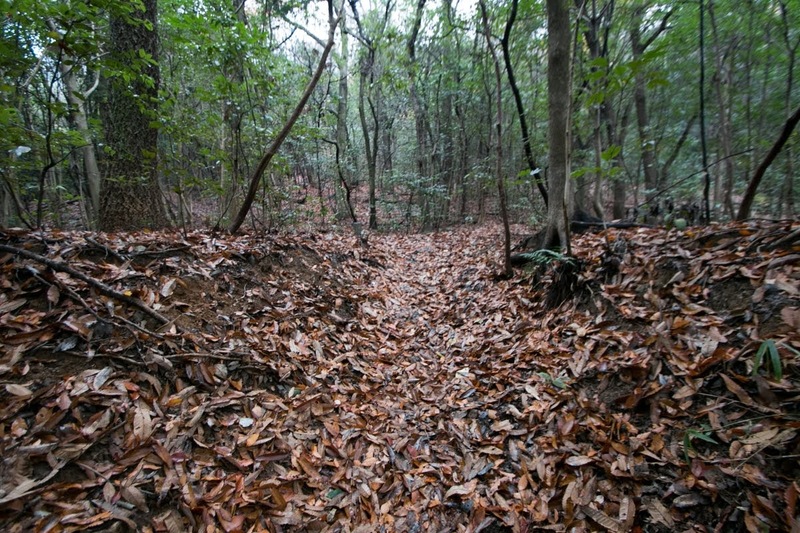 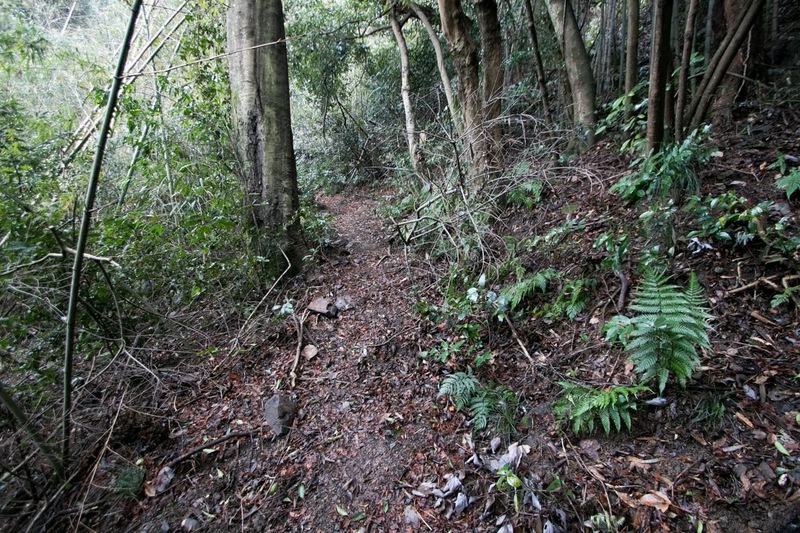 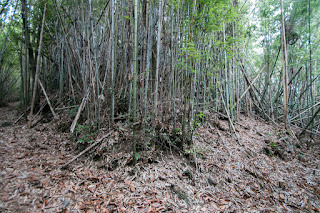 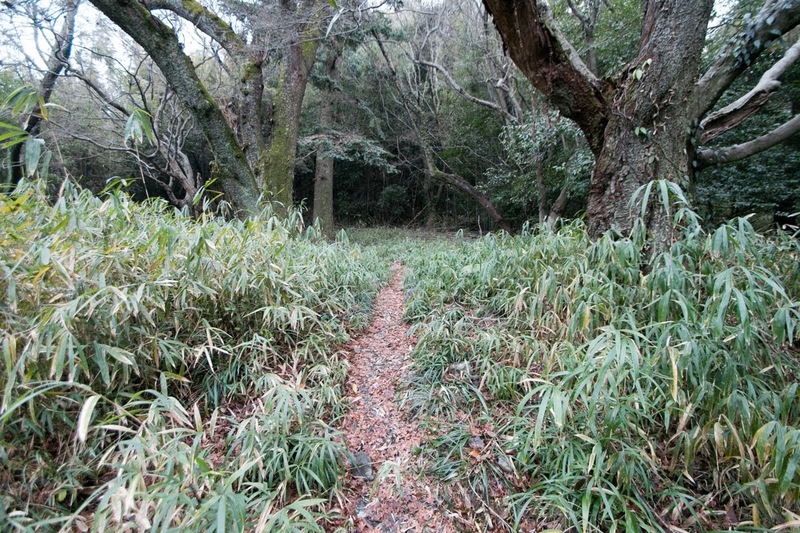 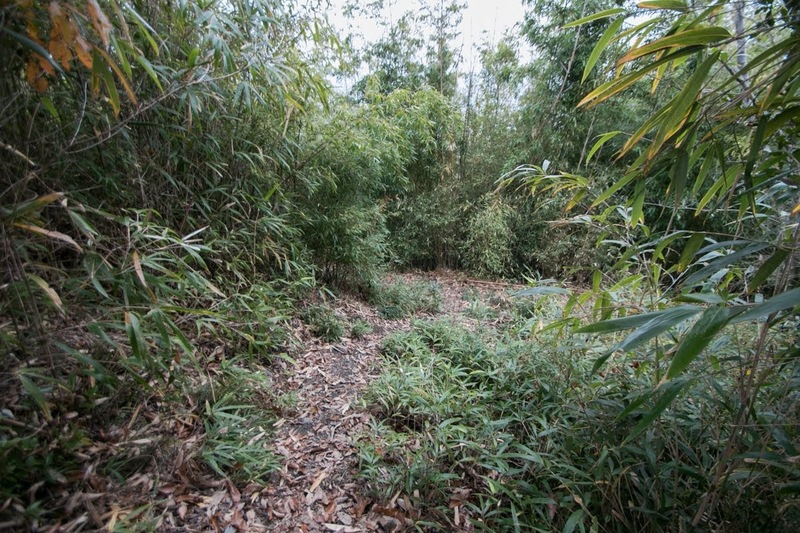 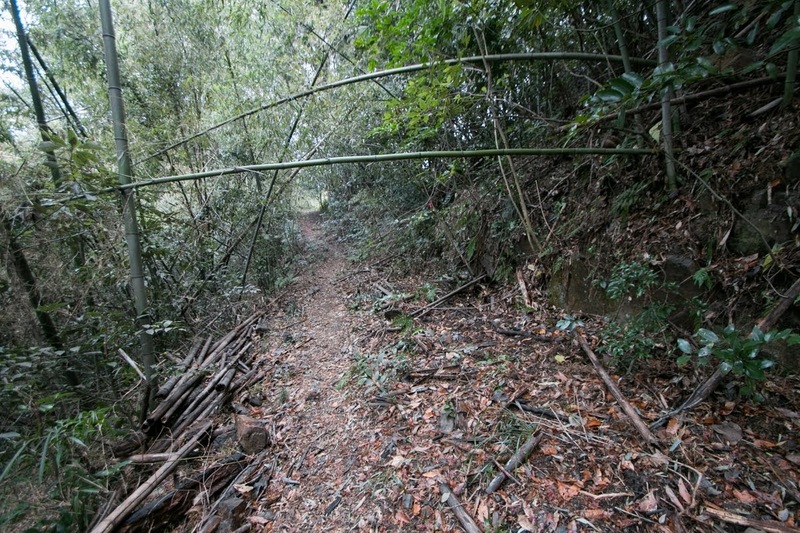 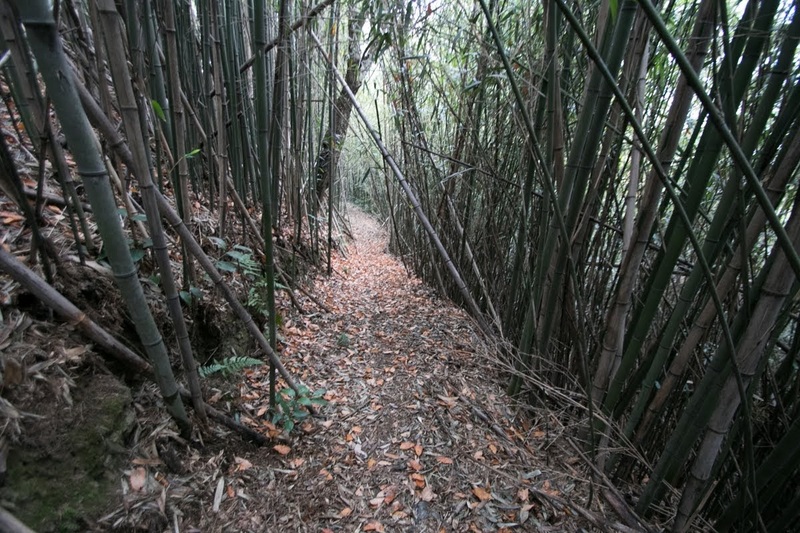 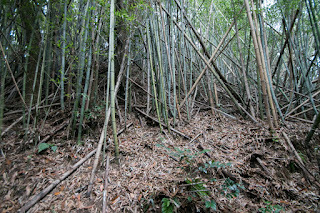 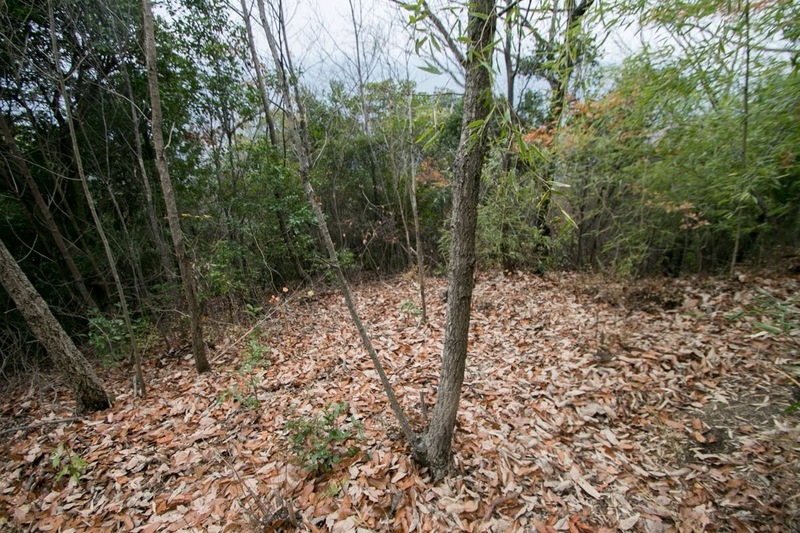 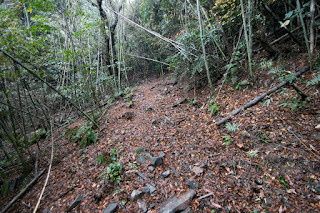 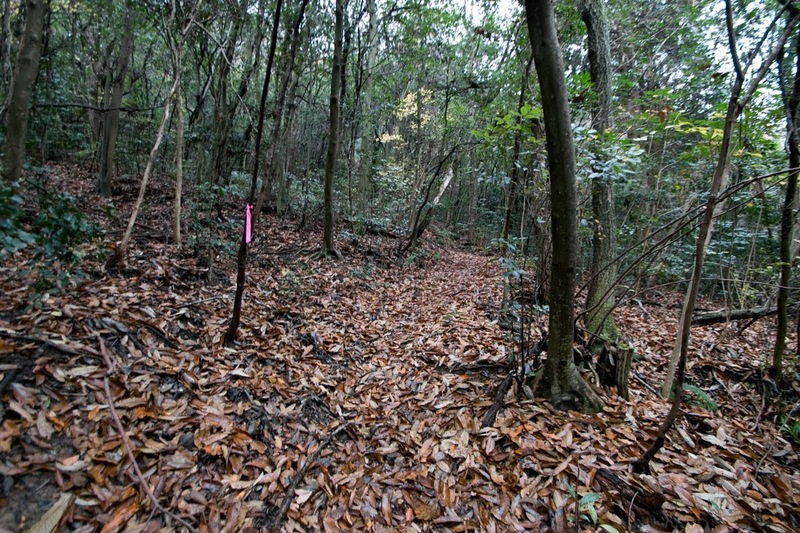 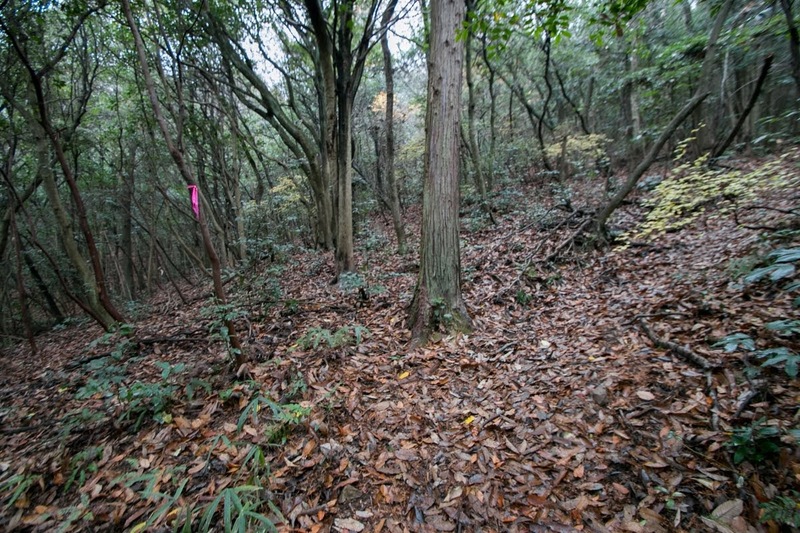 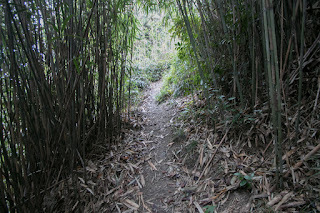 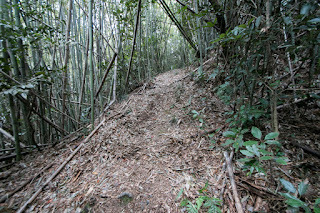 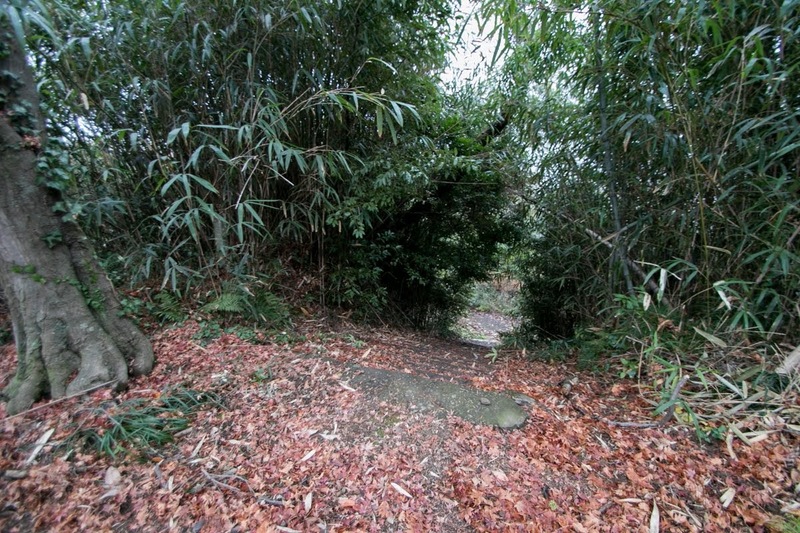 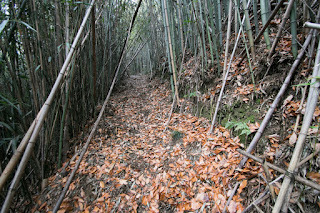 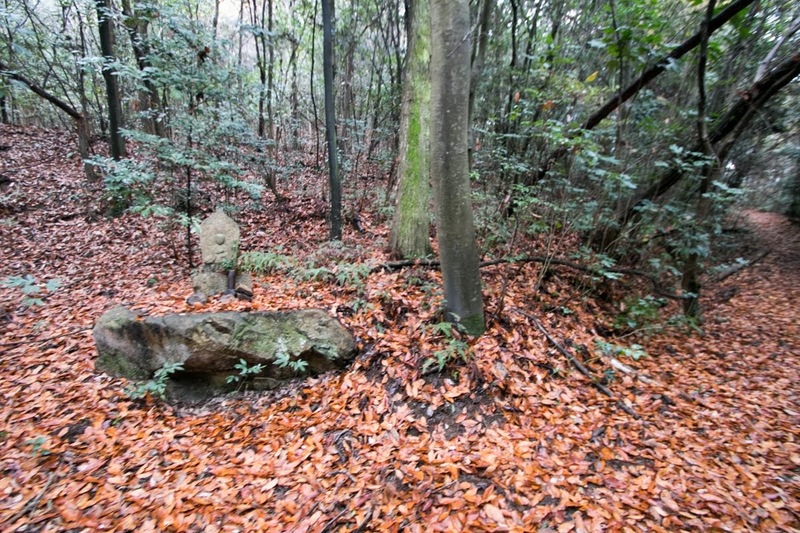 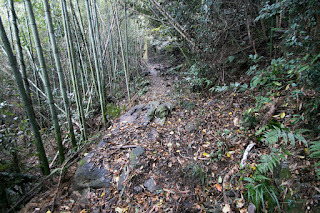 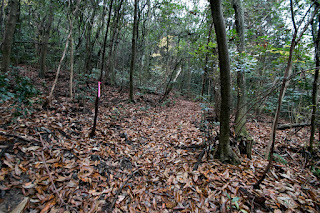 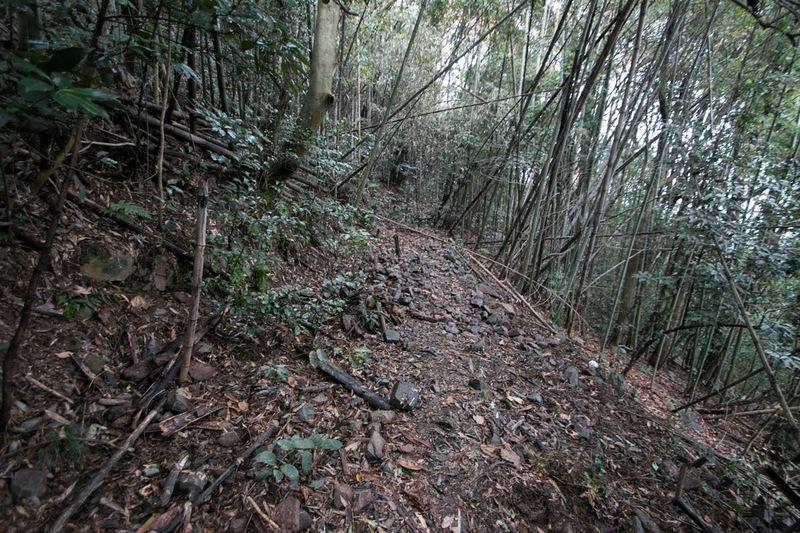 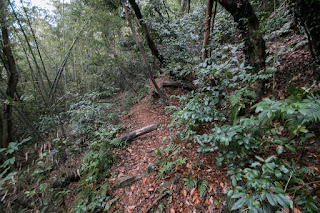 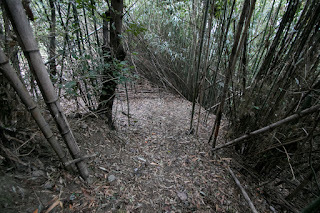 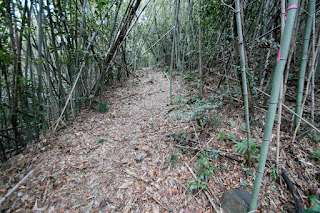 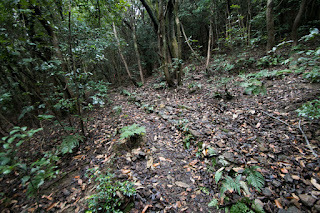 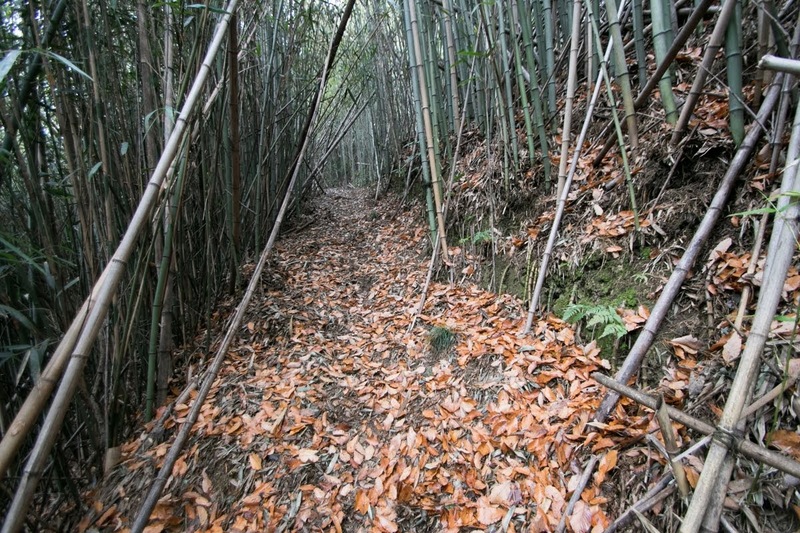 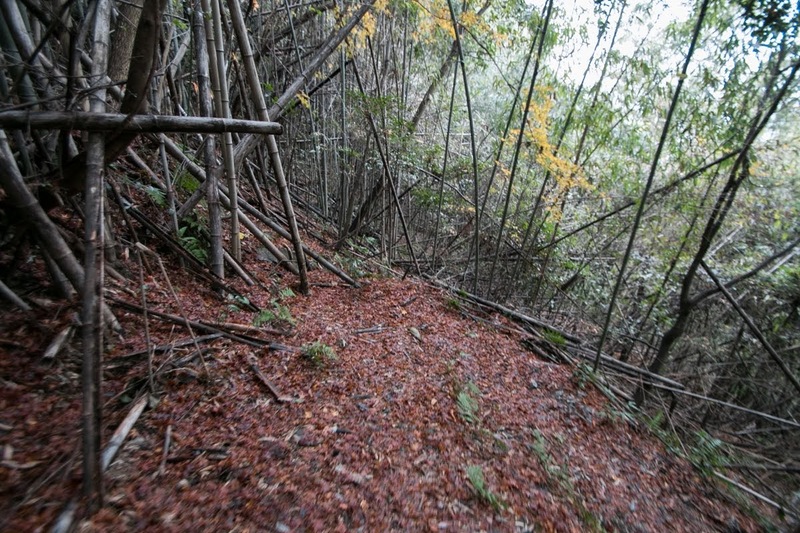 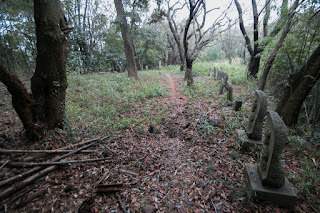 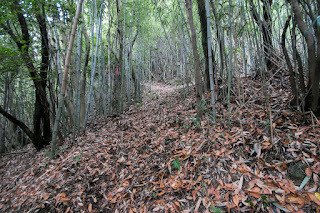 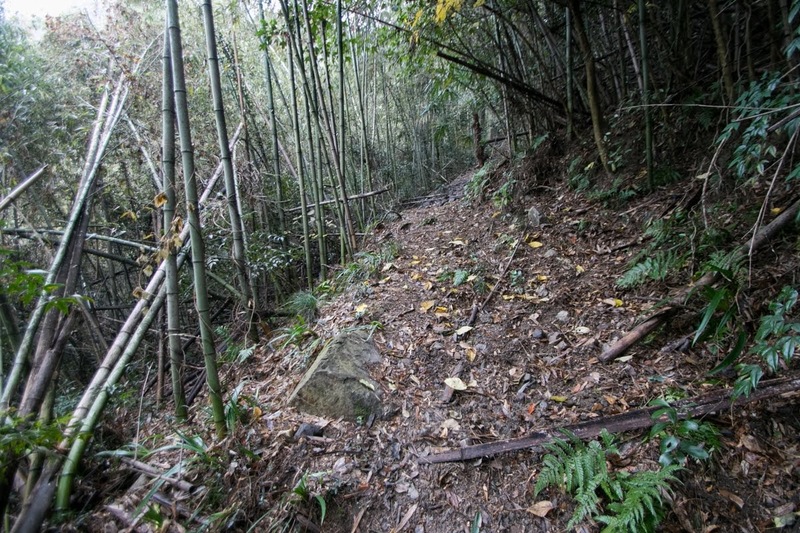 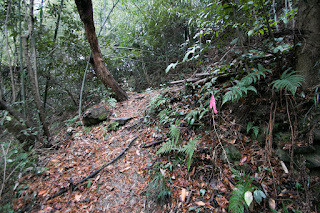 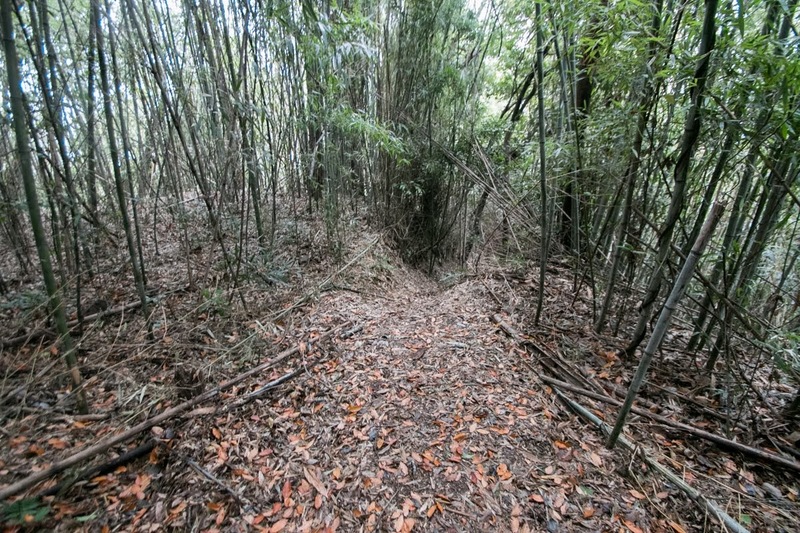 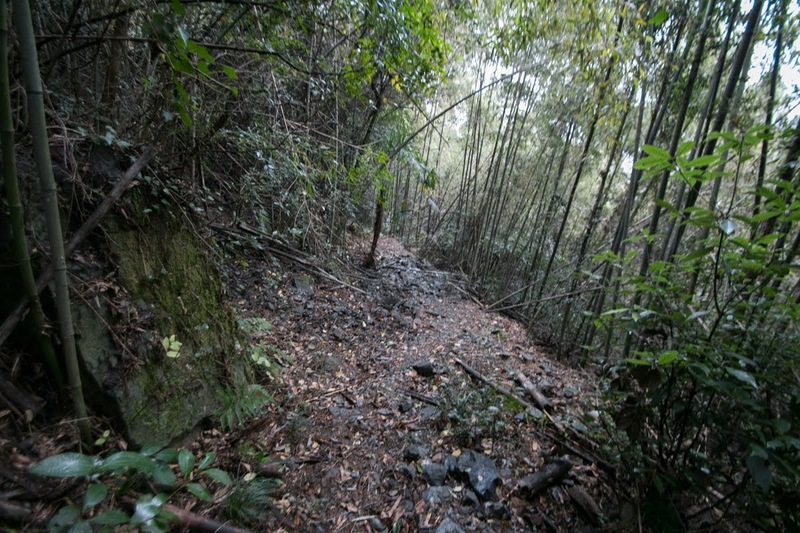 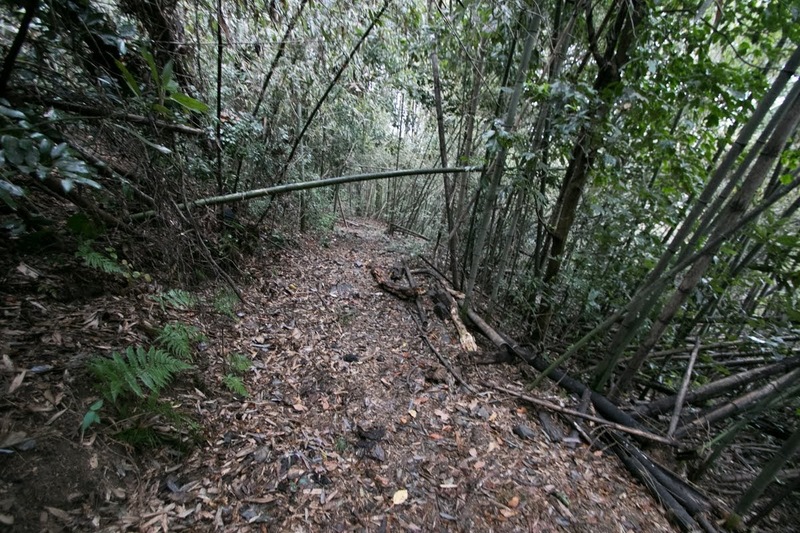 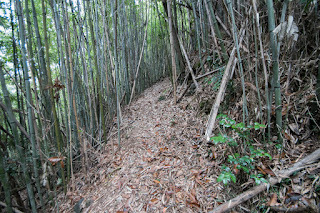 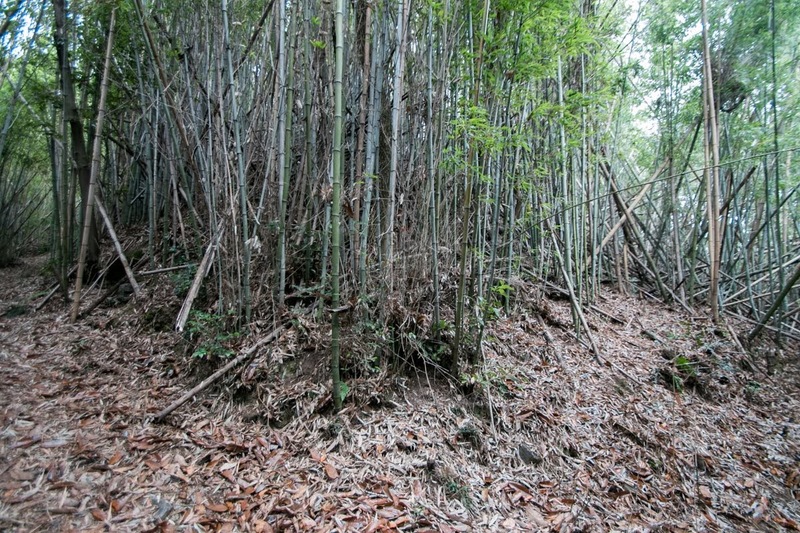 At the slope between two lines, there is a large well called as "Sokonashi Ido" (no bottom well). 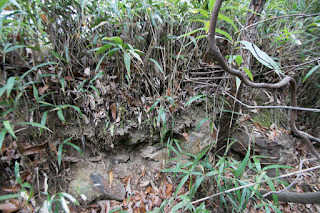 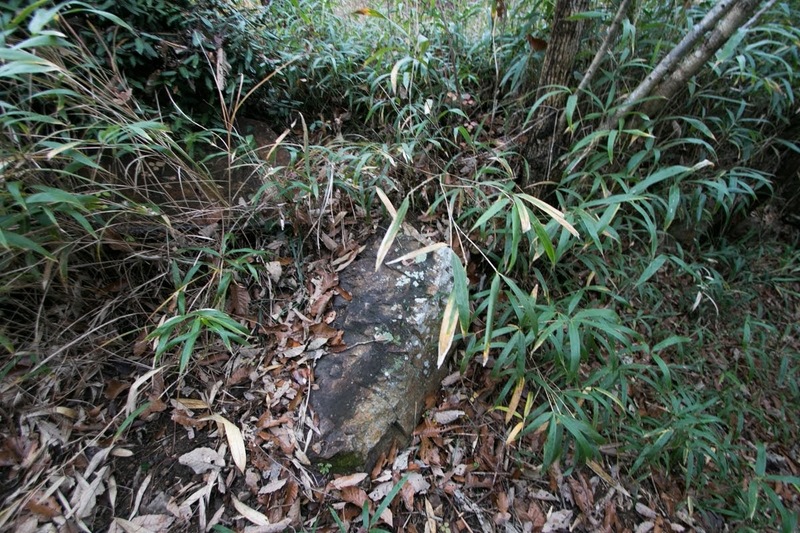 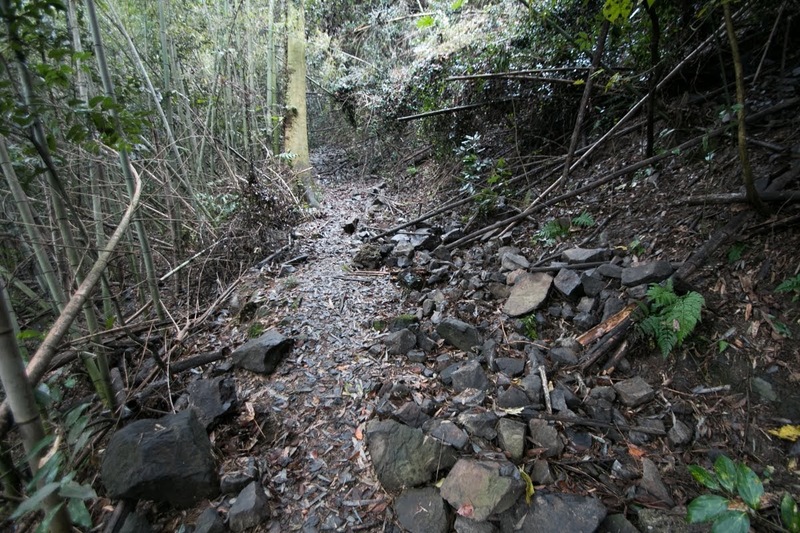 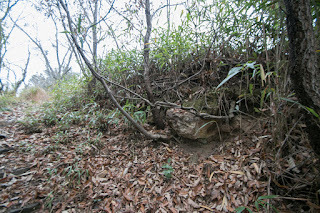 The slope around the well is protected by stone walls. 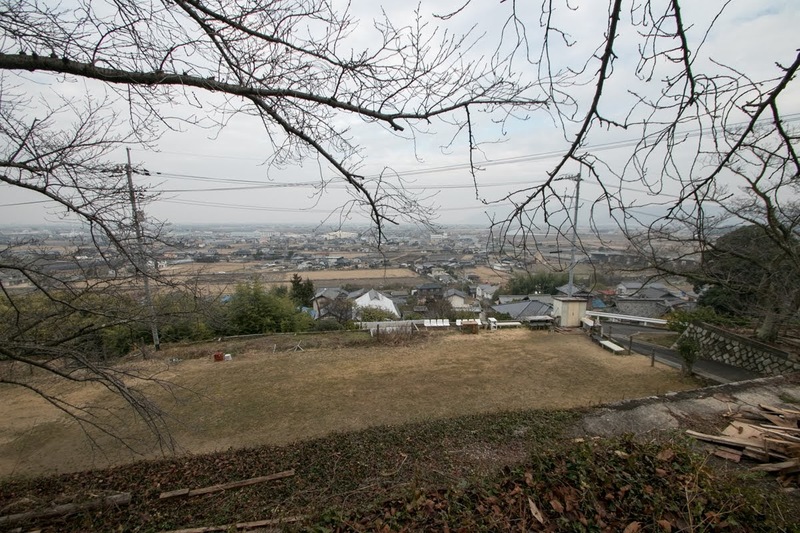 Total size of the castle is about 300 meter square, and considerably large one at the province except for main bases of strong lords. 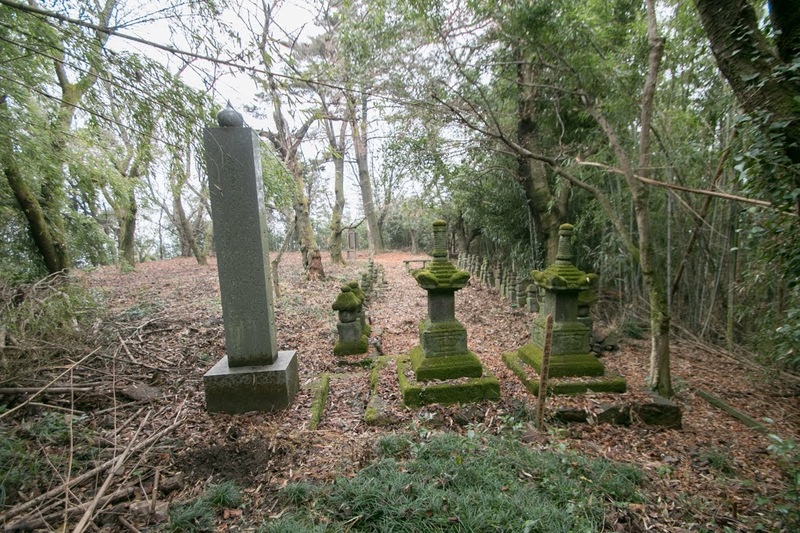 After the death of Hideyasu, his son Tatsuyasu Togawa (1567-1628) once supported Ukita clan but later left it as a result of internal conflict. 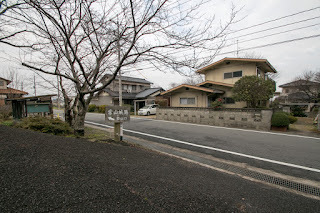 Later Togawa clan served to Ieyasu Tokugawa (1543-1616) and became the lord of Niwase castle (Okayama prefecture) at neighbor place. 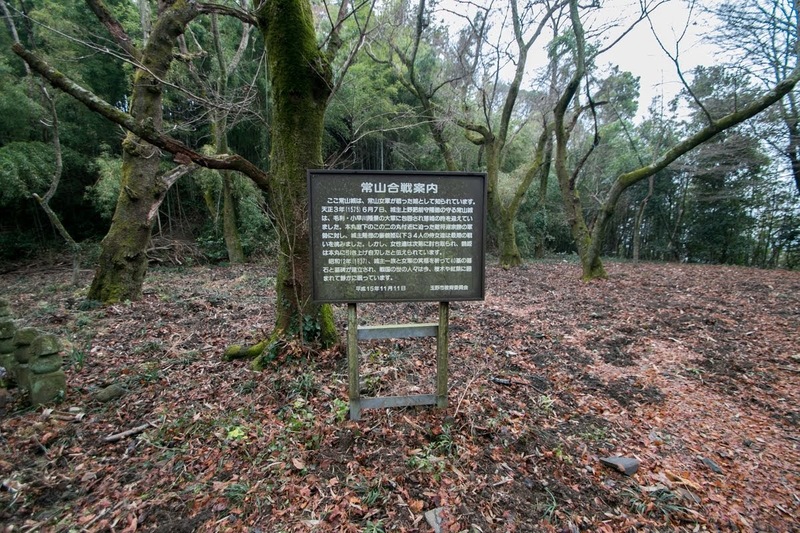 As a result of the battle of Sekigahara occurred in 1600, Ukita clan was expelled thus Kobayakawa clan became the lord of former Ukita territory. 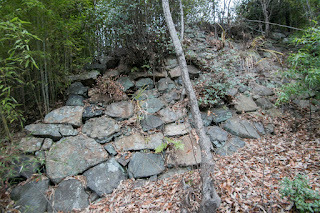 Tsuneyama castle was kept as a branch castle of the domain, but later Ikeda clan which became the lord of Okayama domain after Kobayakawa clan newly built Shimotsui castle at the south edge of Kojima area and abolished Tsuneyama castle. 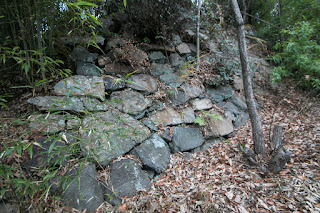 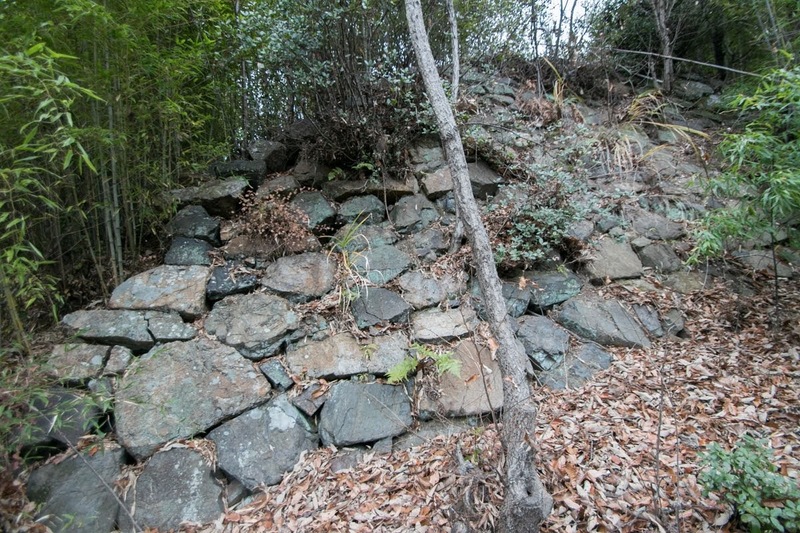 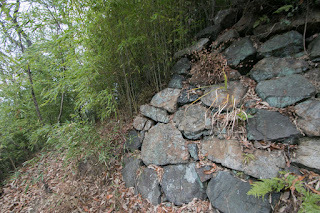 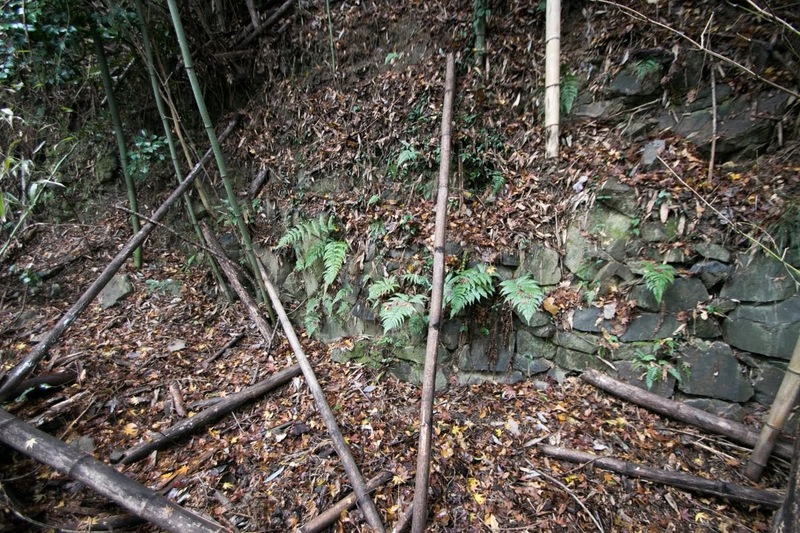 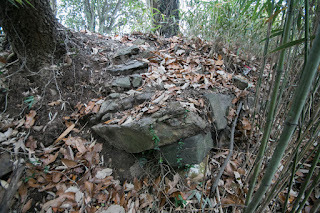 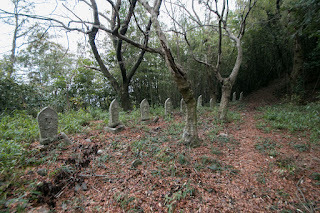 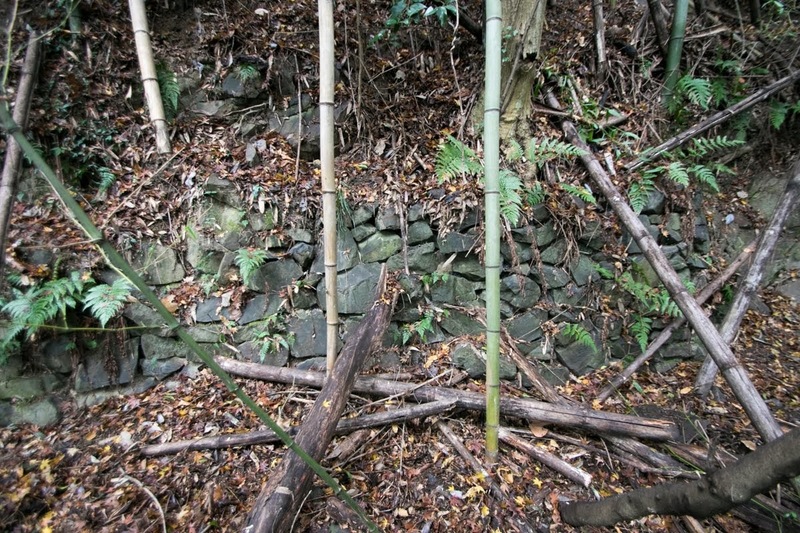 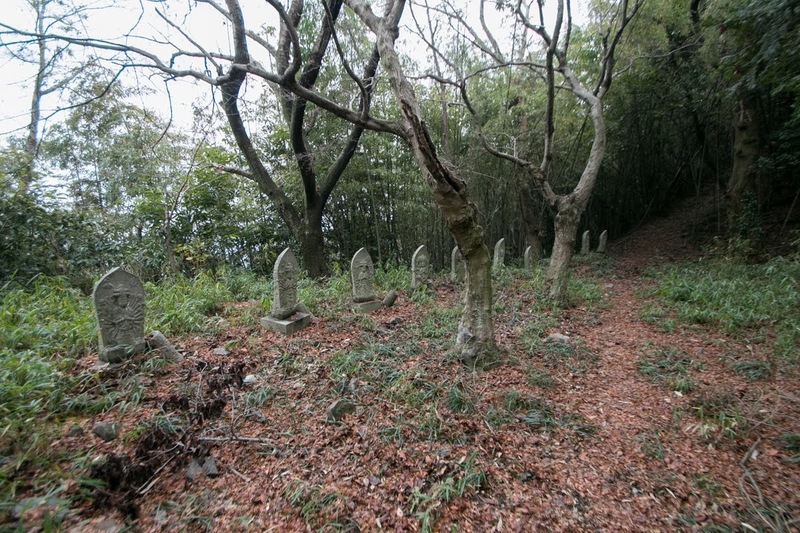 Stones walls of Tsuneyama castle were dismantled and used as material for Shimotsui castle (Okayama prefecture). 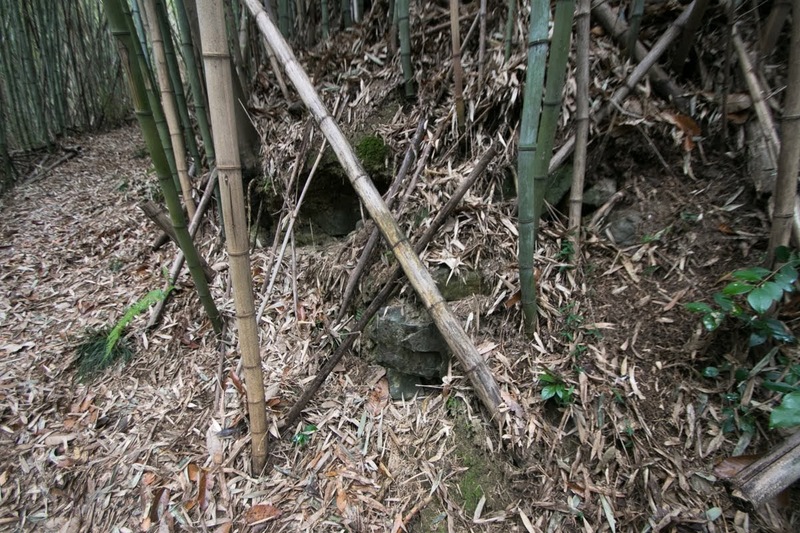 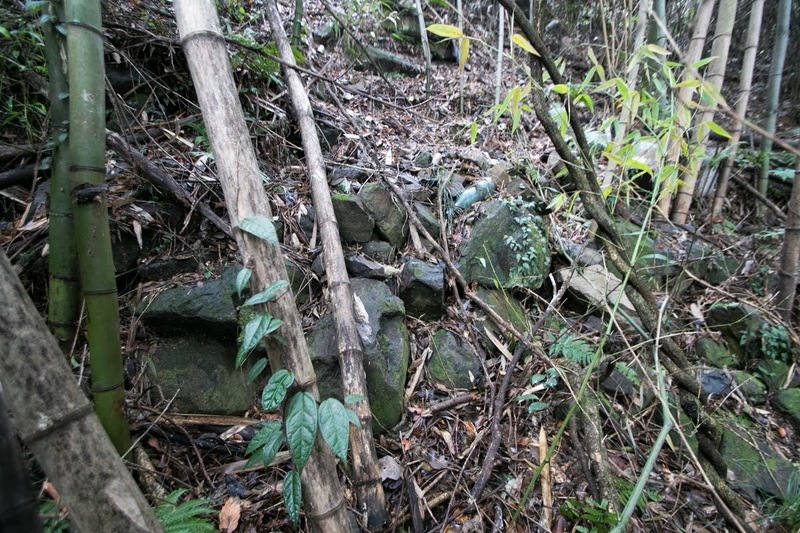 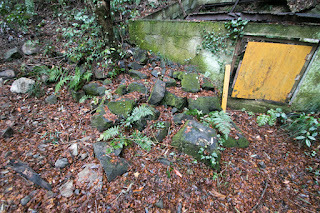 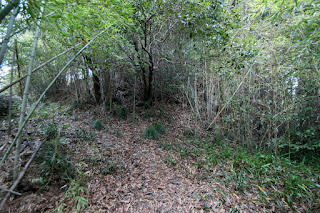 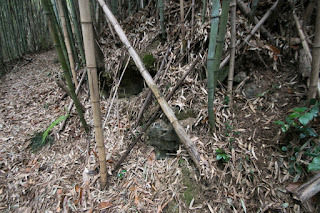 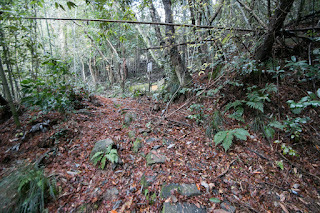 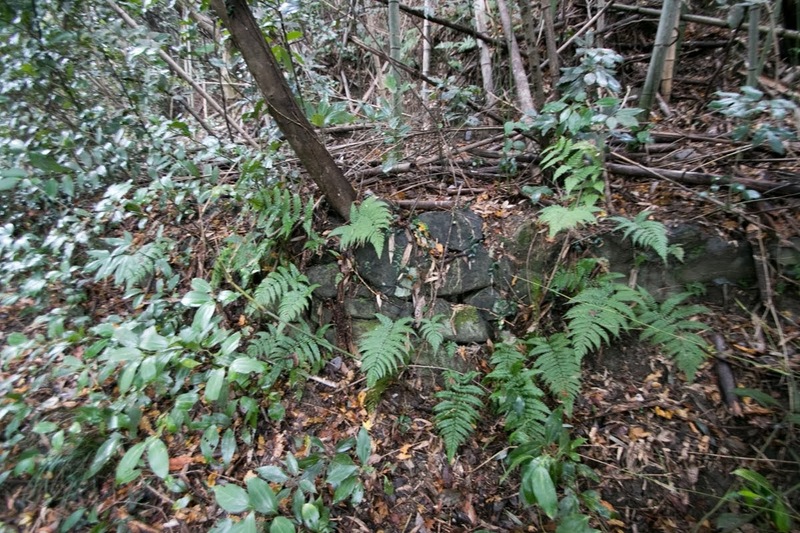 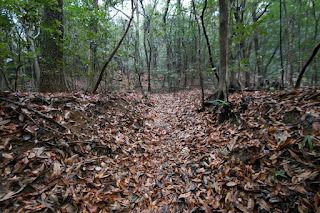 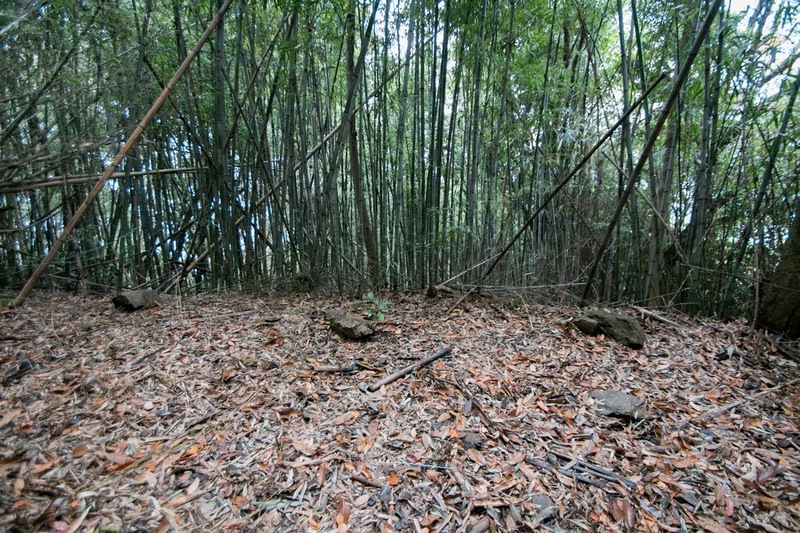 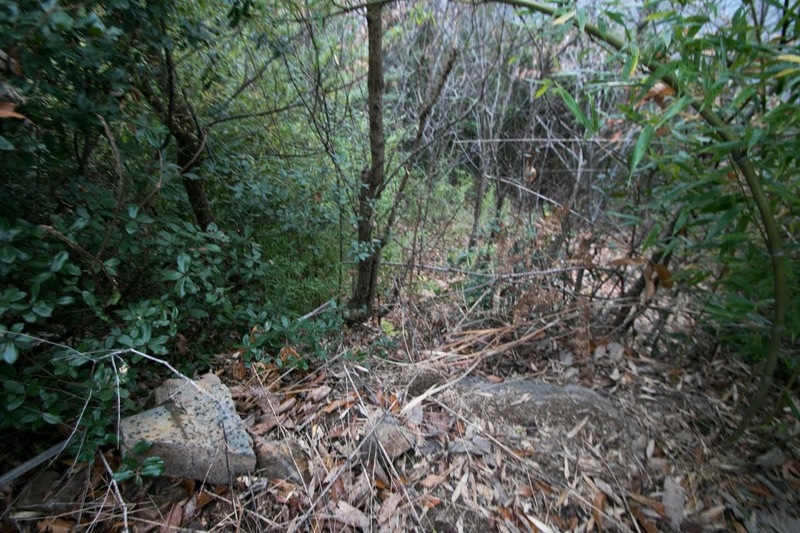 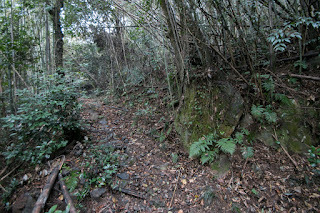 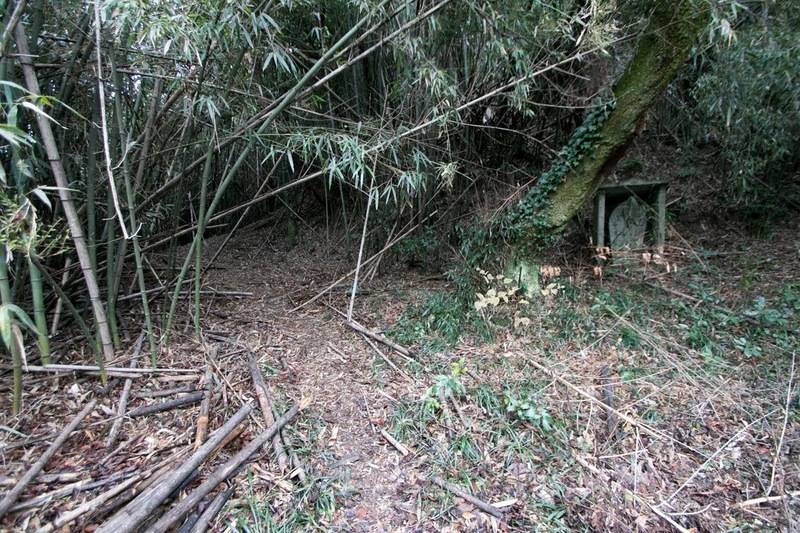 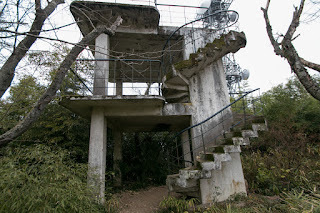 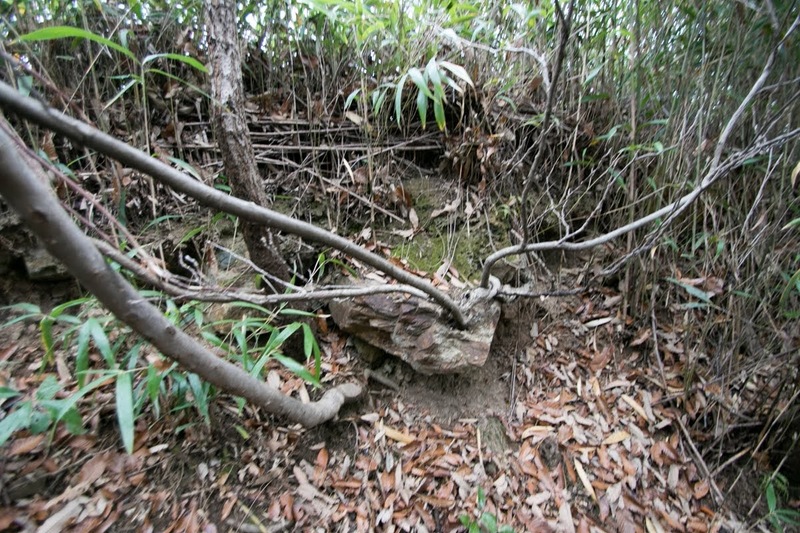 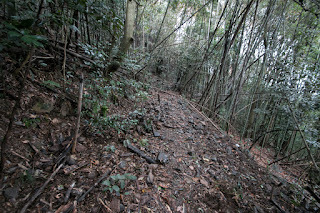 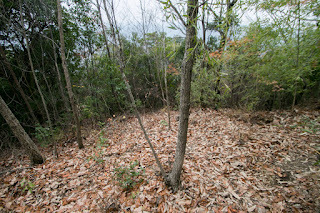 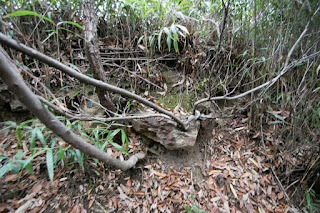 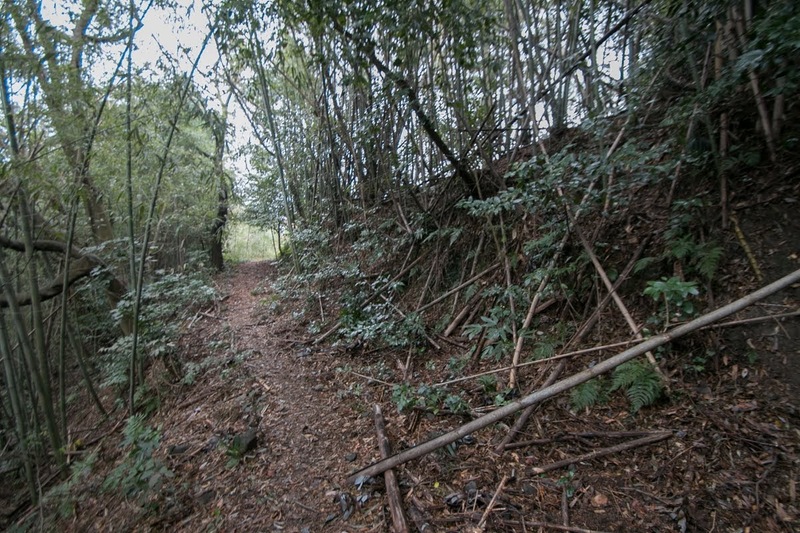 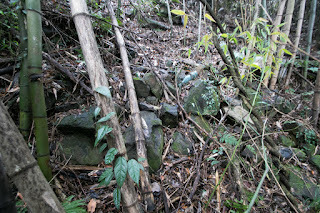 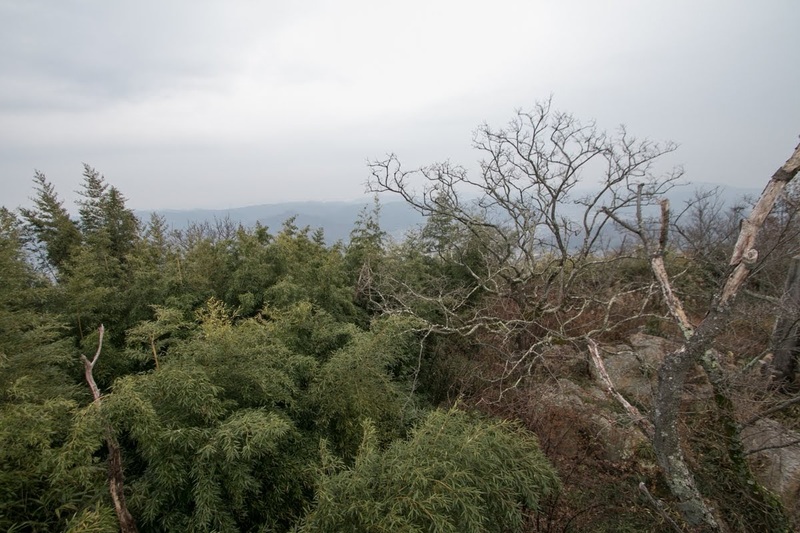 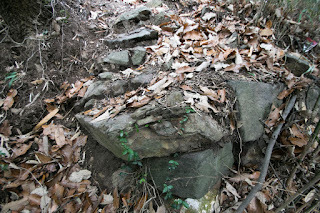 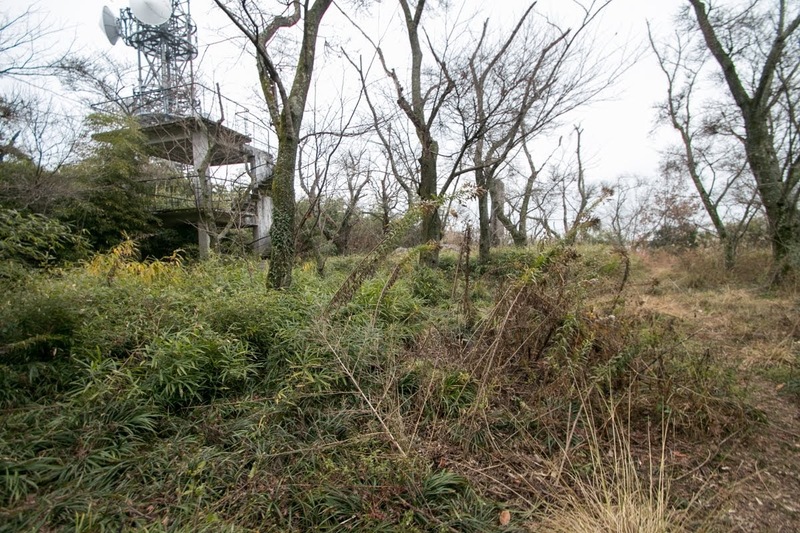 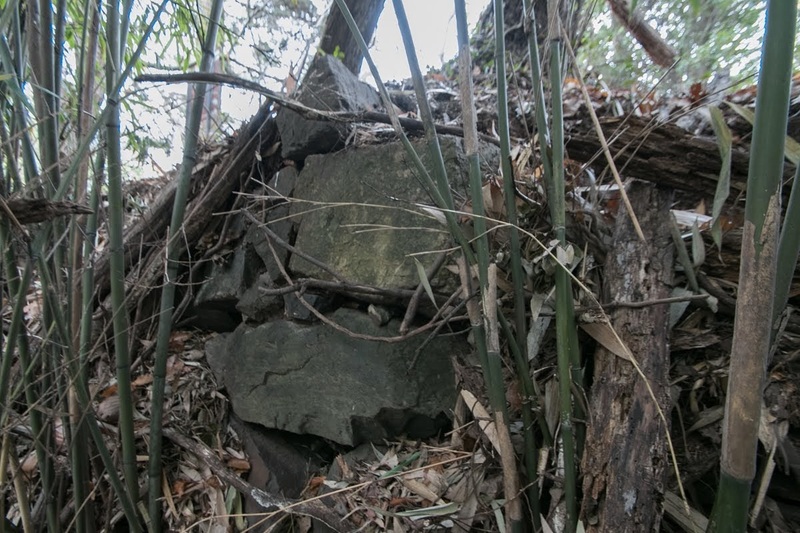 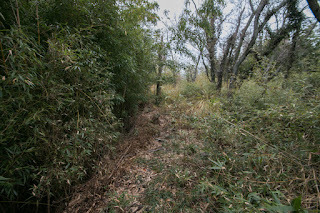 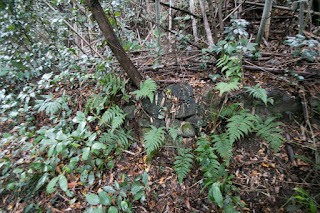 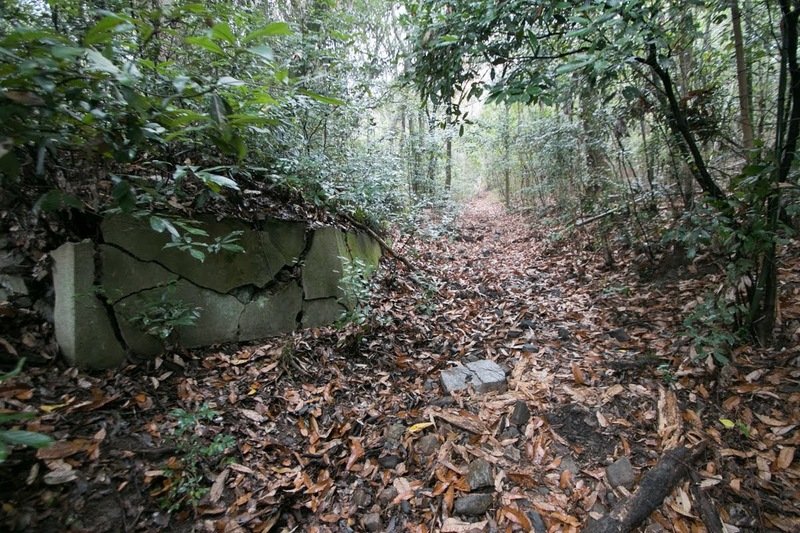 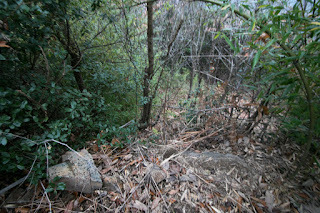 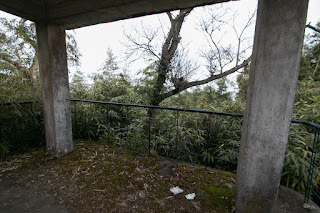 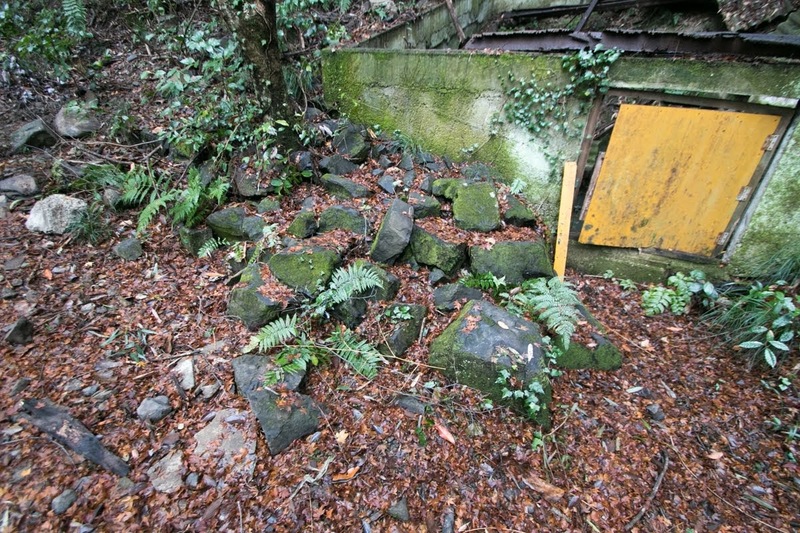 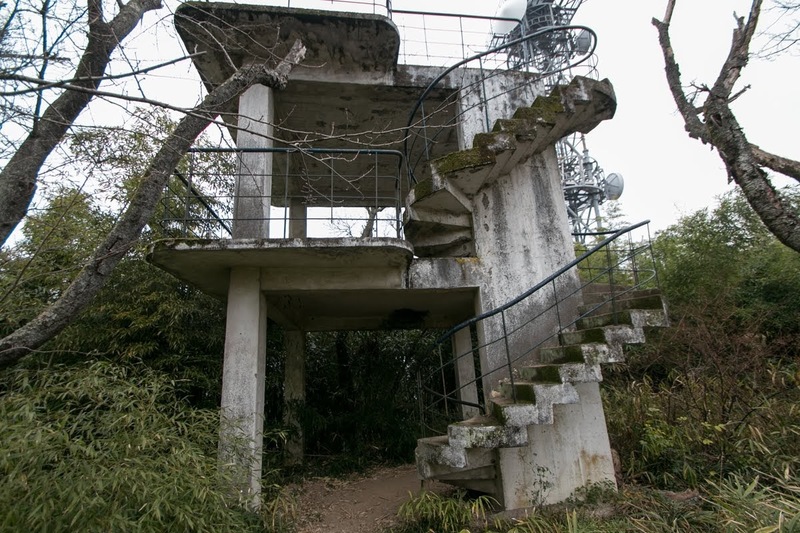 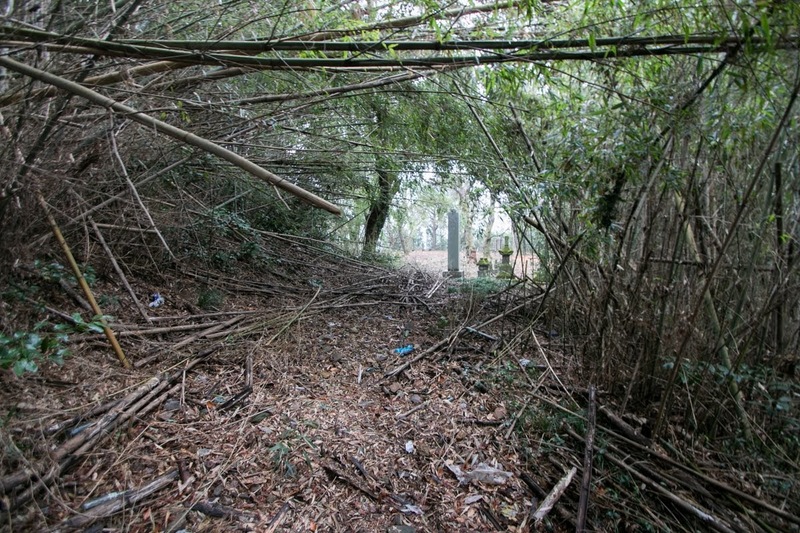 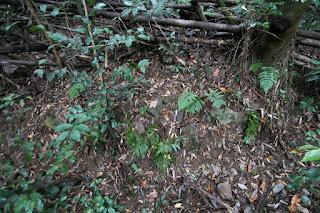 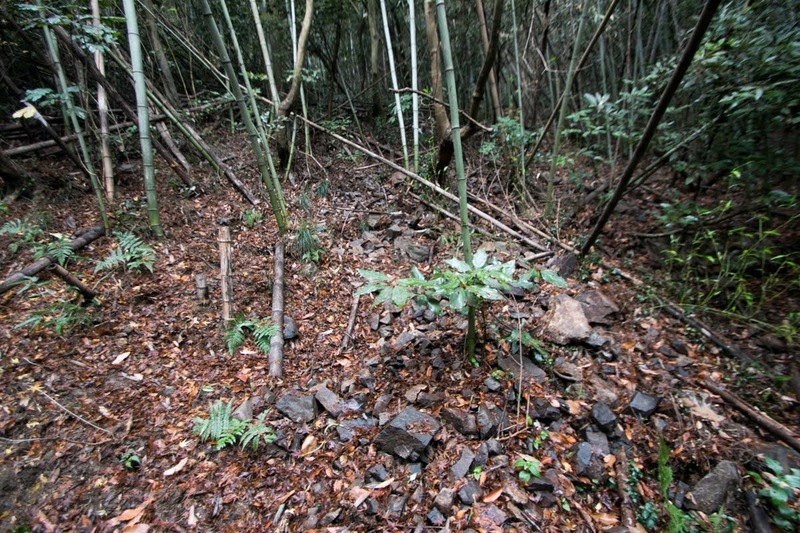 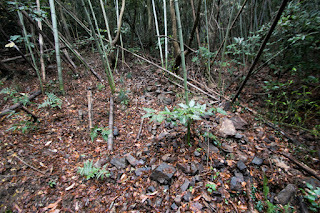 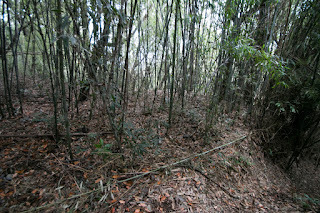 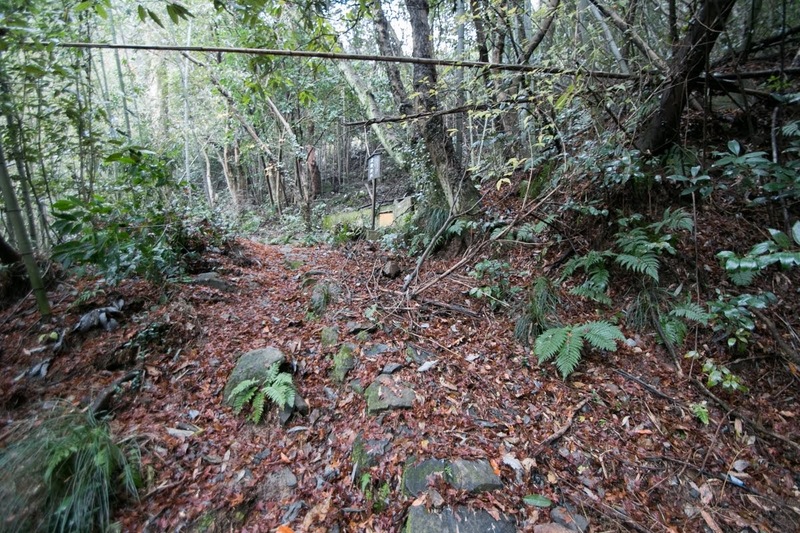 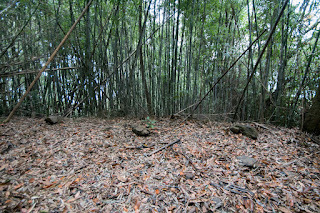 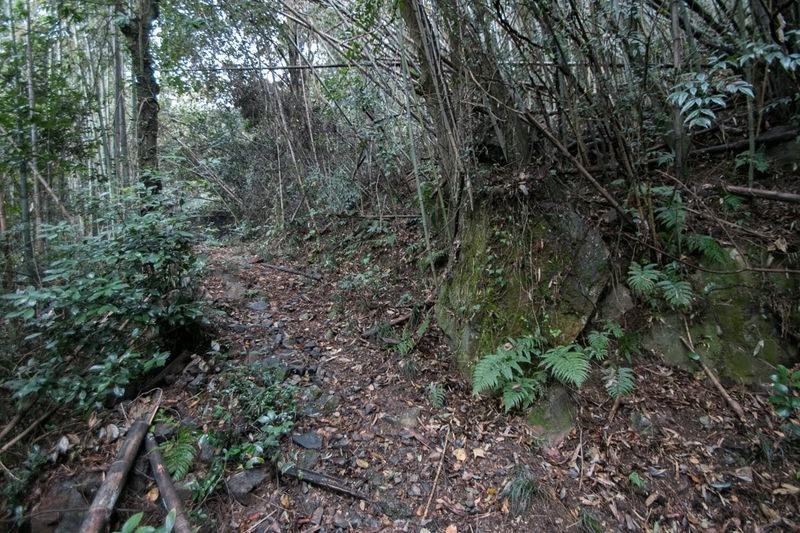 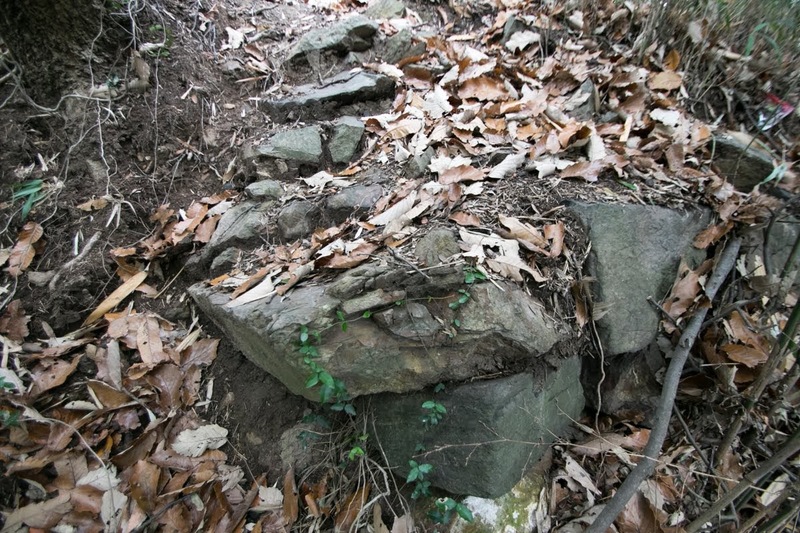 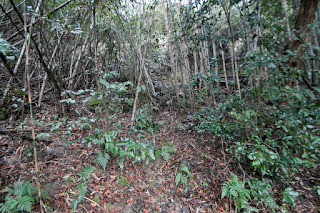 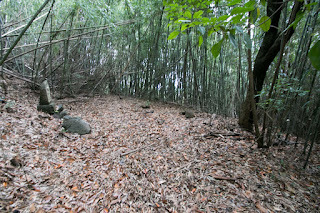 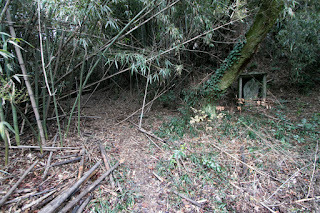 Now certain part of structures was lost by destruction and building of radio transmitter buildings, but overall shape and partial stone walls still remain in the bushes. 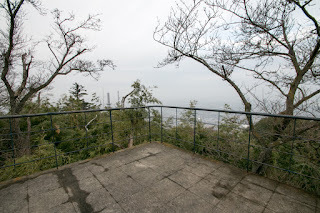 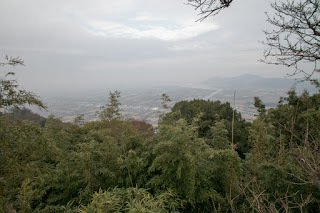 From the central area of the mountain, beautiful scenery of Kojima plain and Seto-Naikai sea is seen. 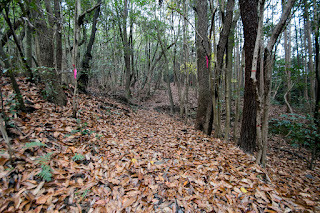 It is hoped that tragic princess and her army at least could see this beautiful scenery before the end of their lives. 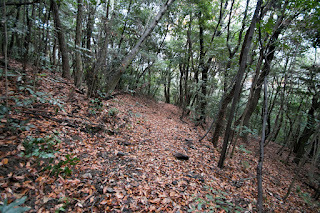 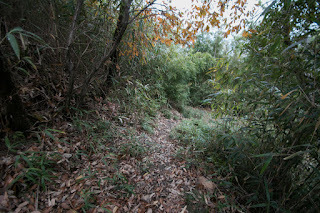 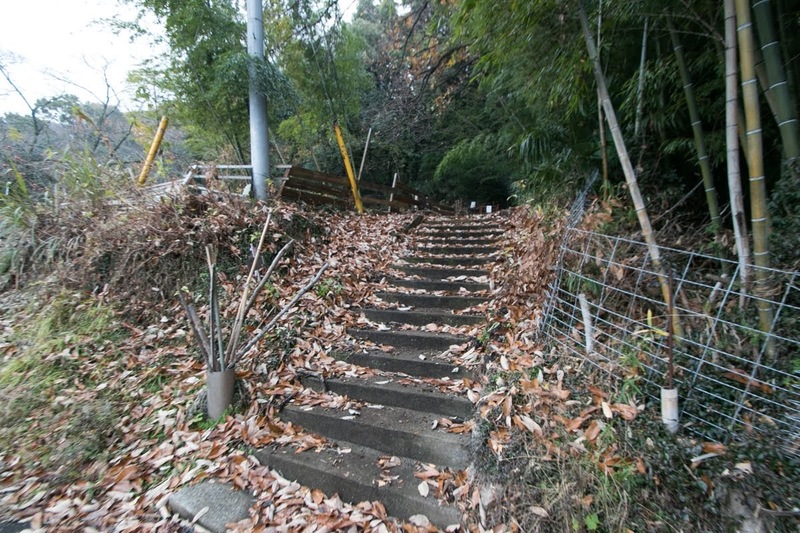 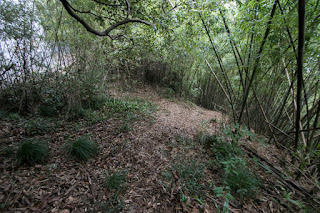 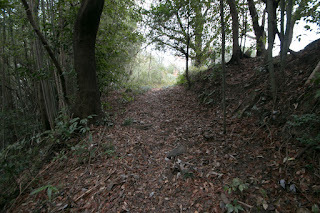 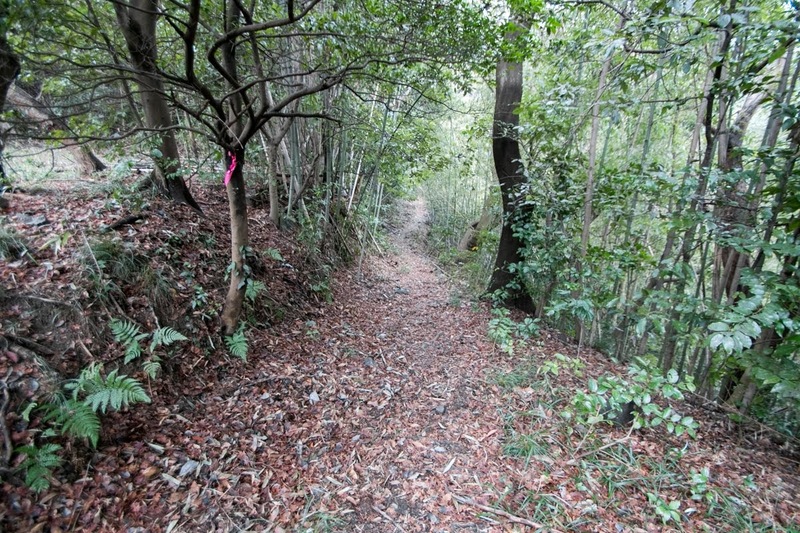 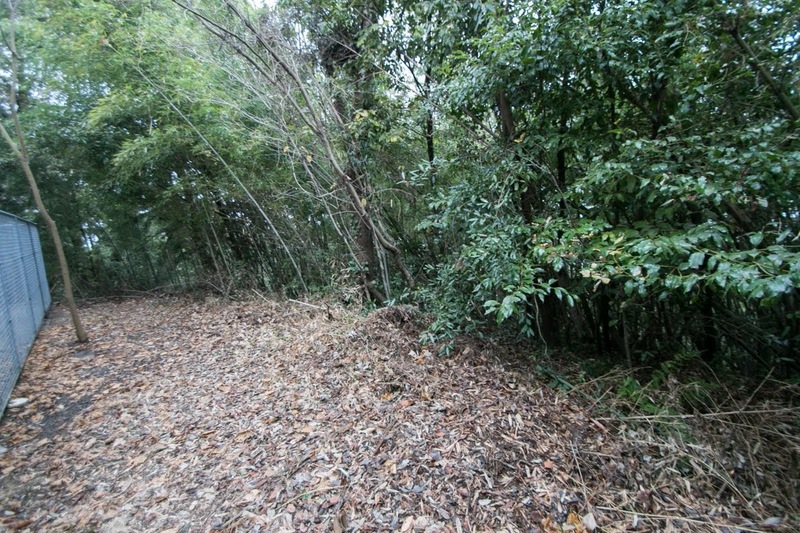 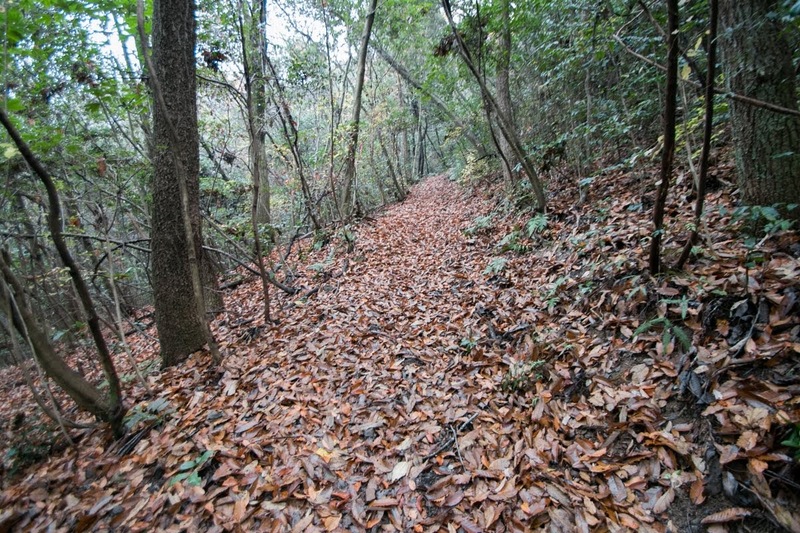 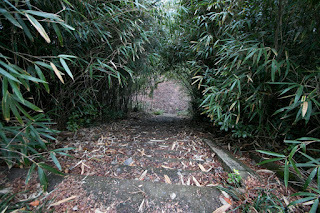 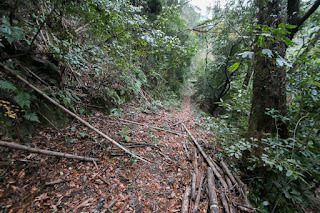 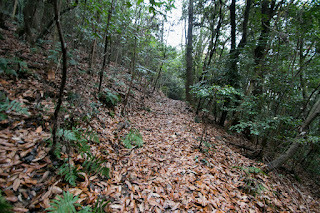 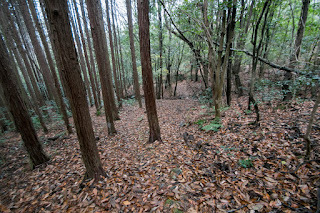 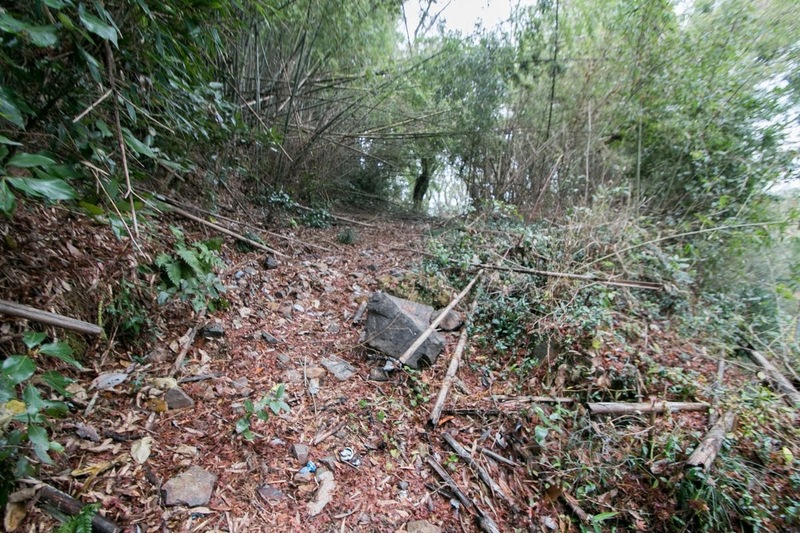 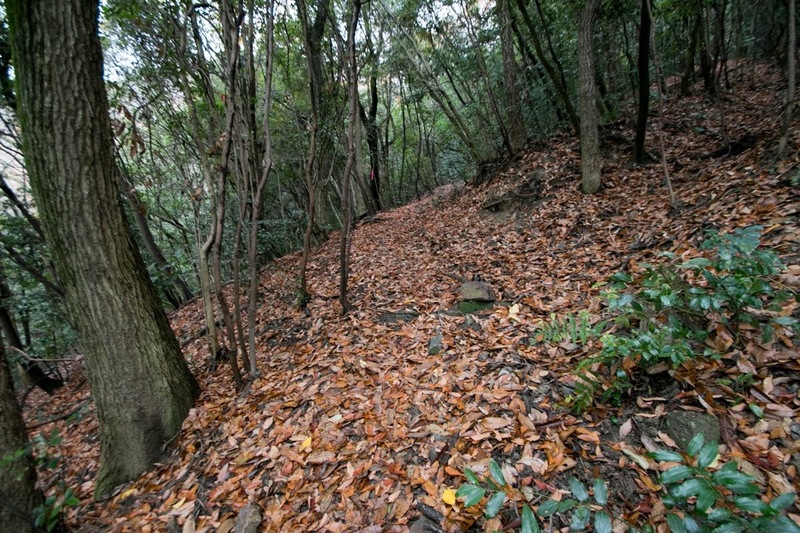 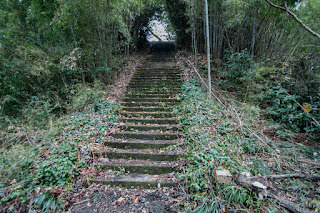 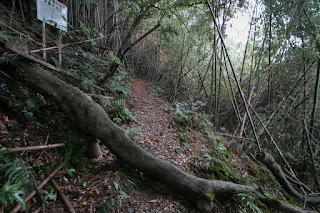 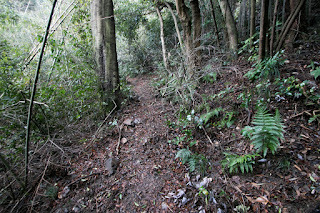 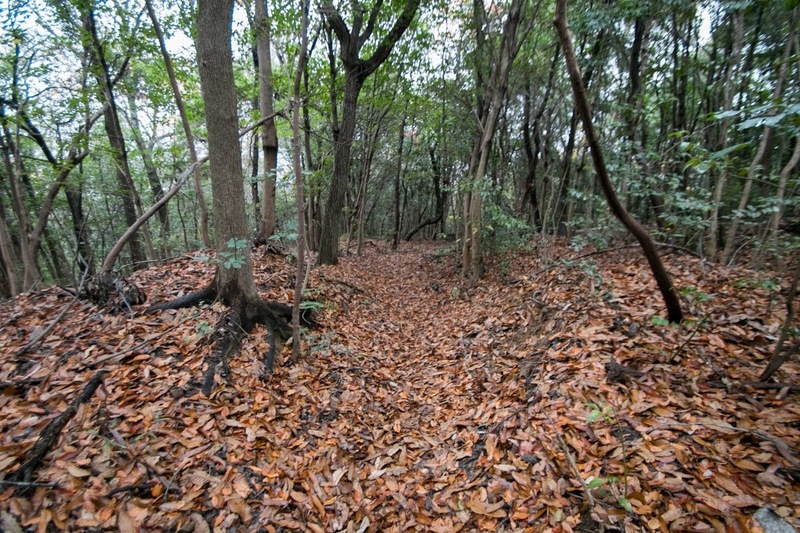 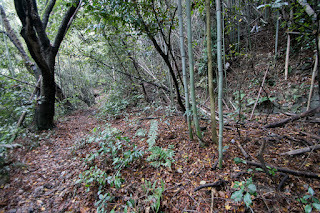 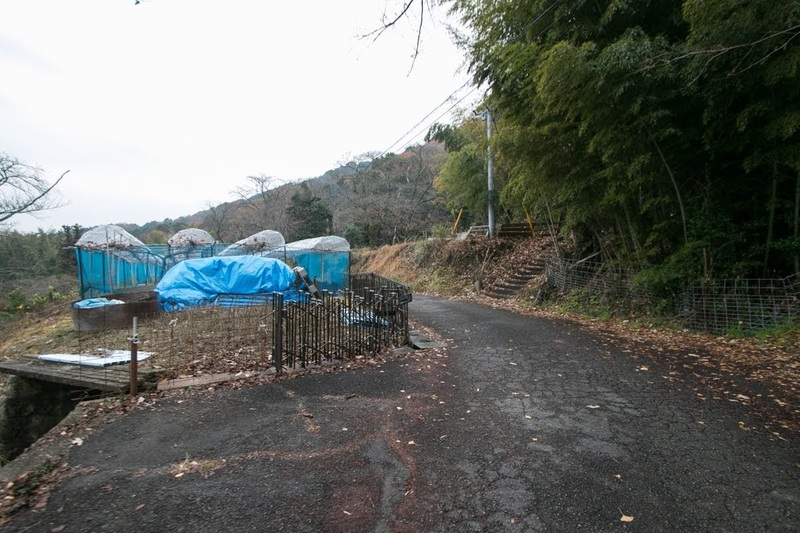 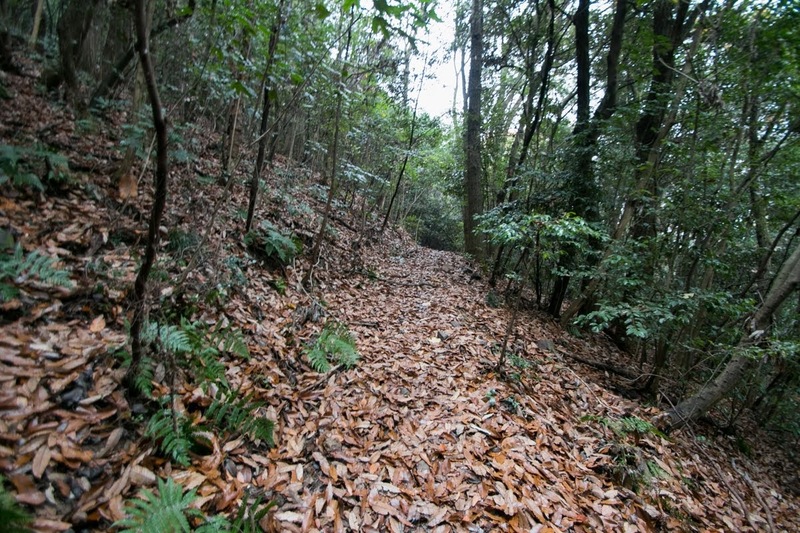 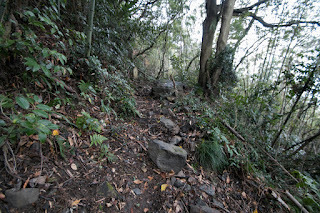 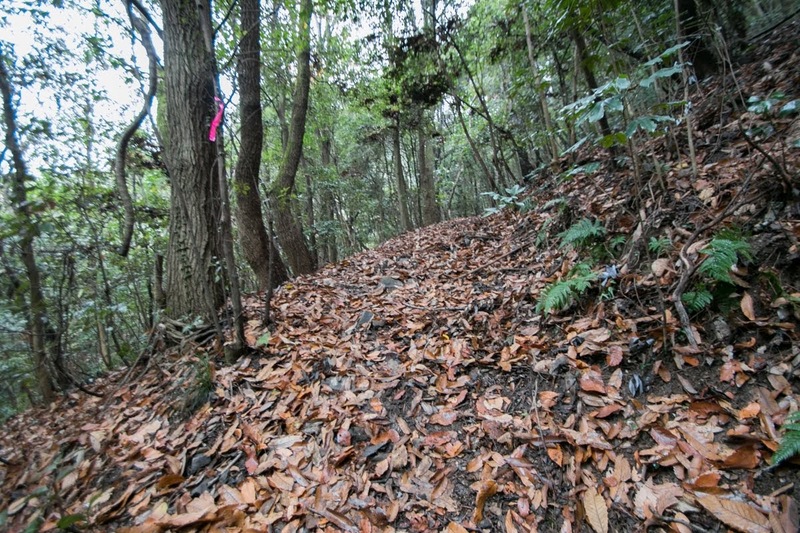 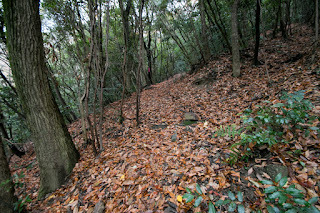 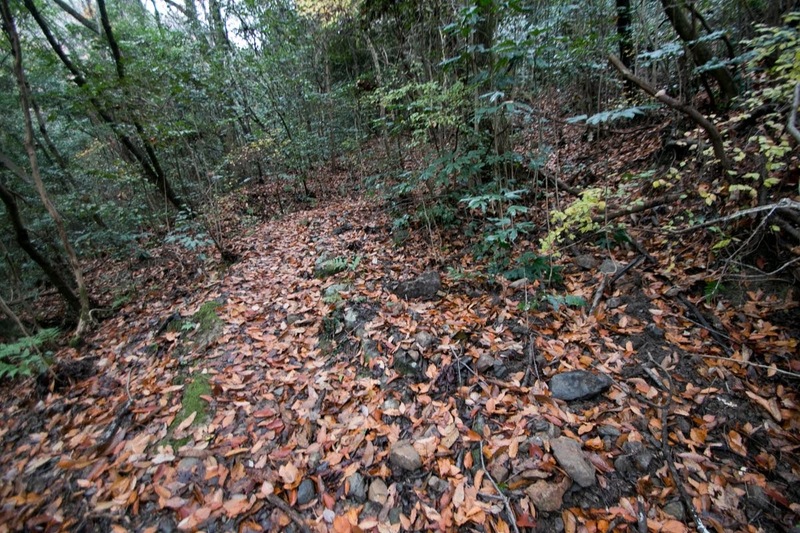 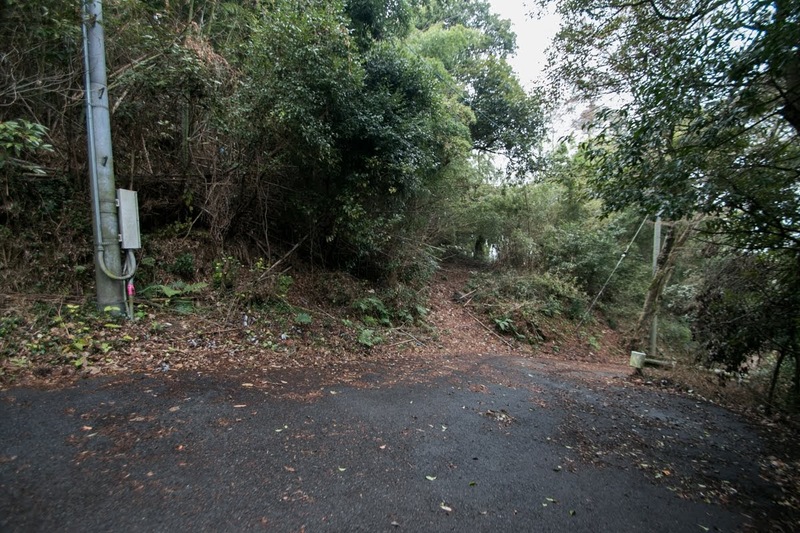 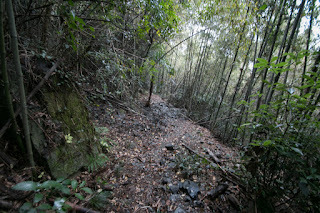 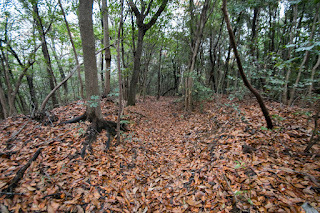 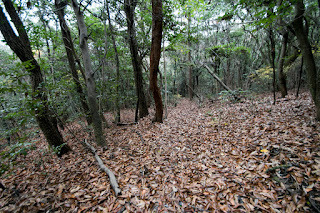 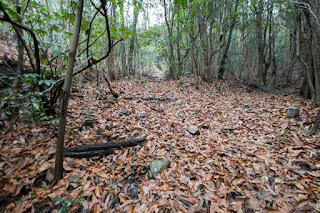 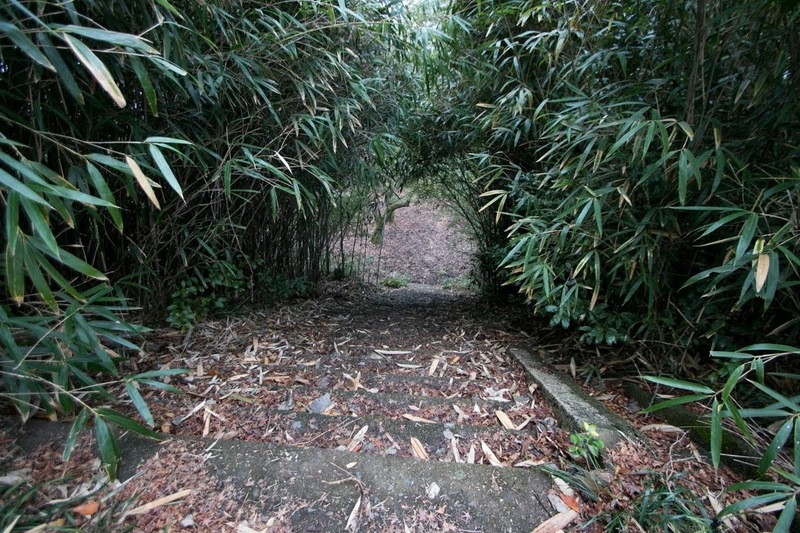 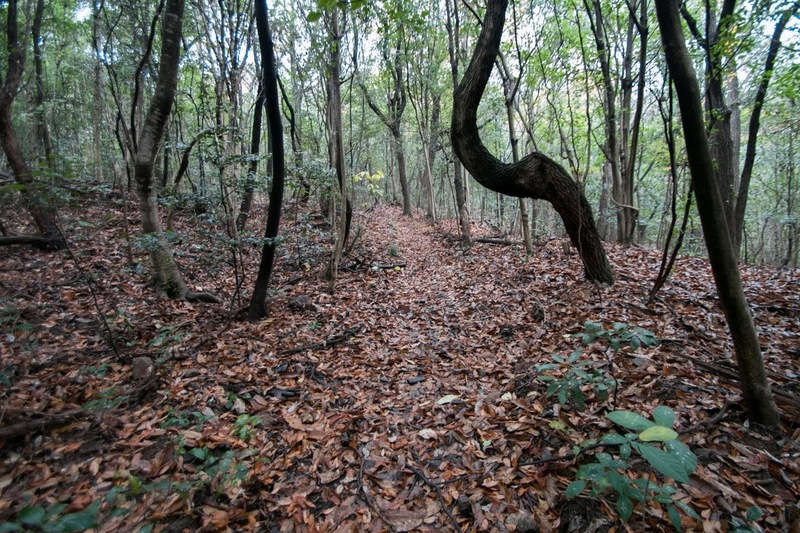 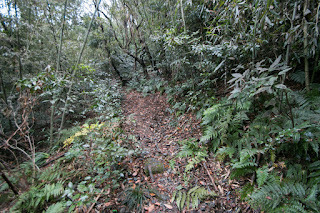 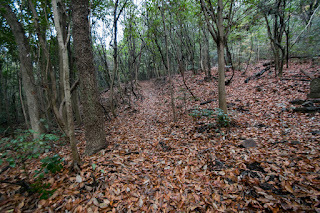 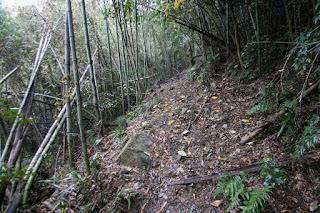 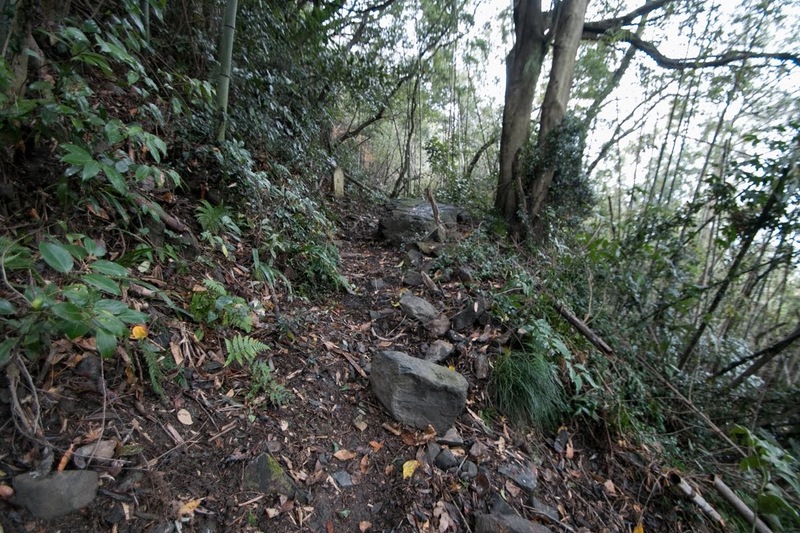 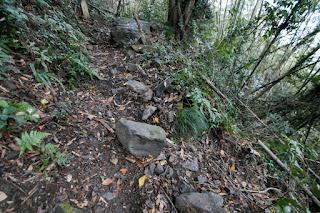 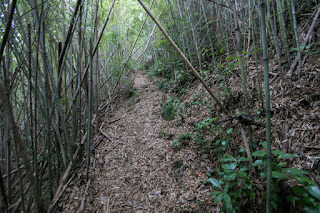 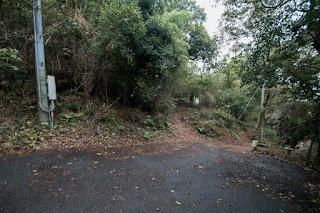 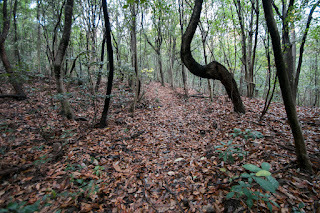 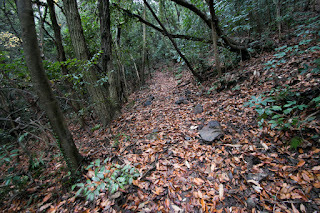 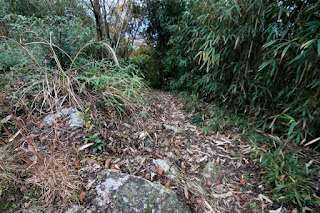 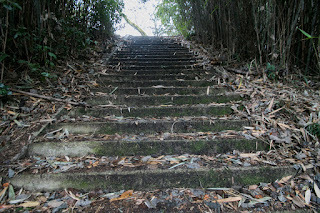 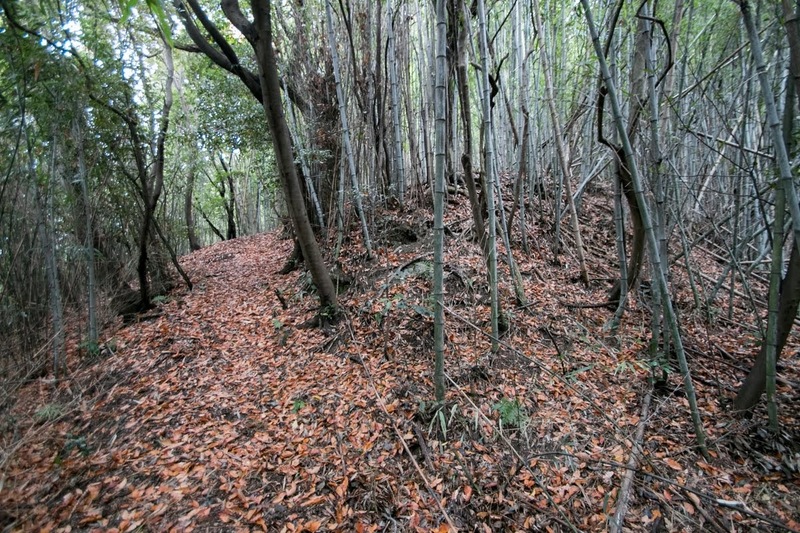 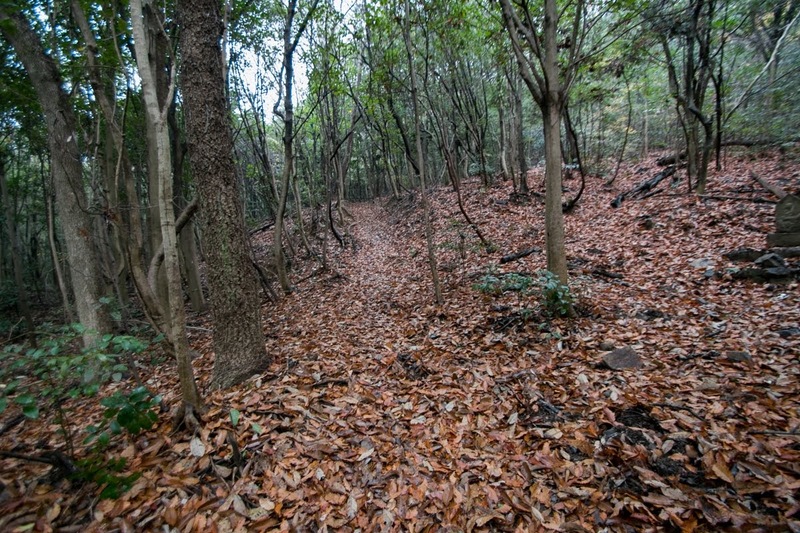 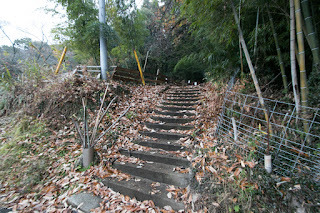 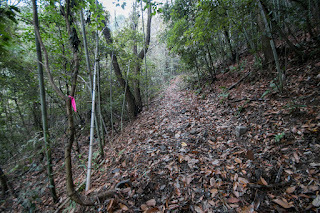 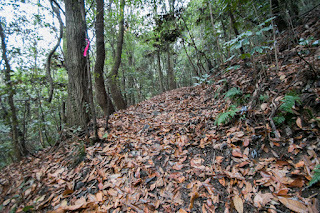 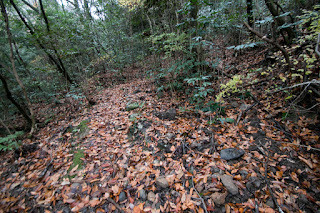 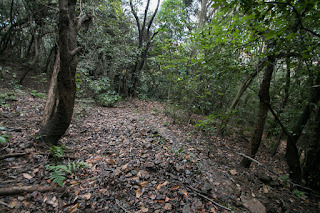 10 minutes walk from JR West Uno-sen line Tsuneyama station to hillside entrance of climbing road. 20 minutes drive from Seto-Chuo Jidoshado Expressway Mizushima interchange. 30 minutes walk from hillside entrance to hilltop castle.